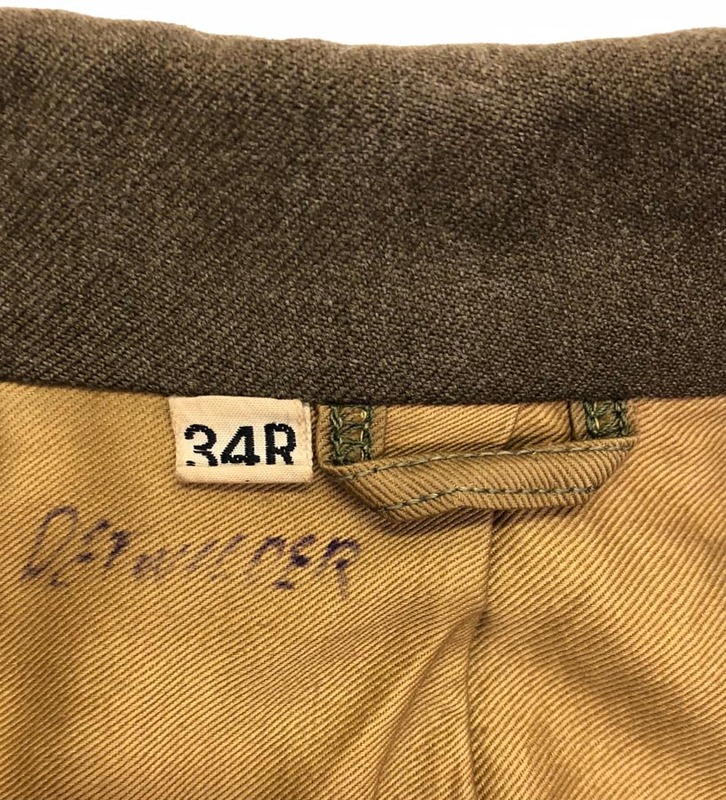 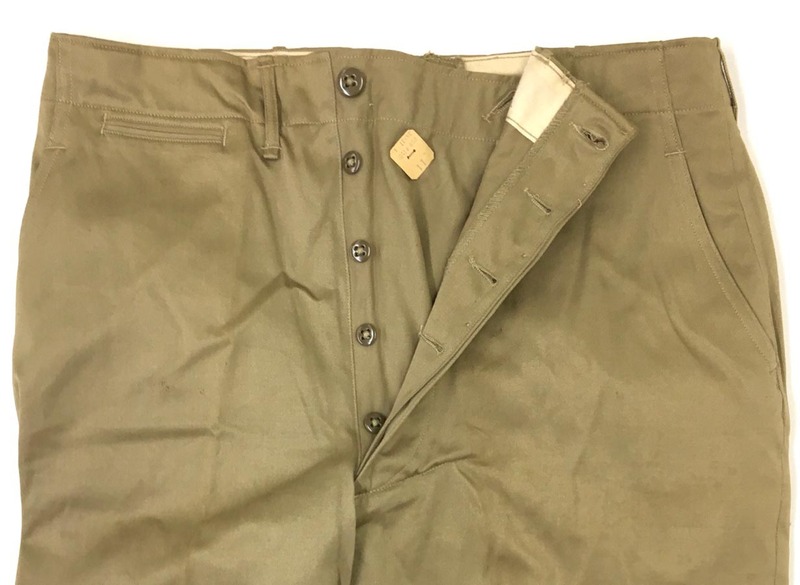 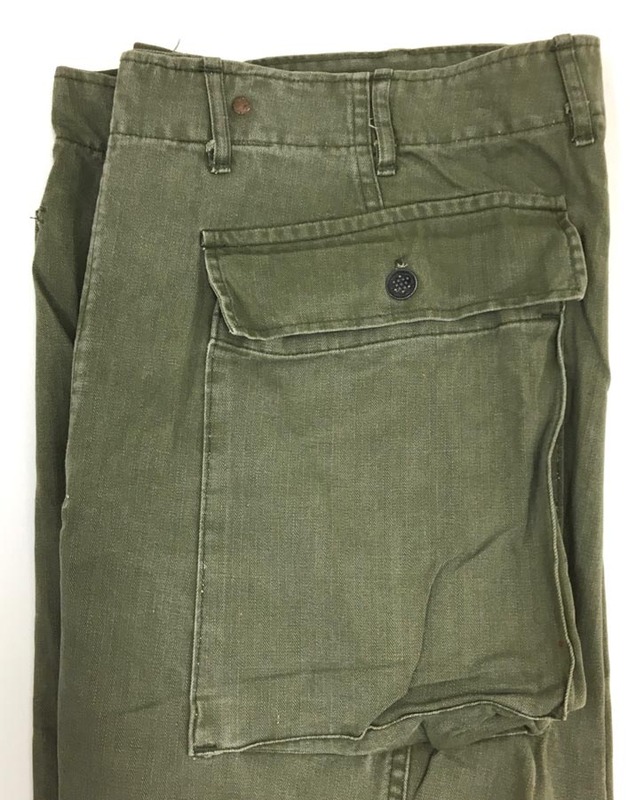 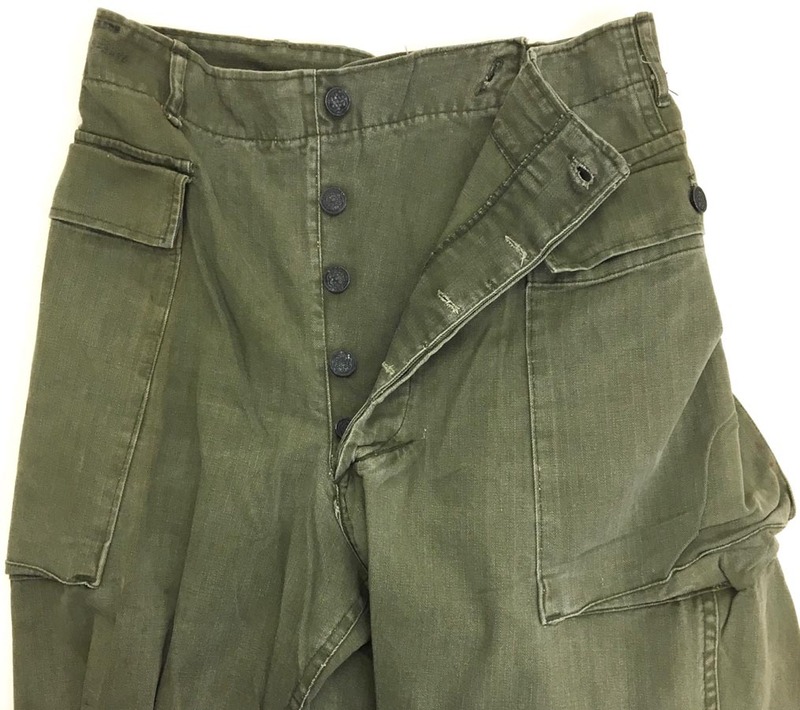 WW2 US Army Khaki Trousers - Unused - 34" X 31"
PHYSICAL DESCRIPTION: These WW2 US Army Khaki Trousers are in excellent unused condition. 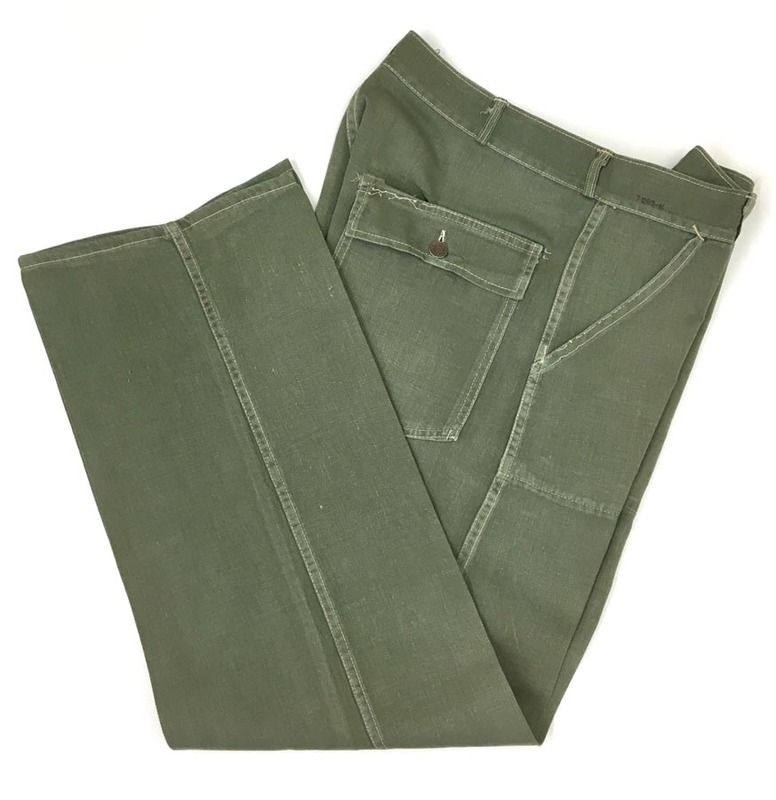 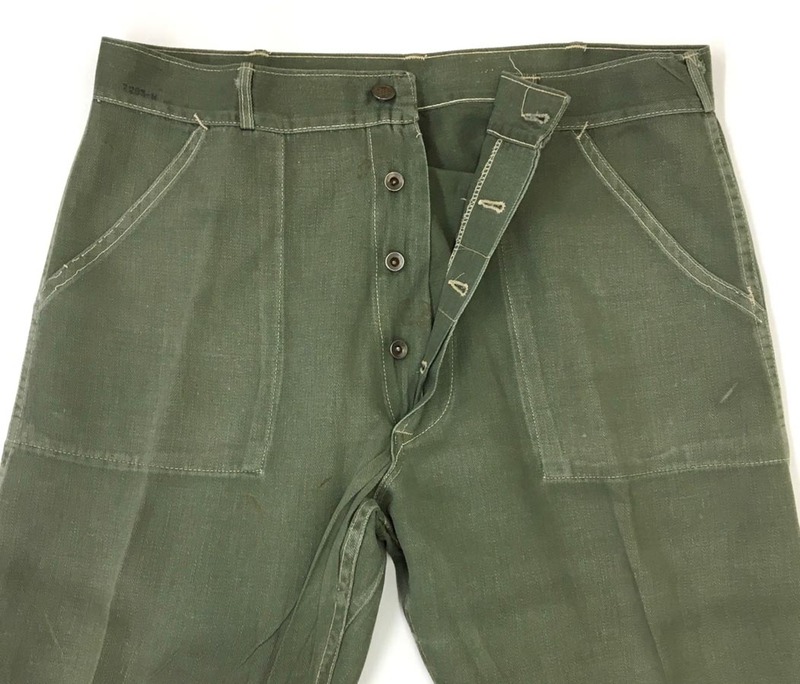 Trousers measure 34 inch waist with a 31 inch inseam. 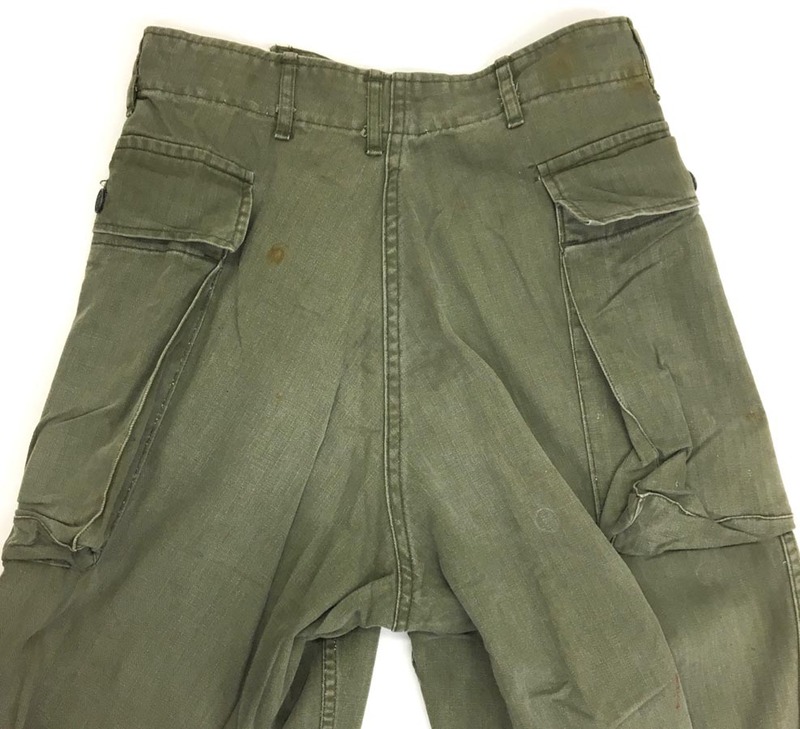 Hard to upgrade on this pair. 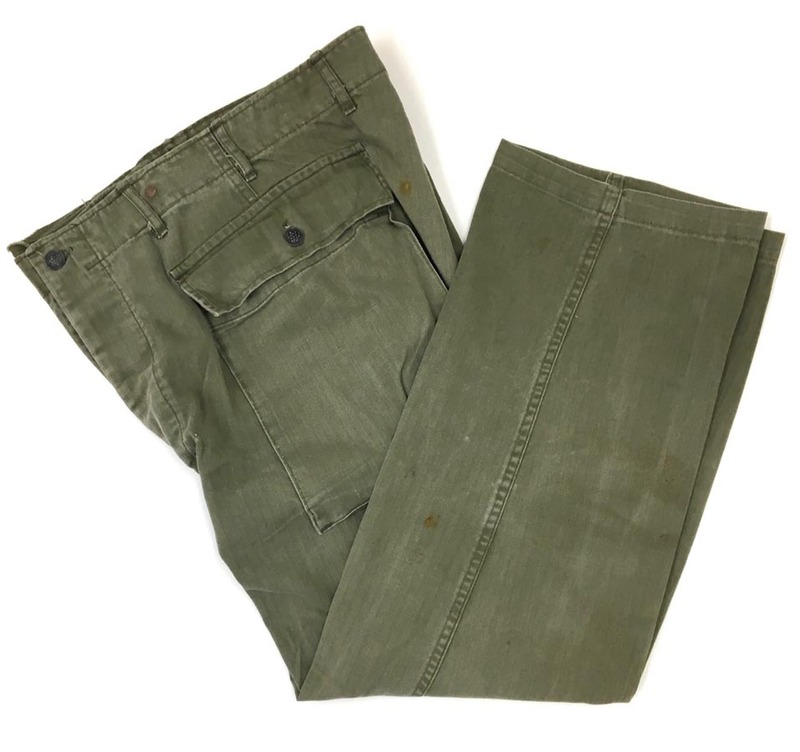 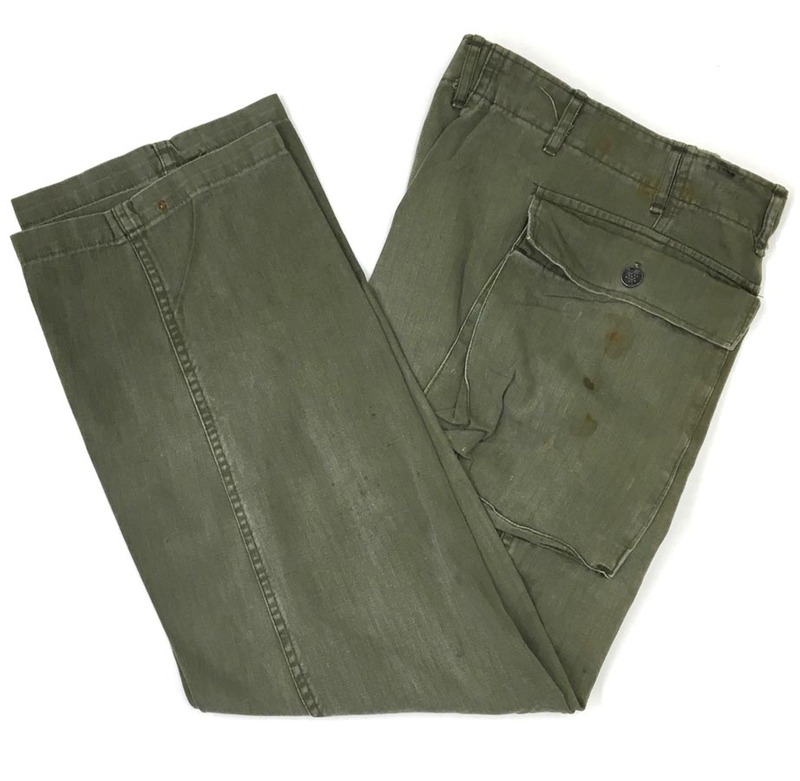 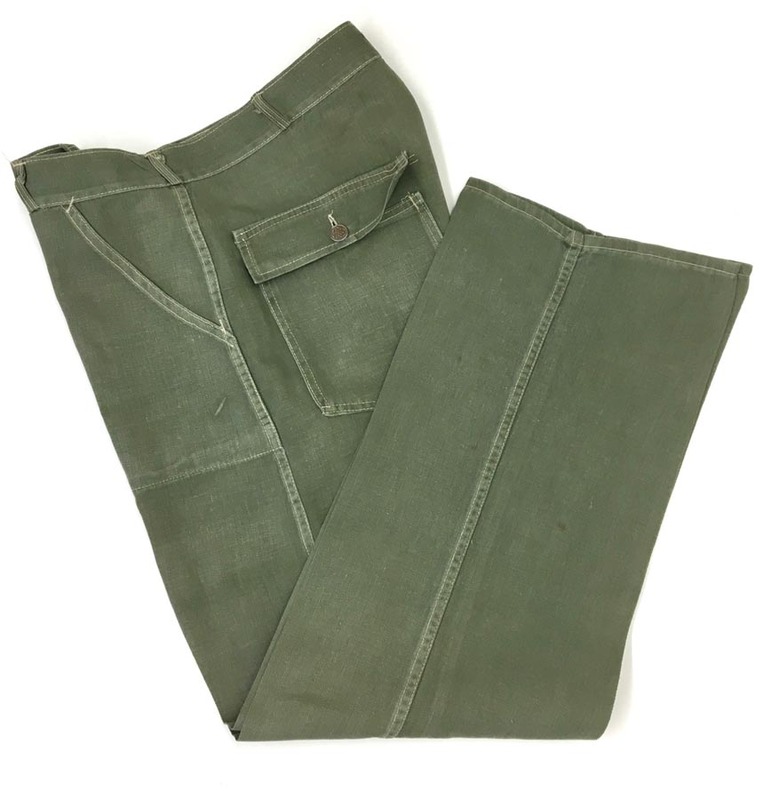 WW2 US Army HBT Trousers - 34" X 31 1/2"
PHYSICAL DESCRIPTION: This pair of WW2 US Army HBT Trousers are in nice condition with no holes . 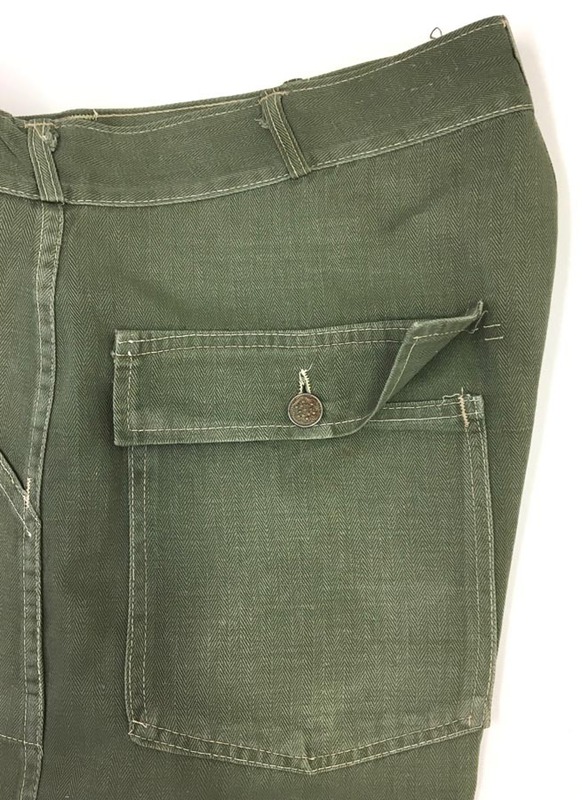 Back pockets need restitched. 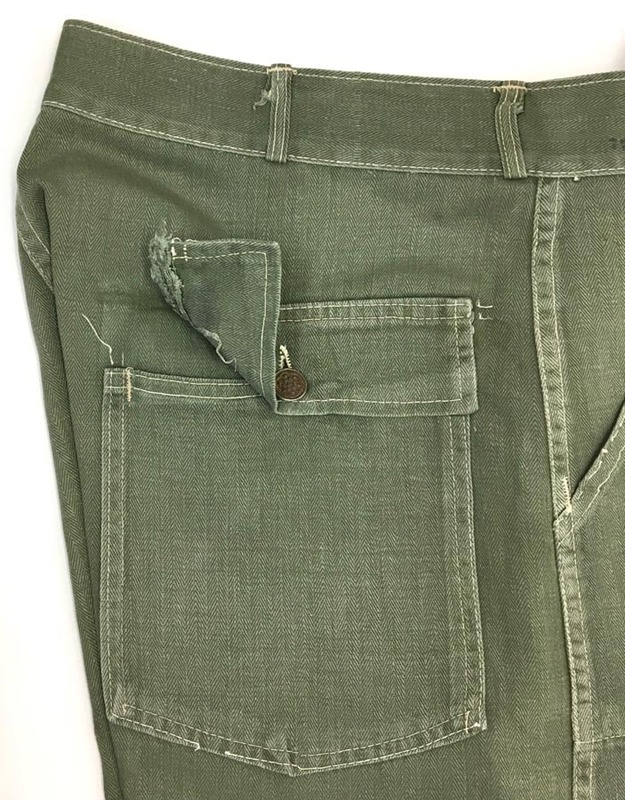 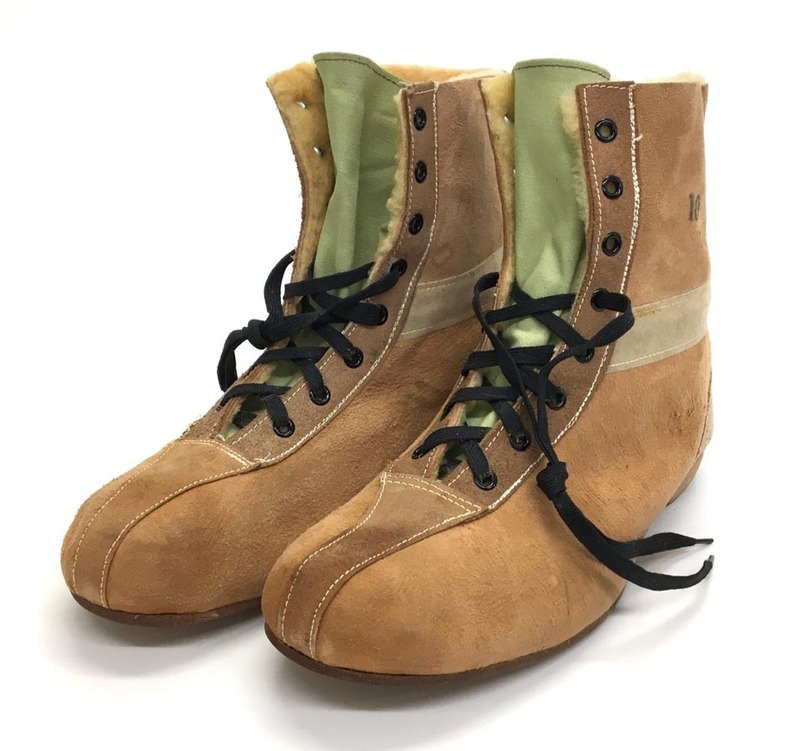 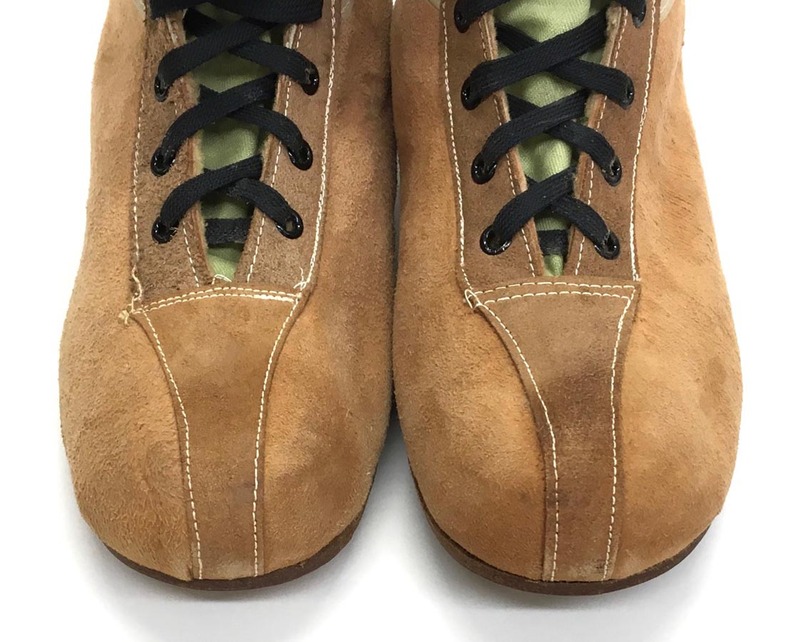 They are not torn or damaged , the stitching has just come undone. 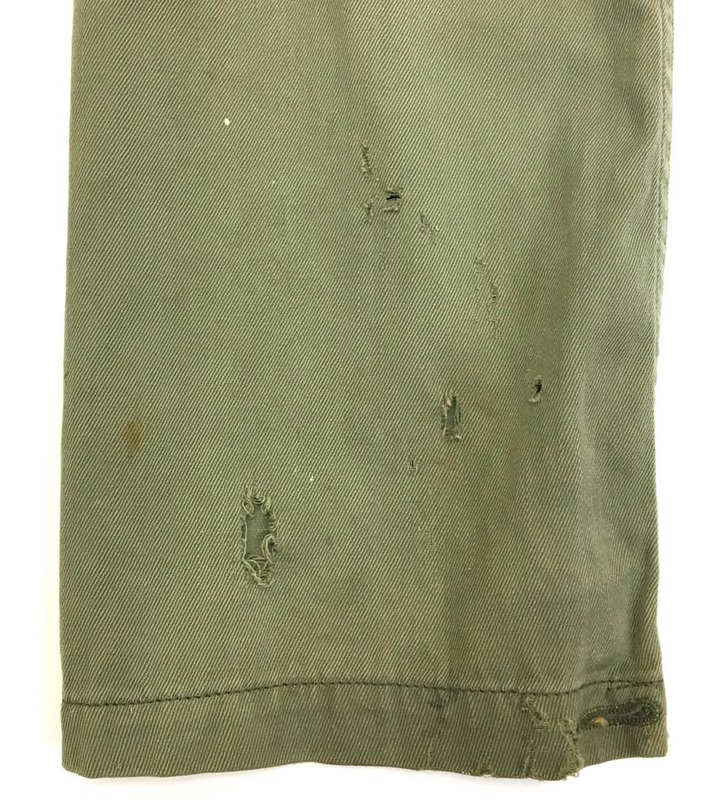 This would be an easy repair. 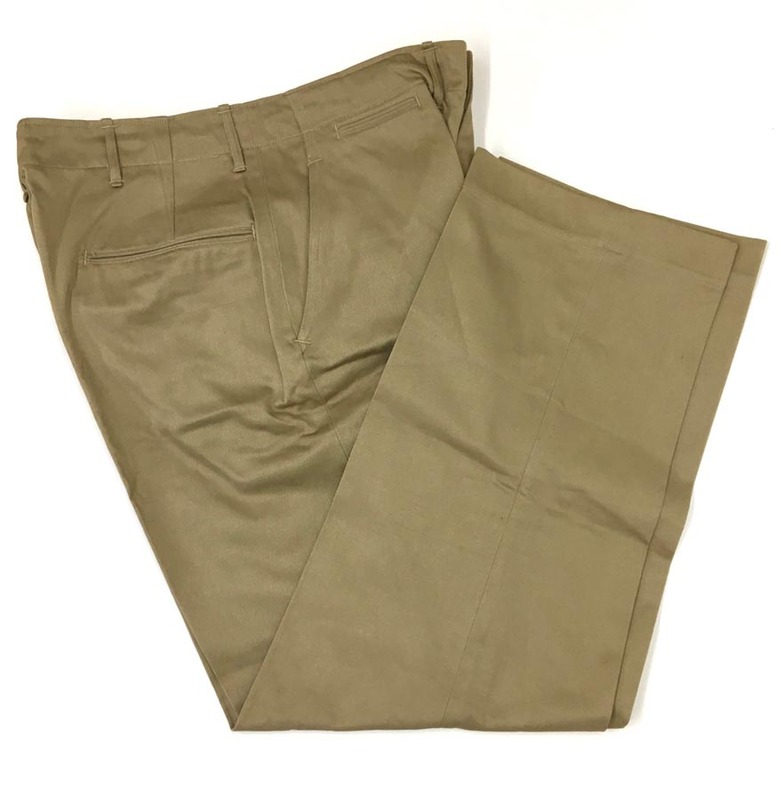 Trousers measure 34 inch waist with a 31 1/2 inch inseam. 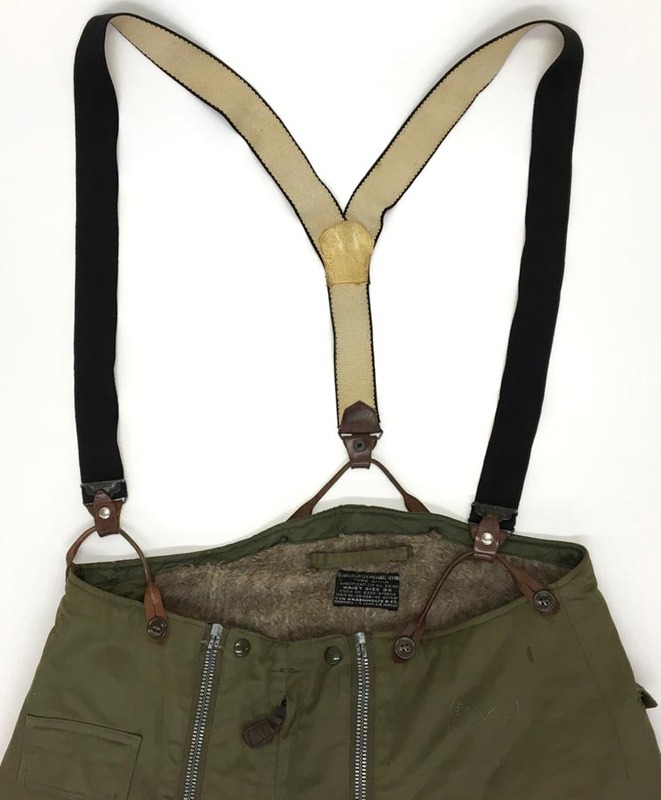 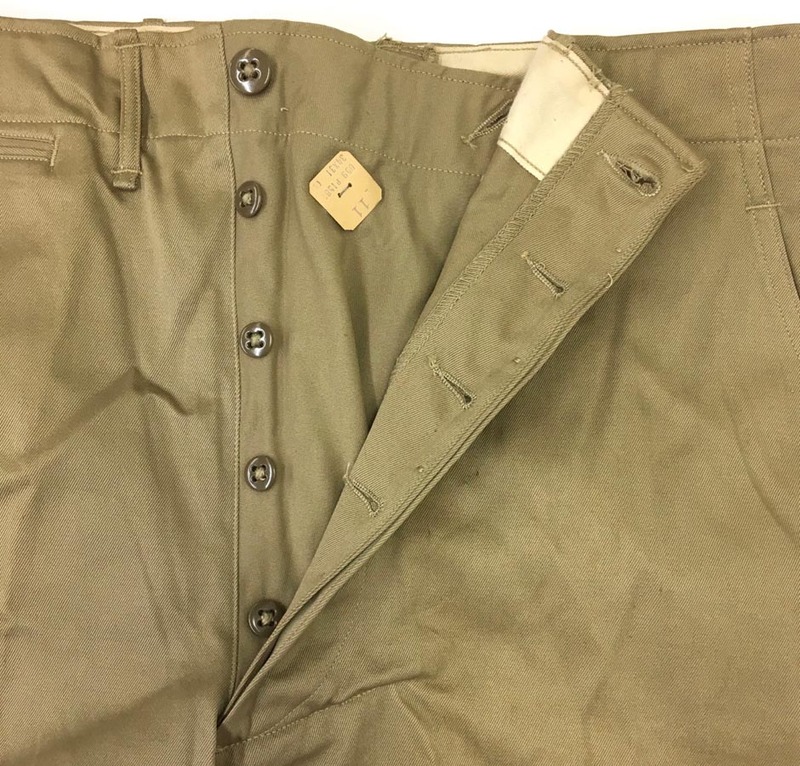 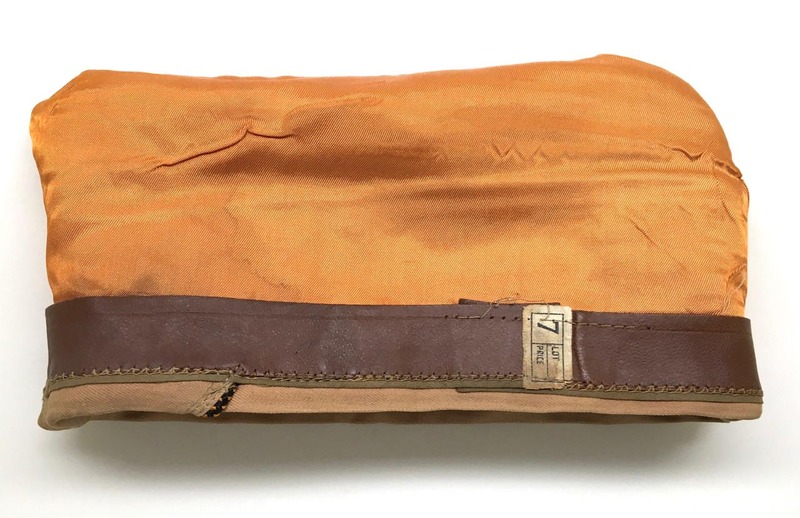 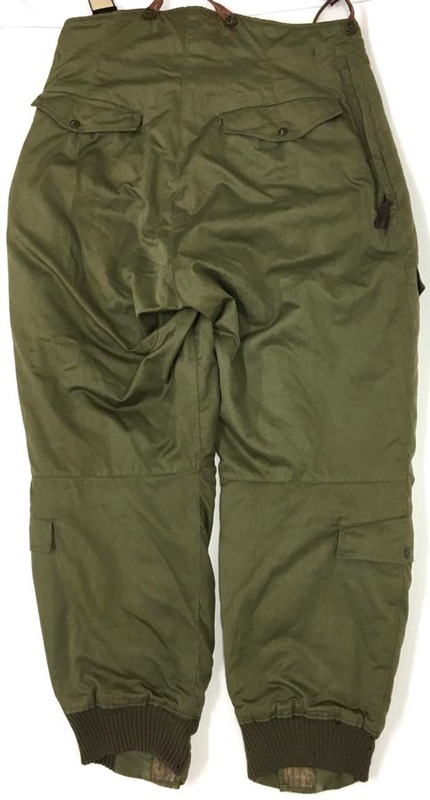 WW2 US Army 2nd Model HBT Trousers - 28" X 29"
PHYSICAL DESCRIPTION: This WW2 US Army 2nd Model HBT Trousers are in nice condition with no holes. 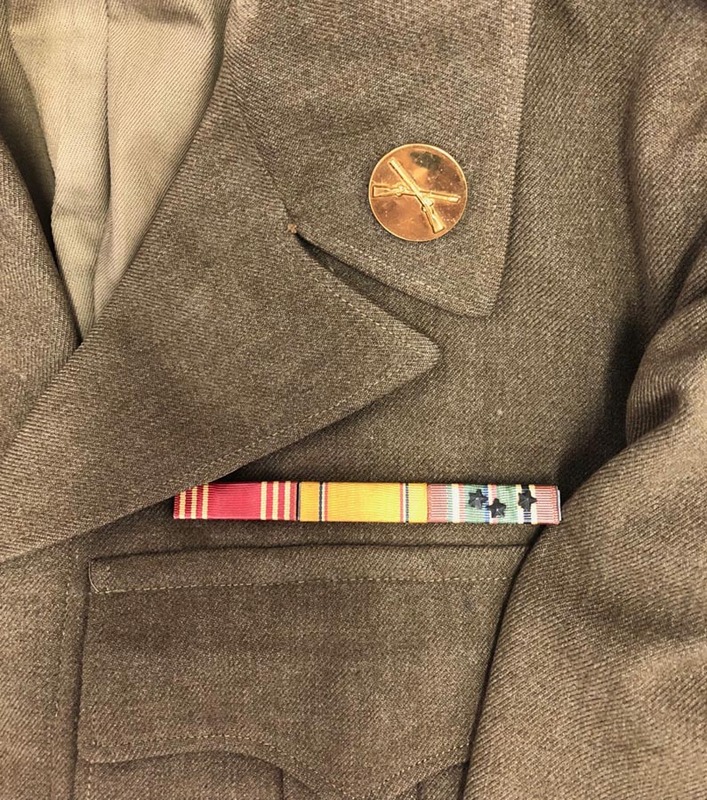 All buttons are present. 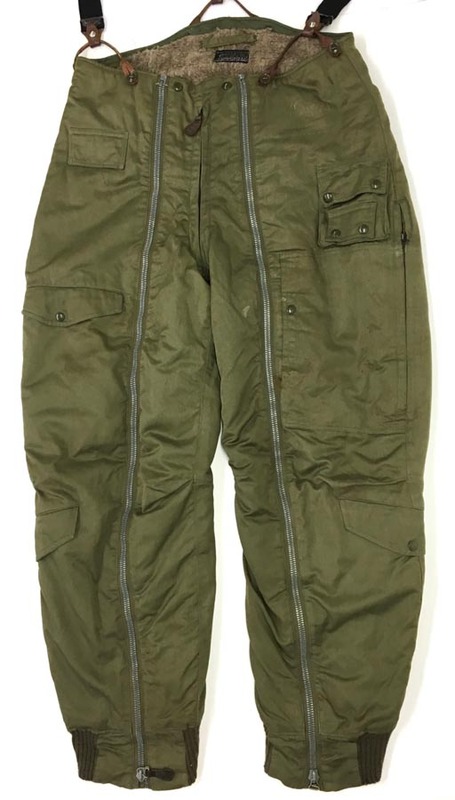 No freying to bottom of trousers. 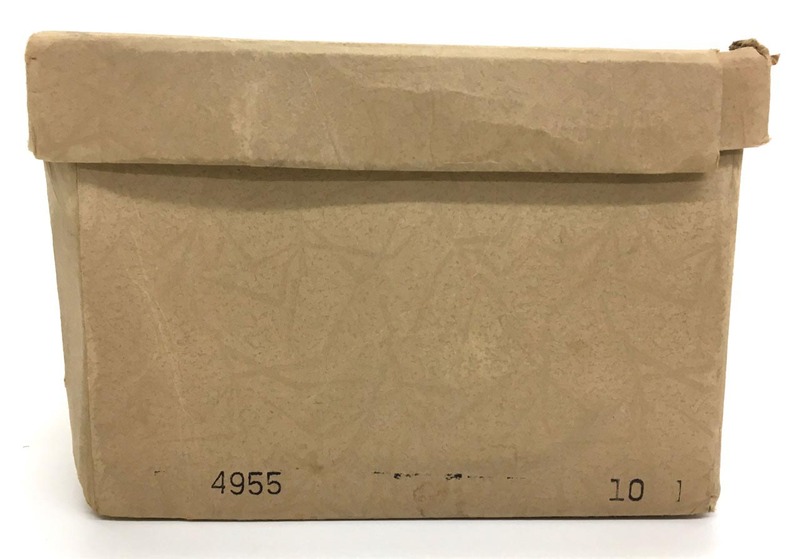 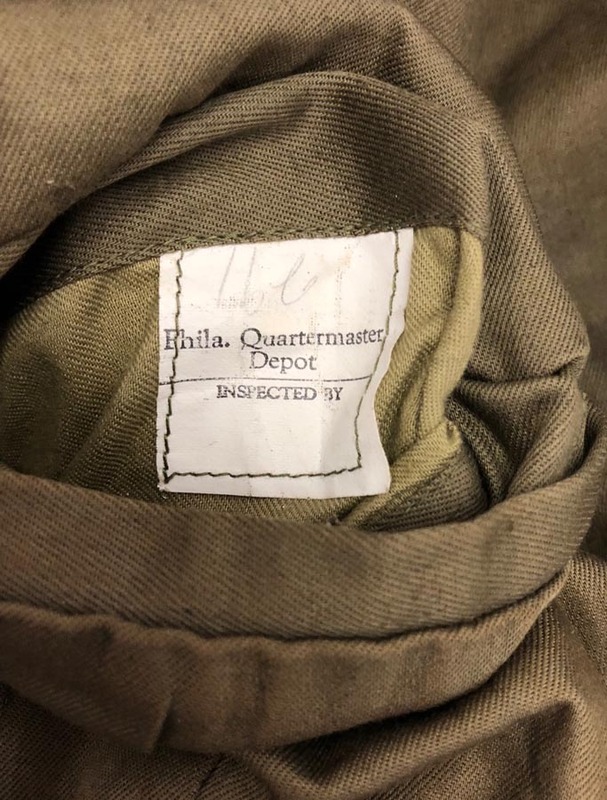 No size tag or quartermaster tag. 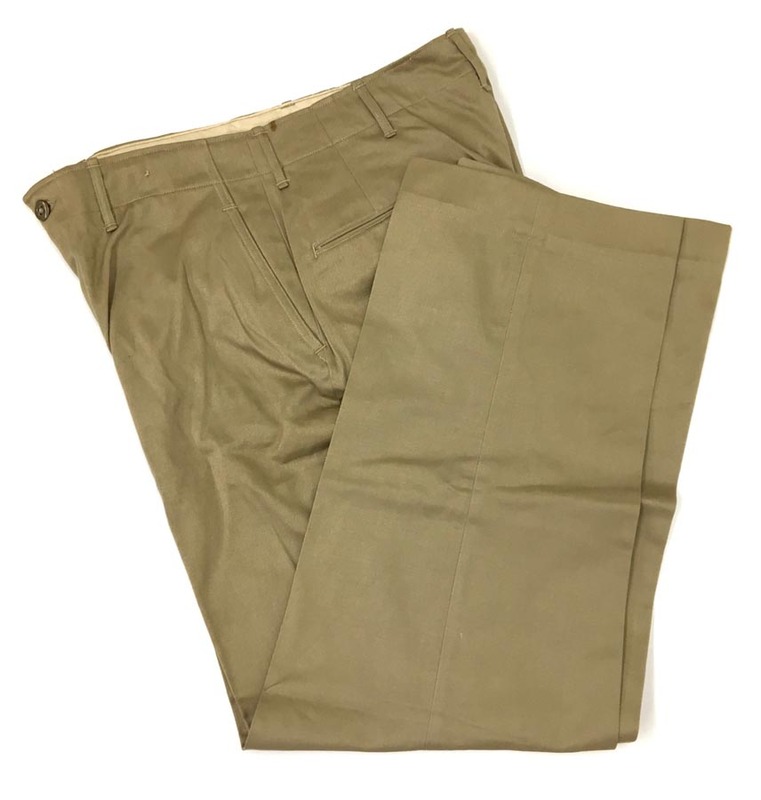 Trousers measure 28 inch waist by 29 inch inseam. 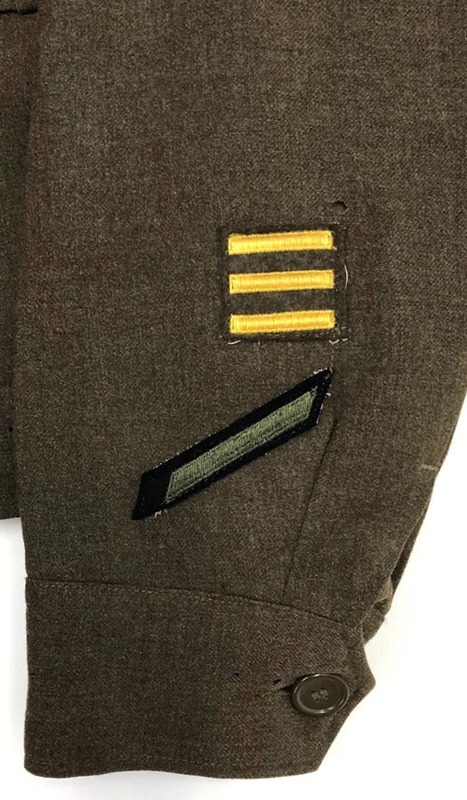 About 6 1/2 inches of the inside of the waistband towards the front has come unstitched. 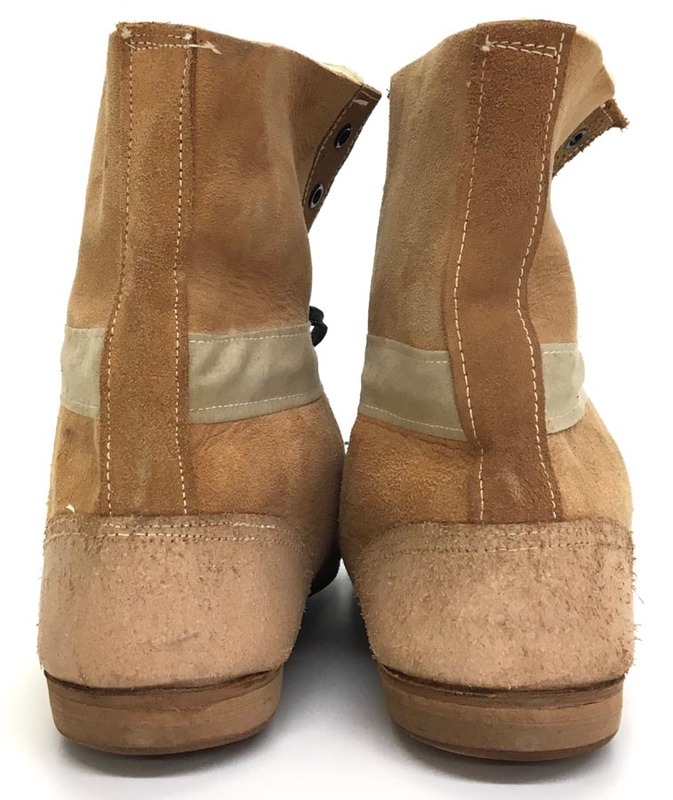 This would be an easy repair. 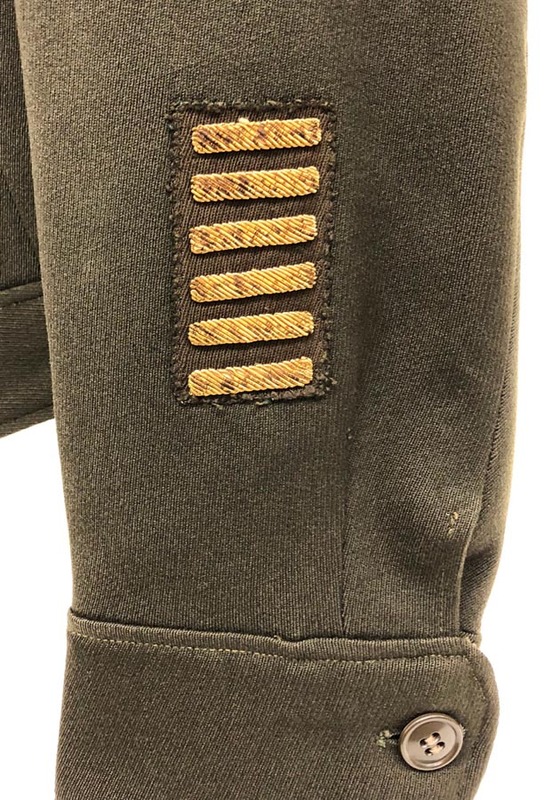 It is not a tear just the stitching. 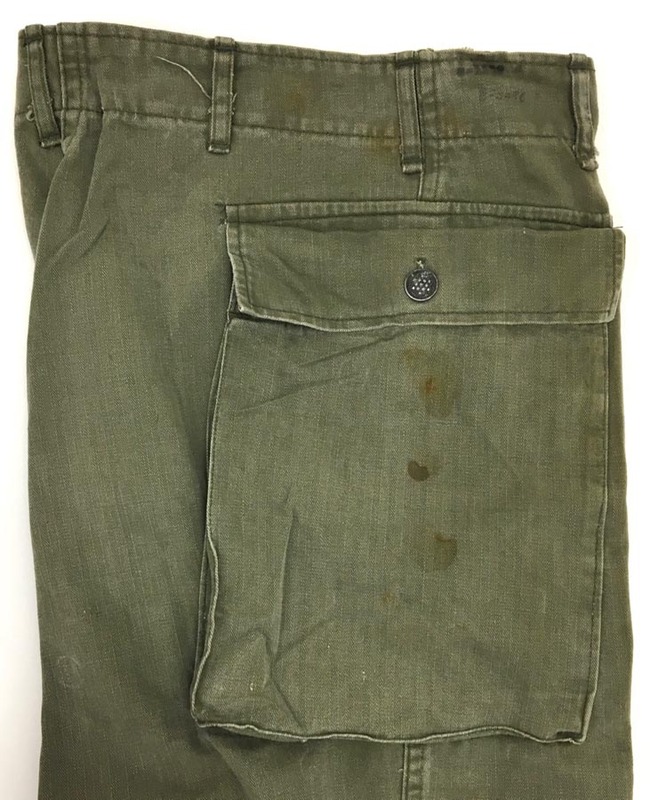 There are a couple of small rust spot stains. 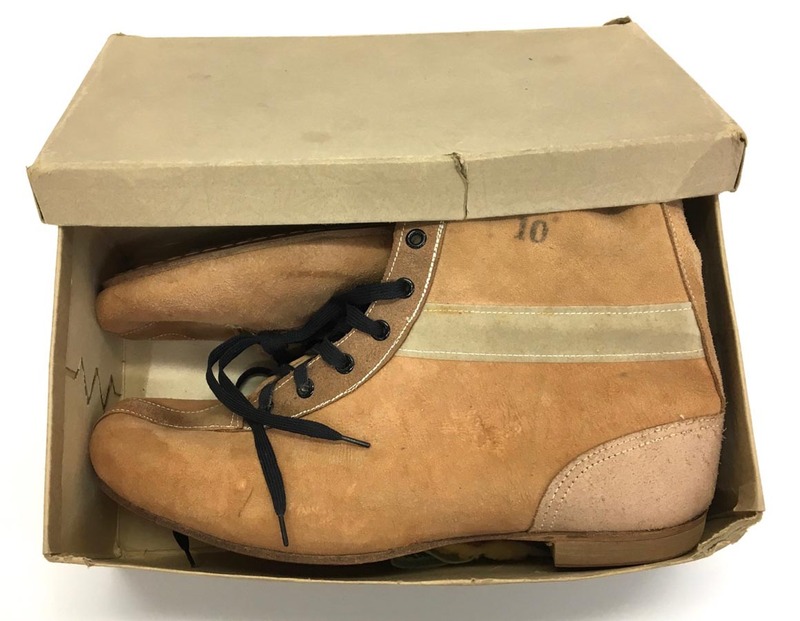 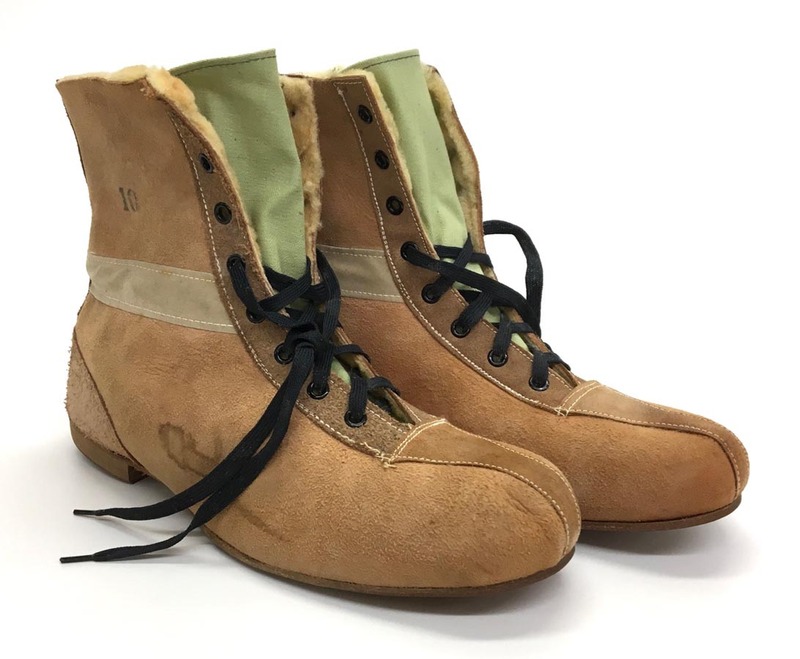 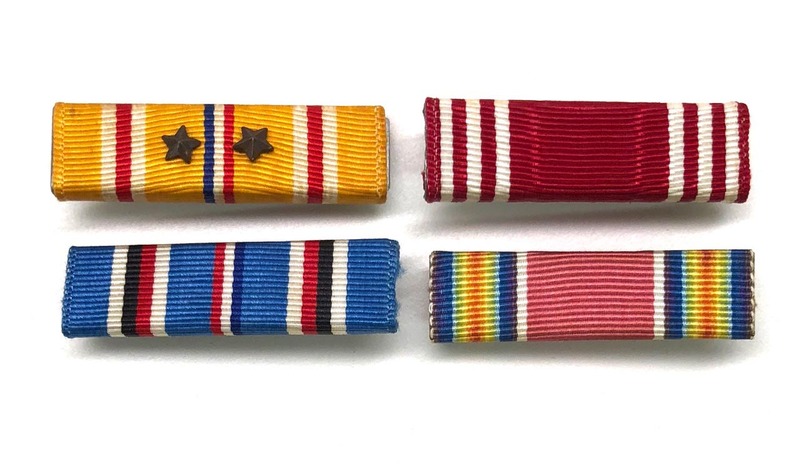 Nice solid pair that would be great for display. 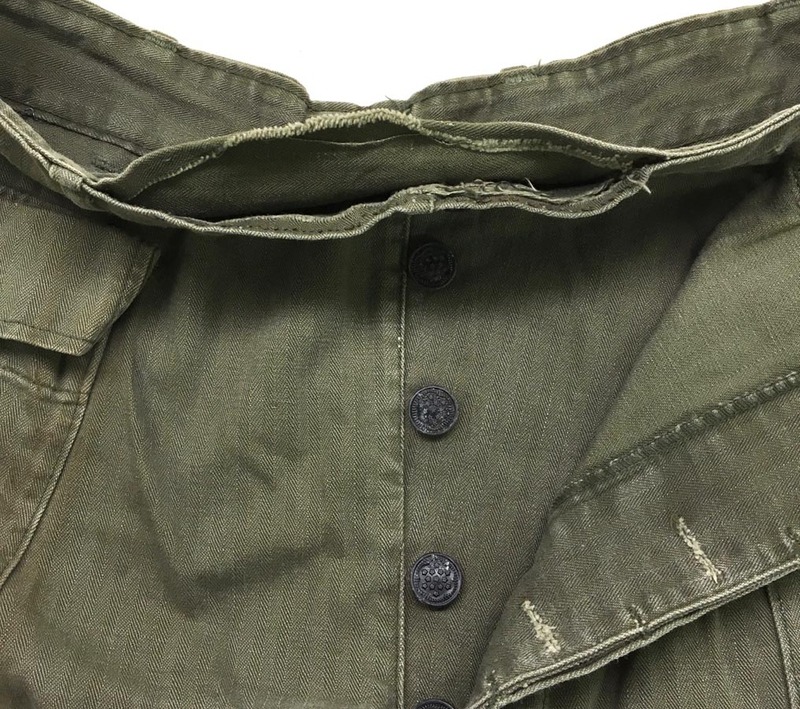 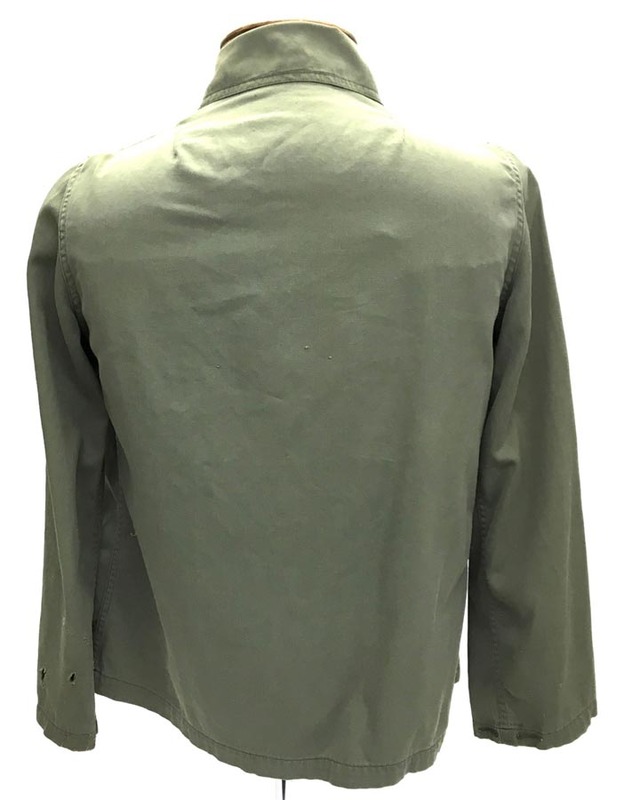 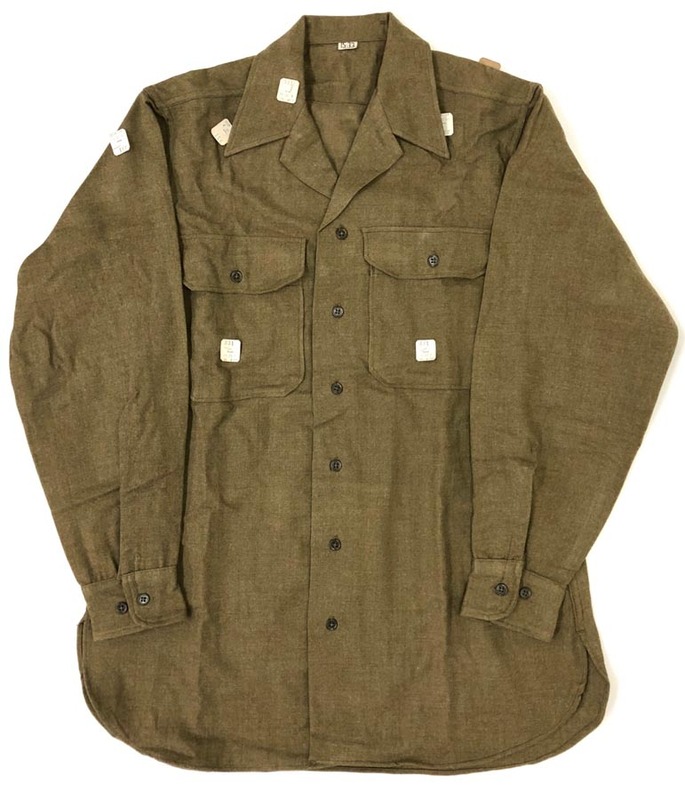 PHYSICAL DESCRIPTION: This original WW2 US EM/NCO Summer Shirt is in mint unused condition. 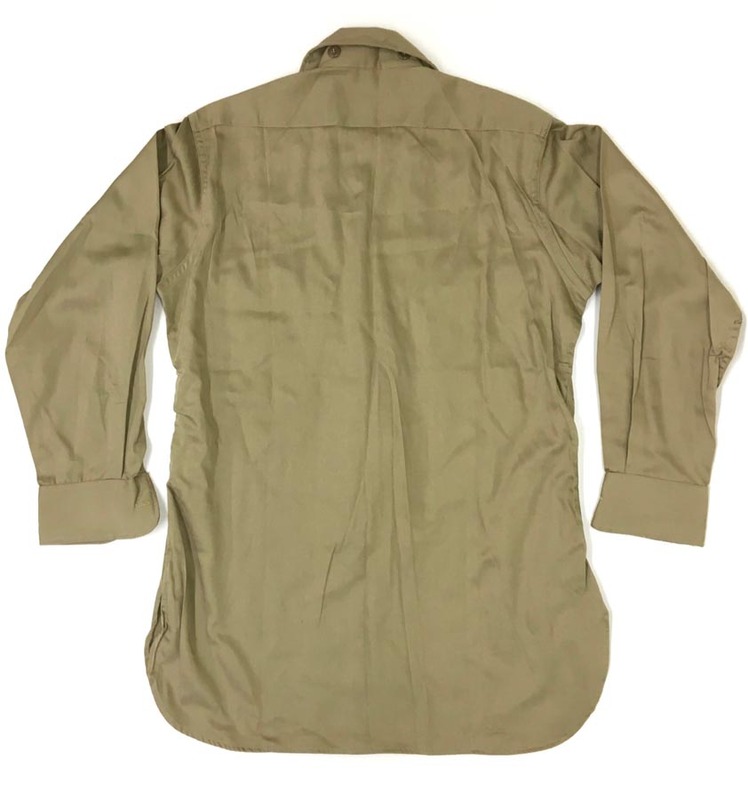 Shirt has a gas flap and two buttons behind collar. 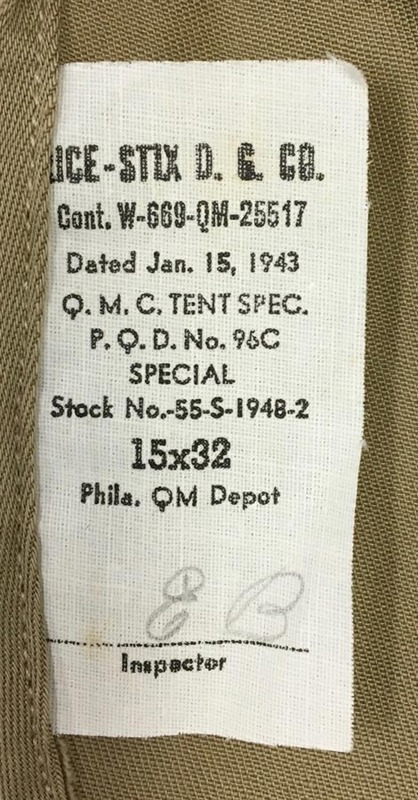 Shirt is a size 15X32. 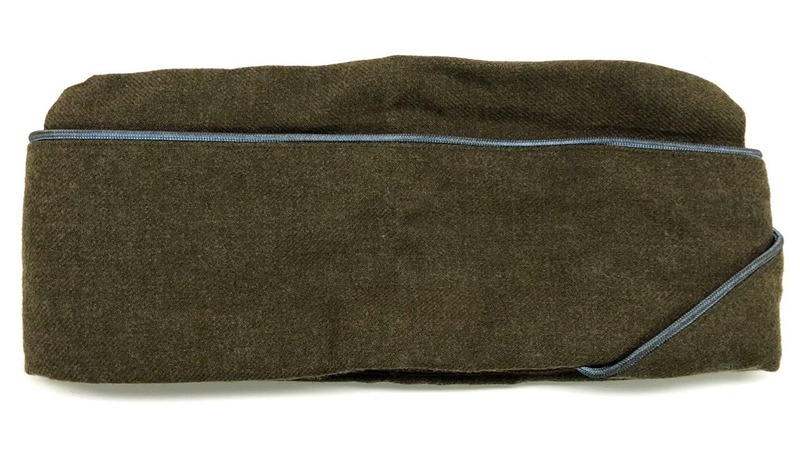 Measurements are: neck 15", chest 32", sleeve length 23" and length is 32 1/2". 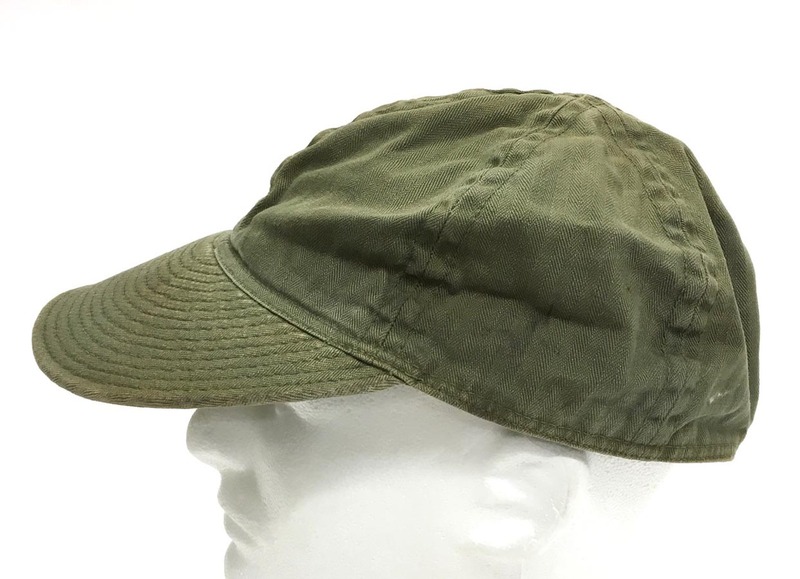 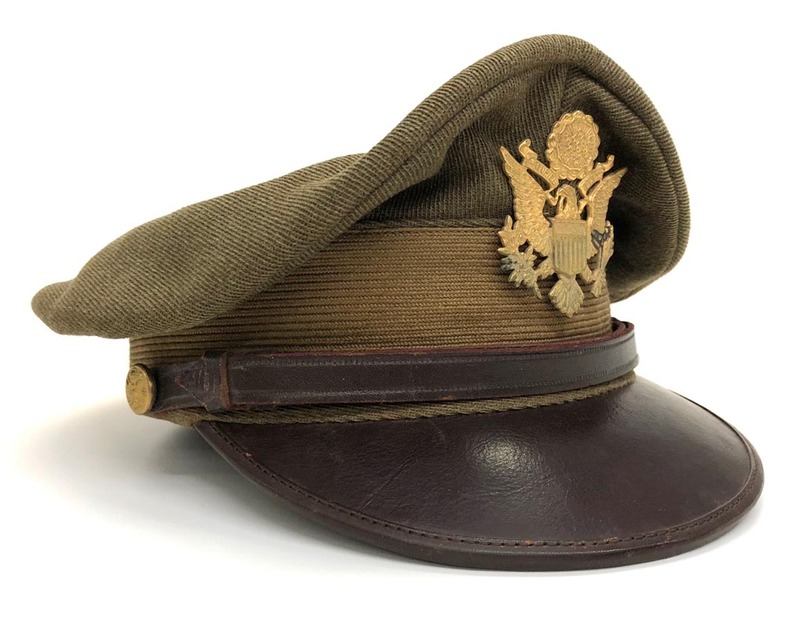 PHYSICAL DESCRIPTION: This WW2 U.S. Army Infantry Overseas Cap is in nice condition having one moth hole to back seam area. 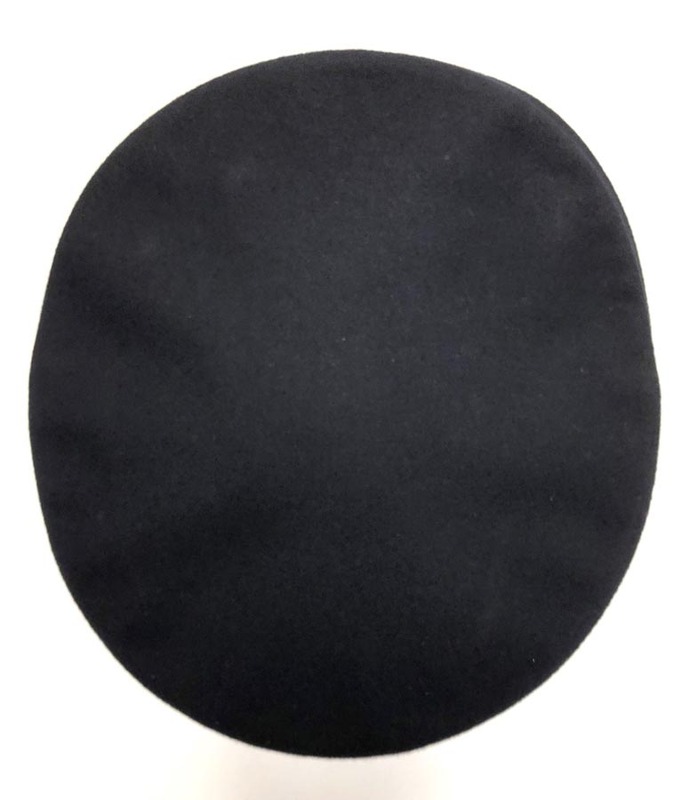 Hole is 3/8 inch across. 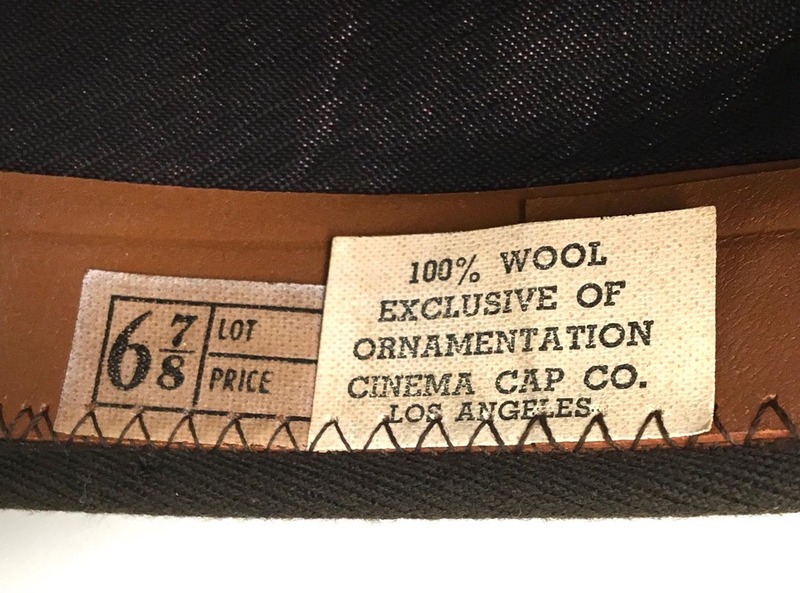 Cap has a size label that looks like it reads 7 1/8. 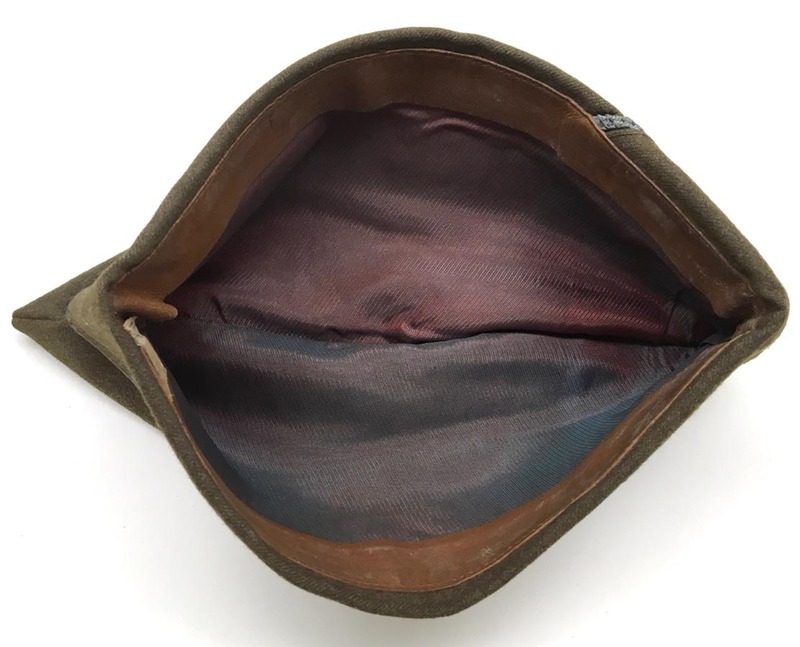 Leather sweatband is nice with no damage. 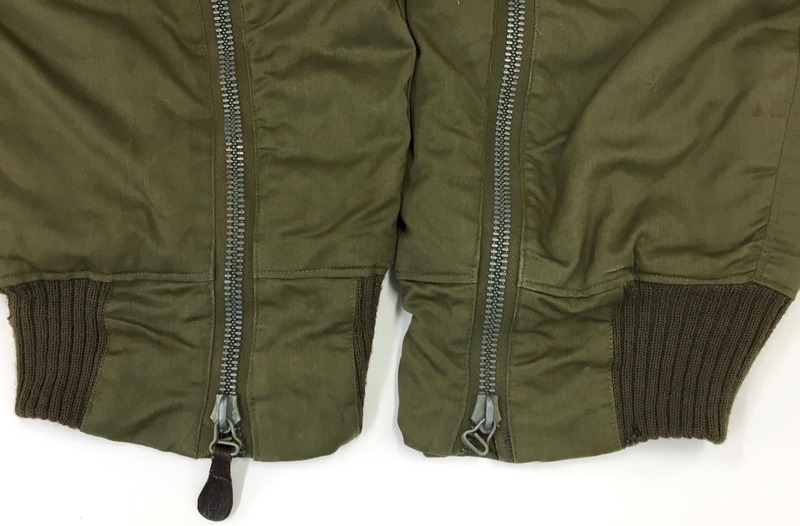 Silk like lining is real nice with no damage. 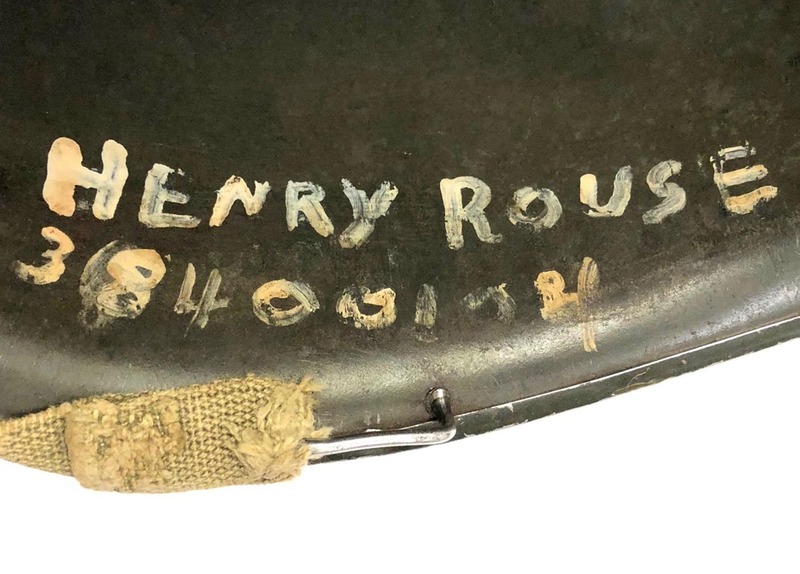 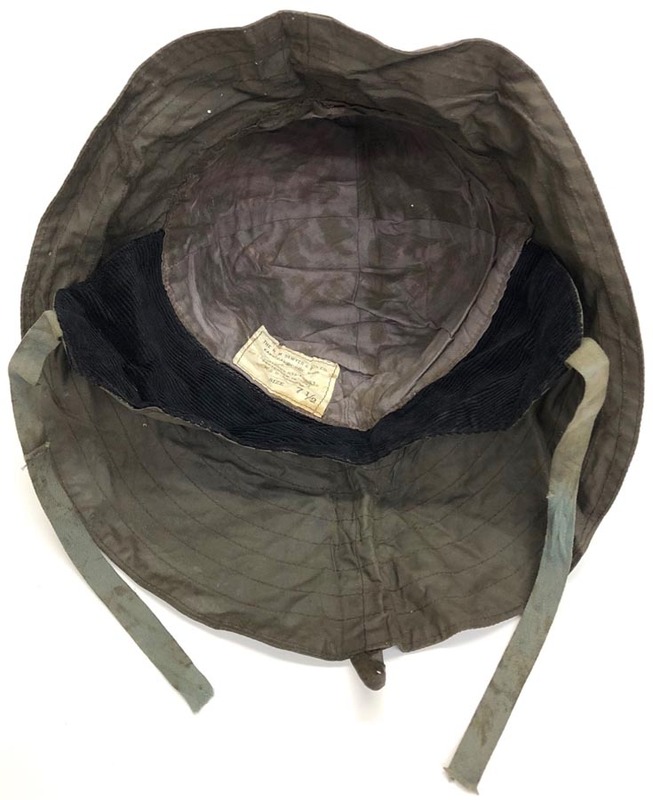 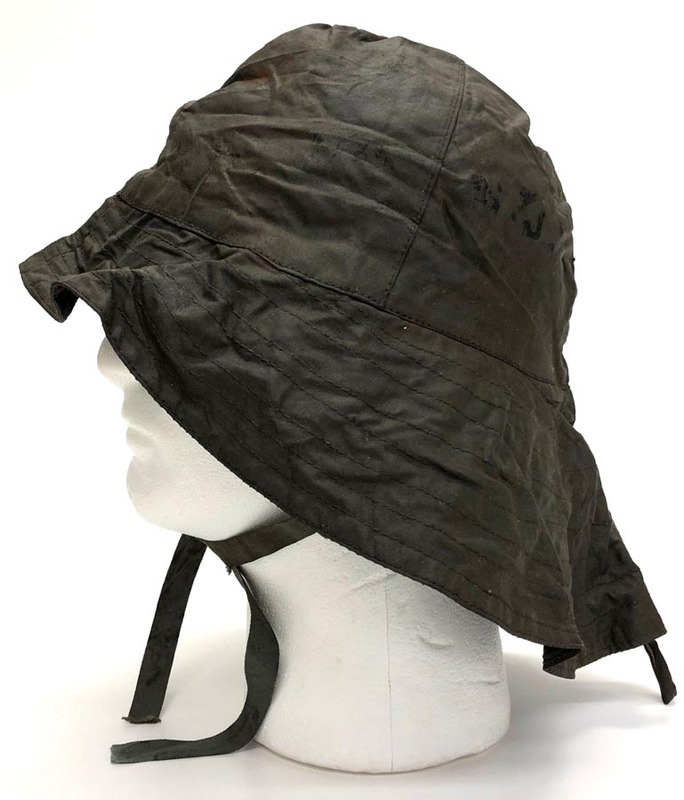 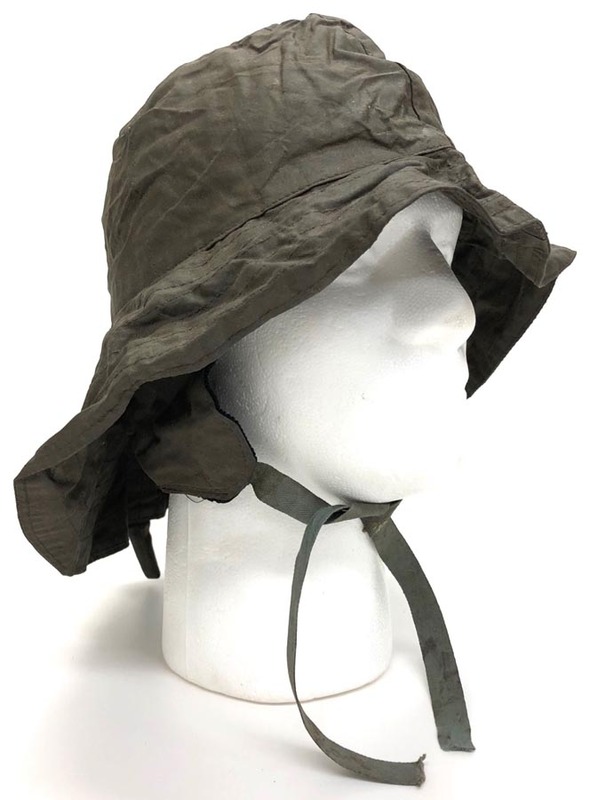 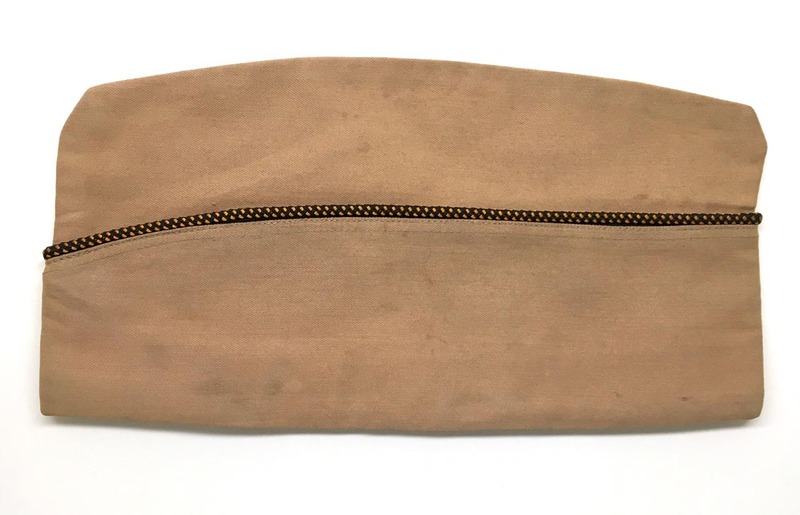 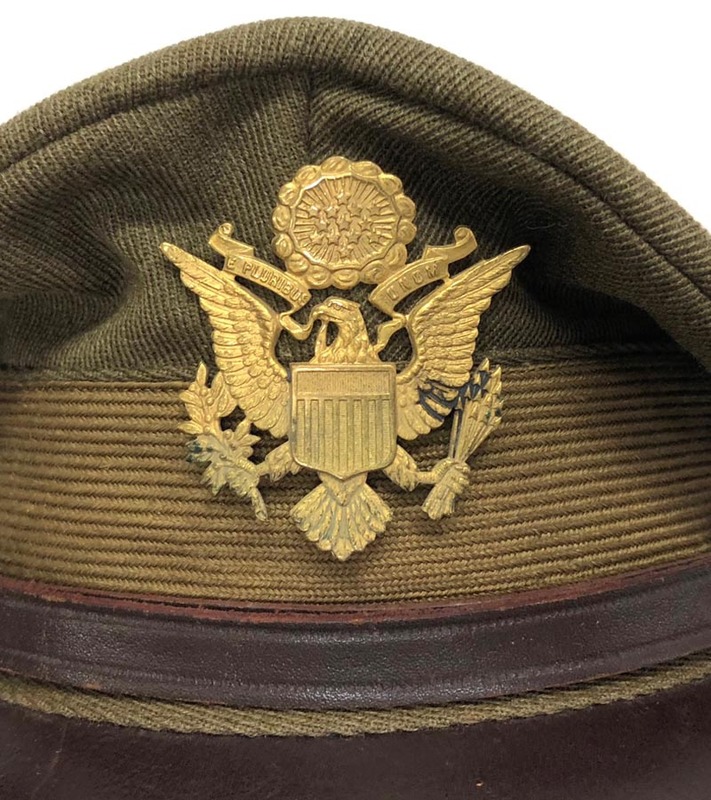 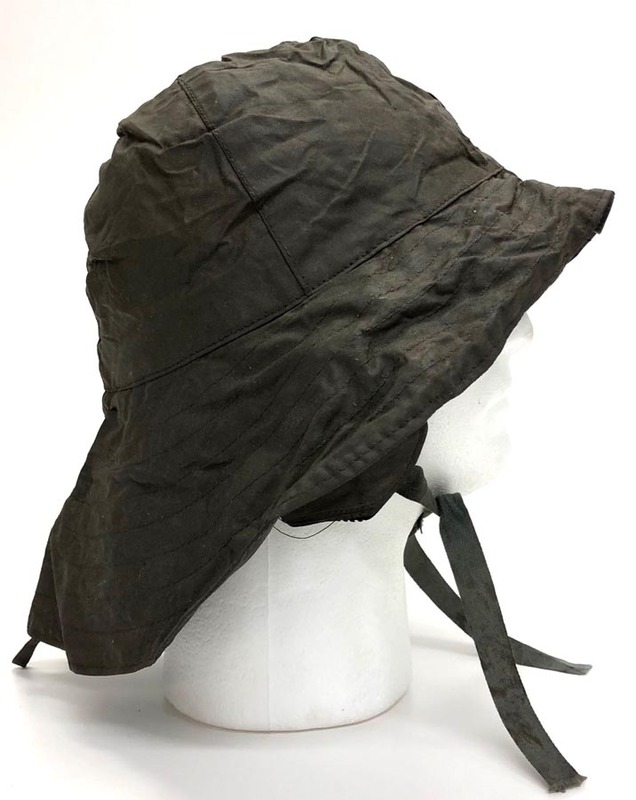 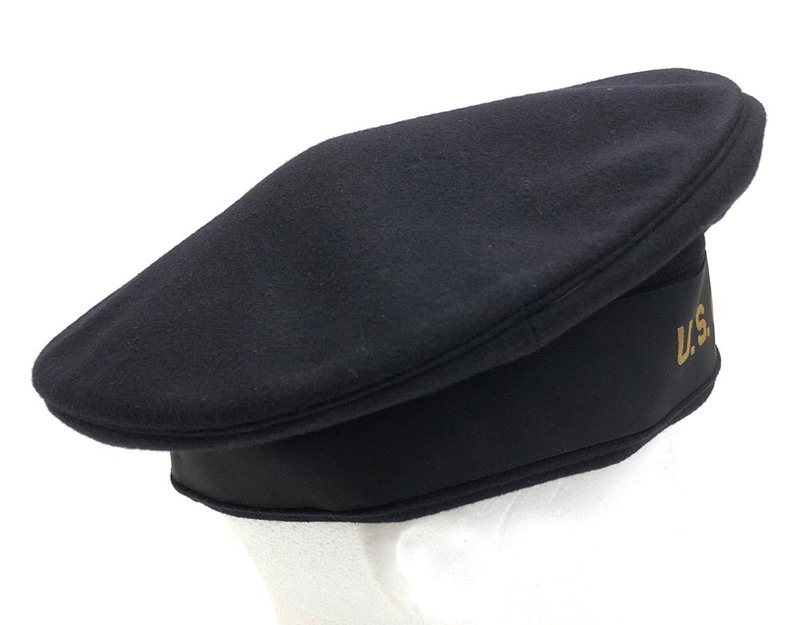 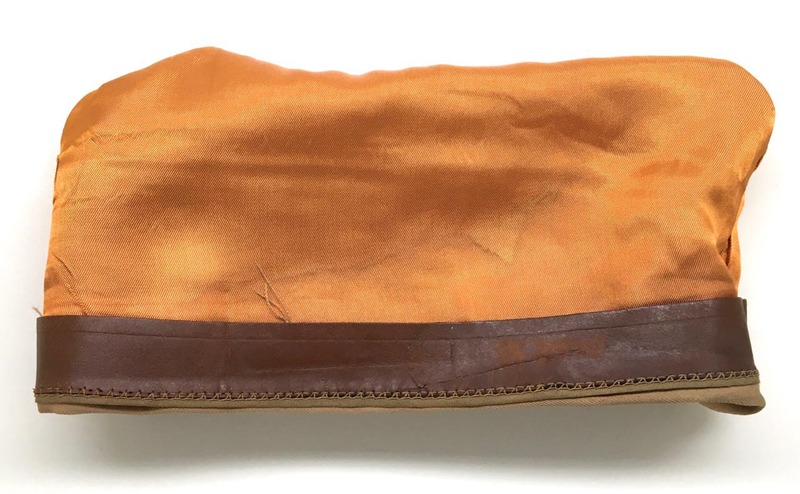 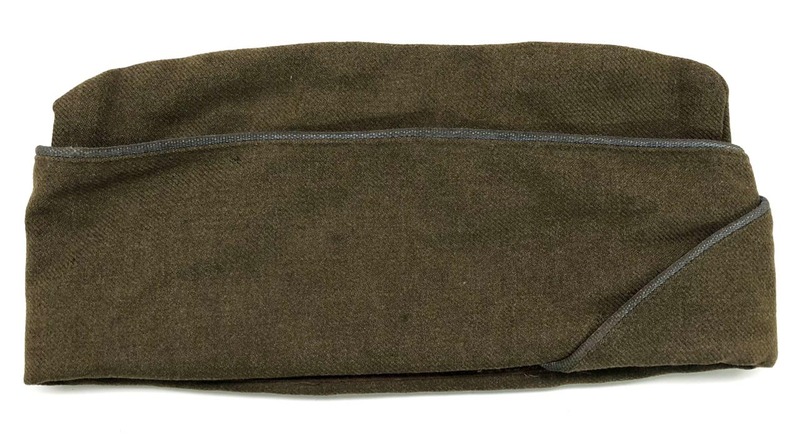 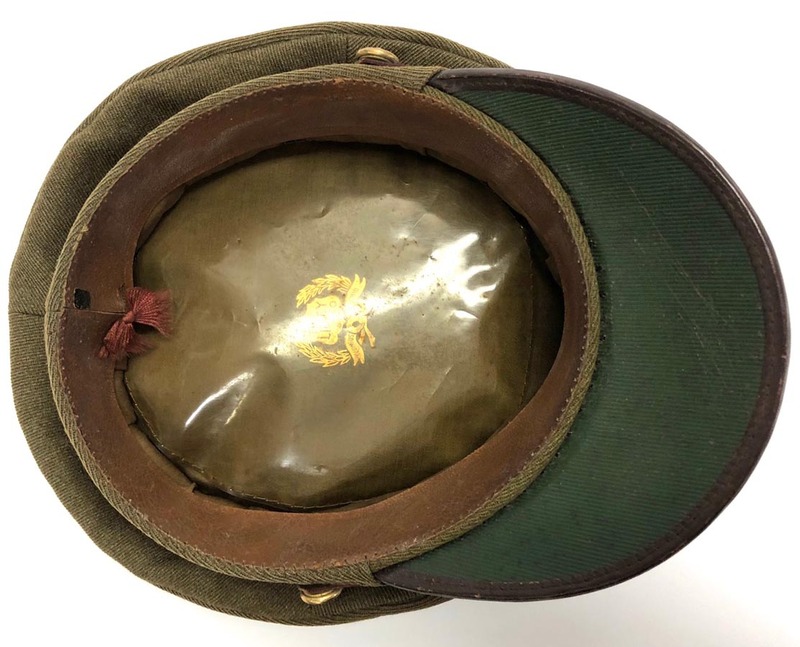 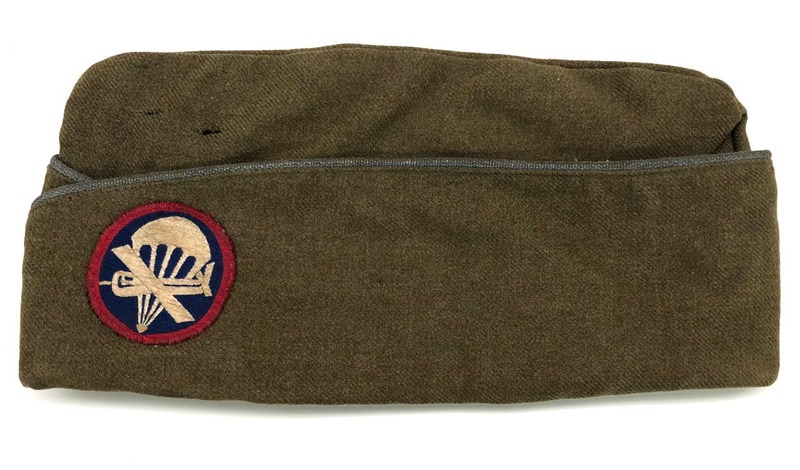 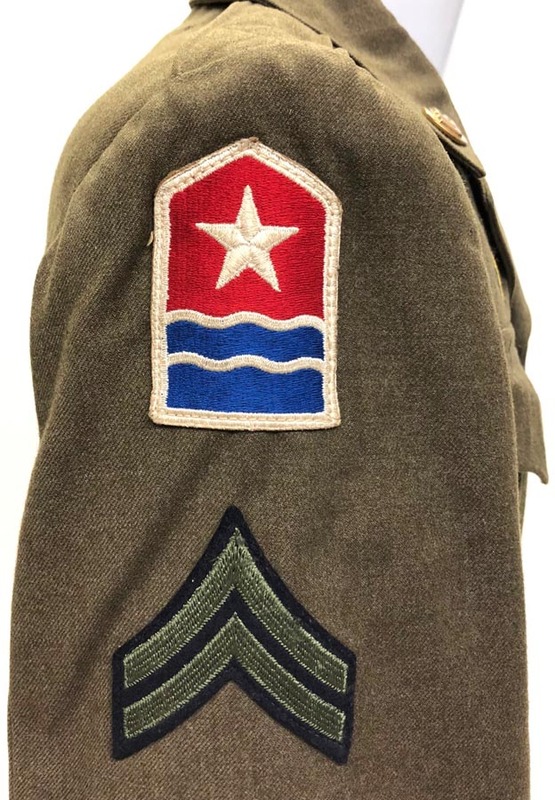 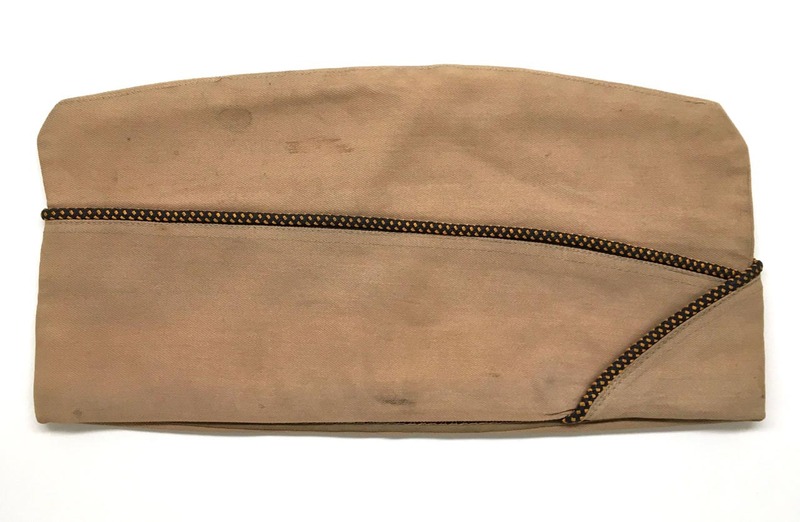 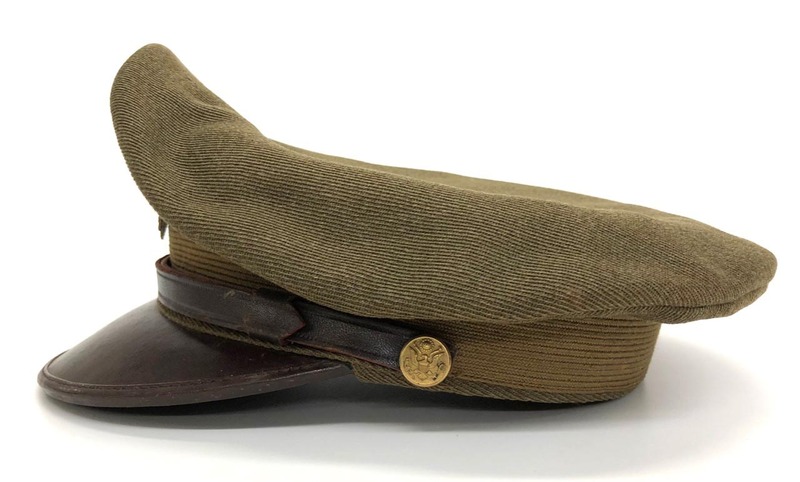 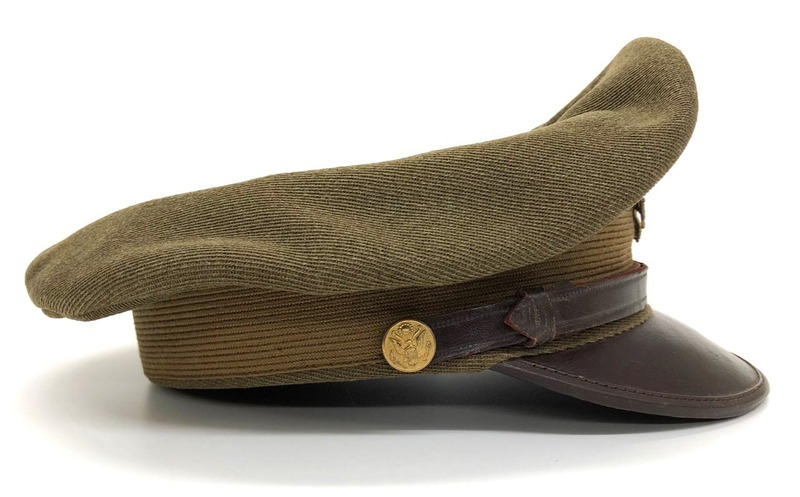 PHYSICAL DESCRIPTION: This U.S. Army Officer's Visor Cap from the 1920's is in excellent condition with no mothing or damage. 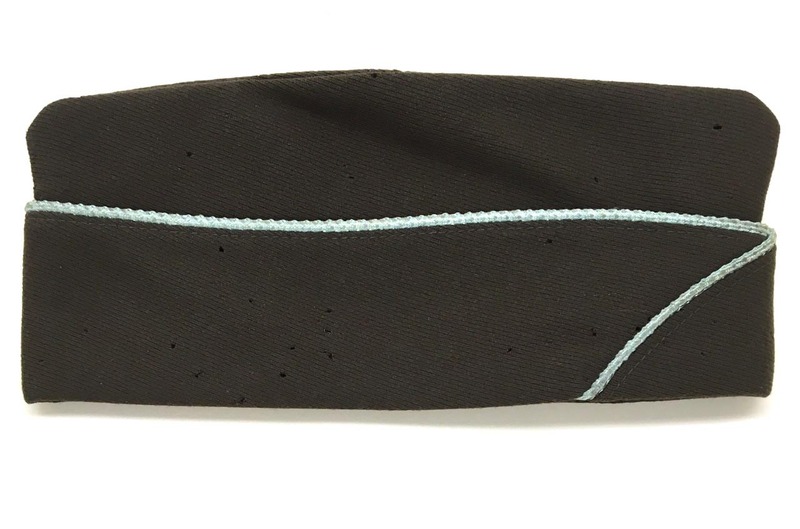 Visor is tight, leather sweatband is totally intact with no damage and sweat shield is also intact with no damage. 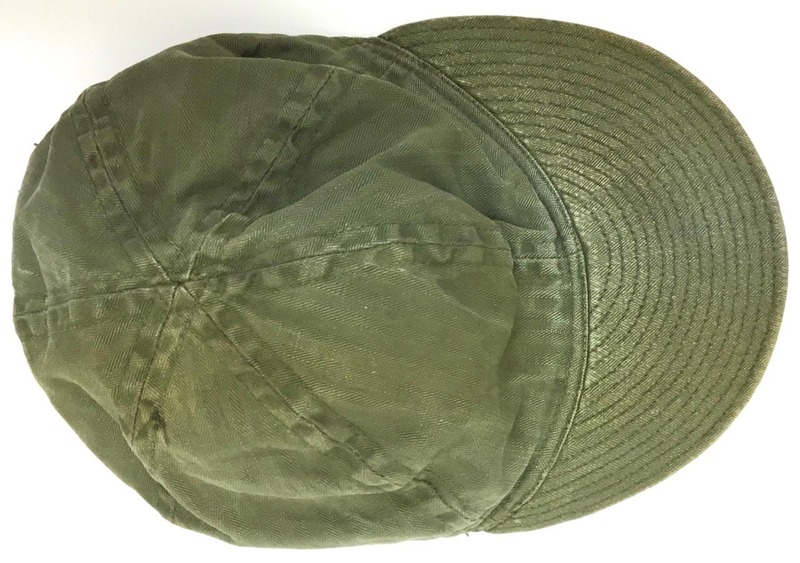 Just an all around nice cap for it's age. 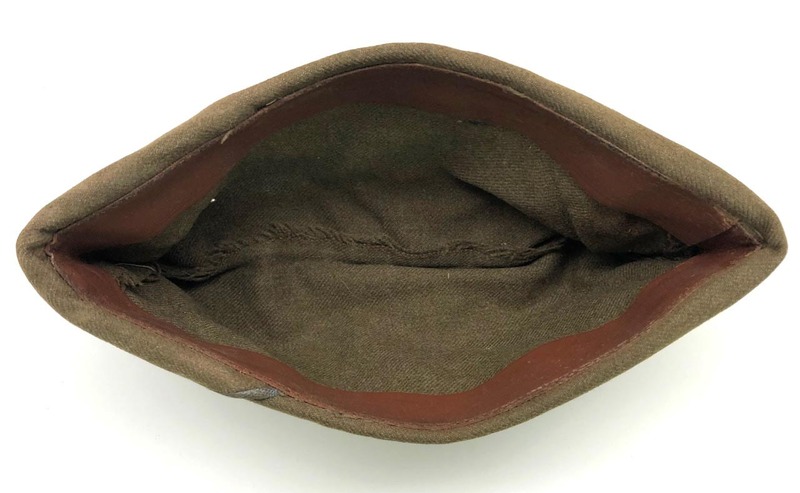 Great saddle shape. 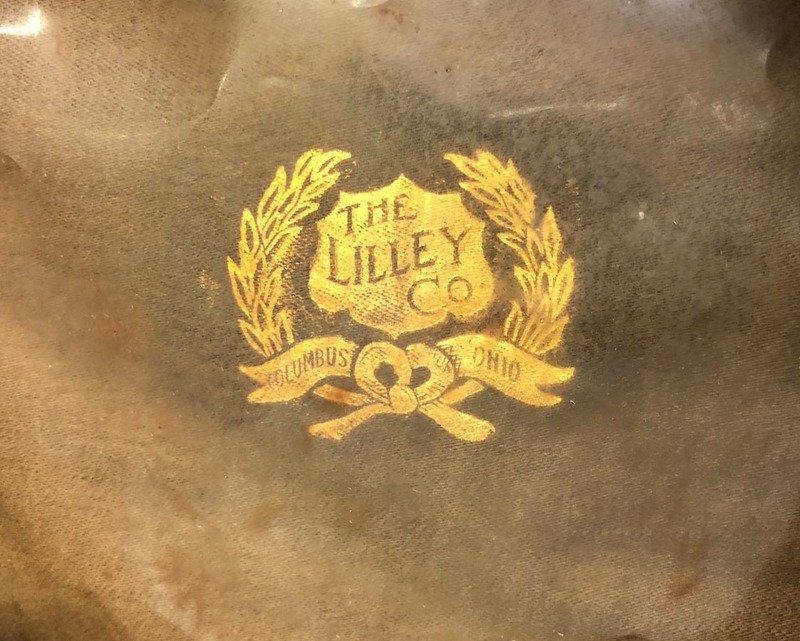 Manufactured by The Lilly Company of Columbus , Ohio. 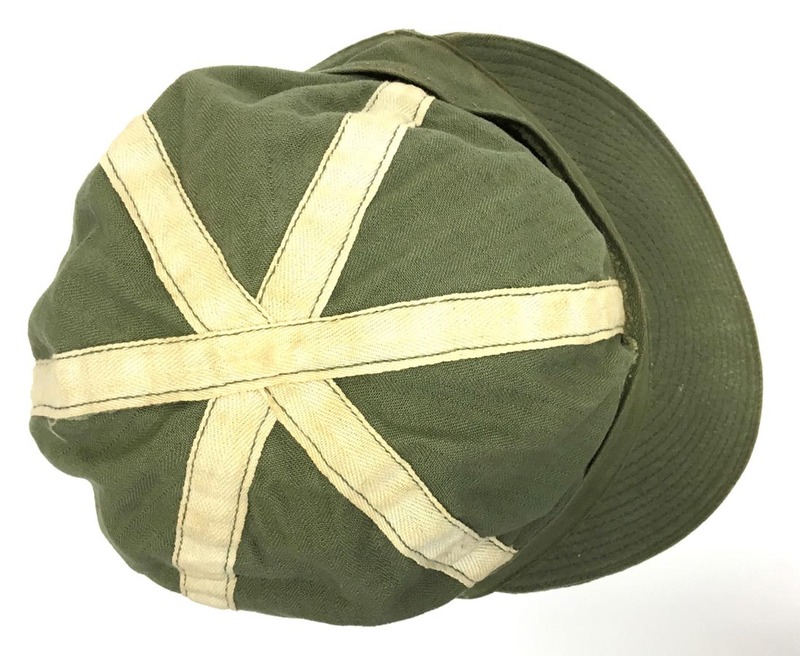 PHYSICAL DESCRIPTION: This WW2 U.S. Navy Foul Weather Hat - Southwester is in nice condition showing some wear. 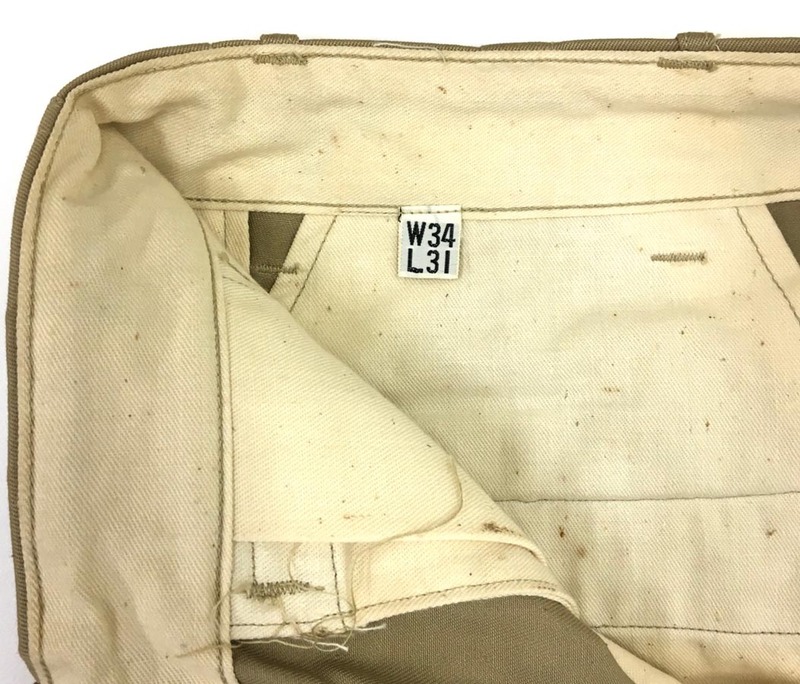 One strap shows a repair, no other holes or damage. 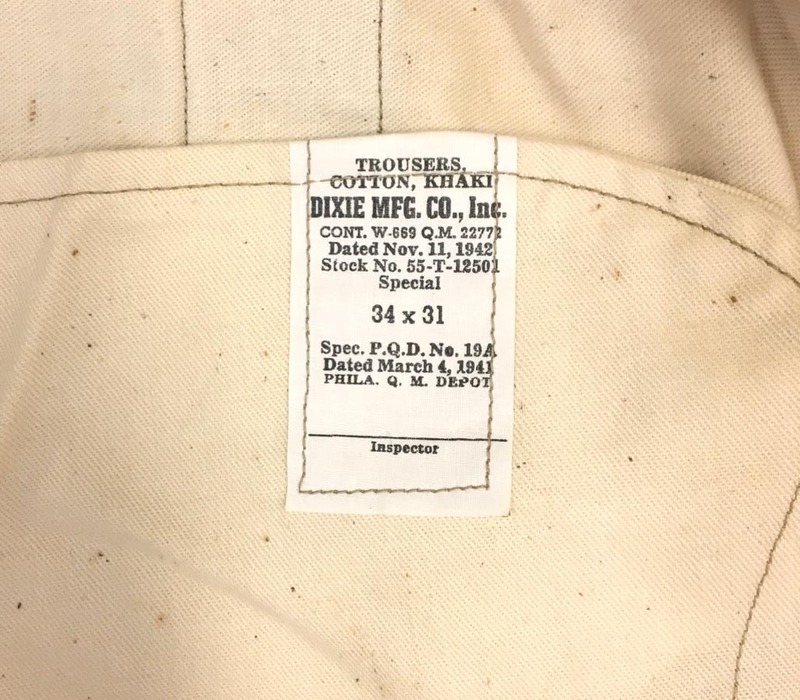 Nice maker label with a 1942 date. 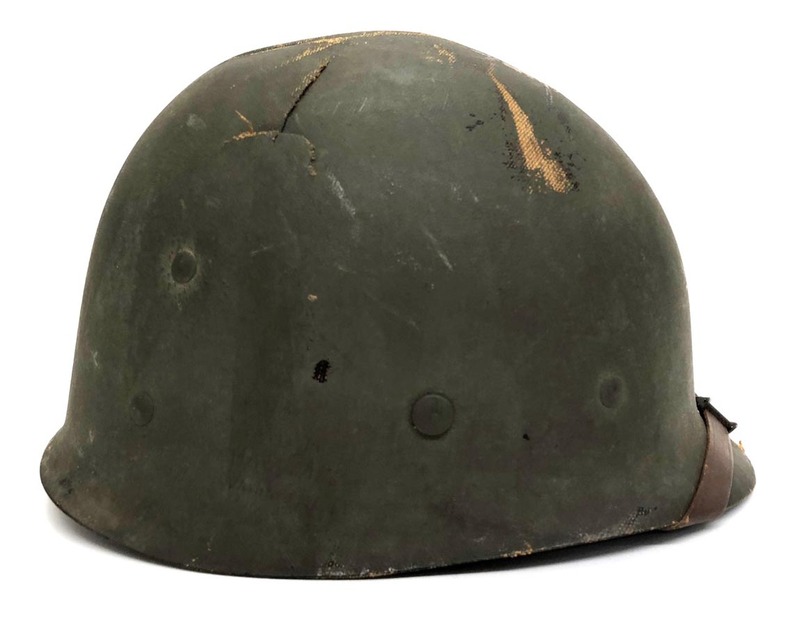 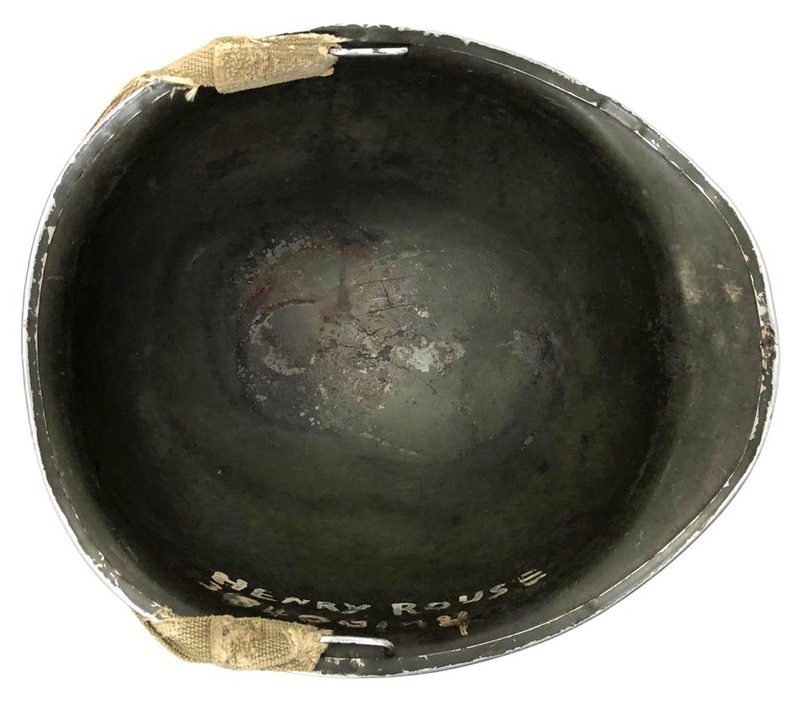 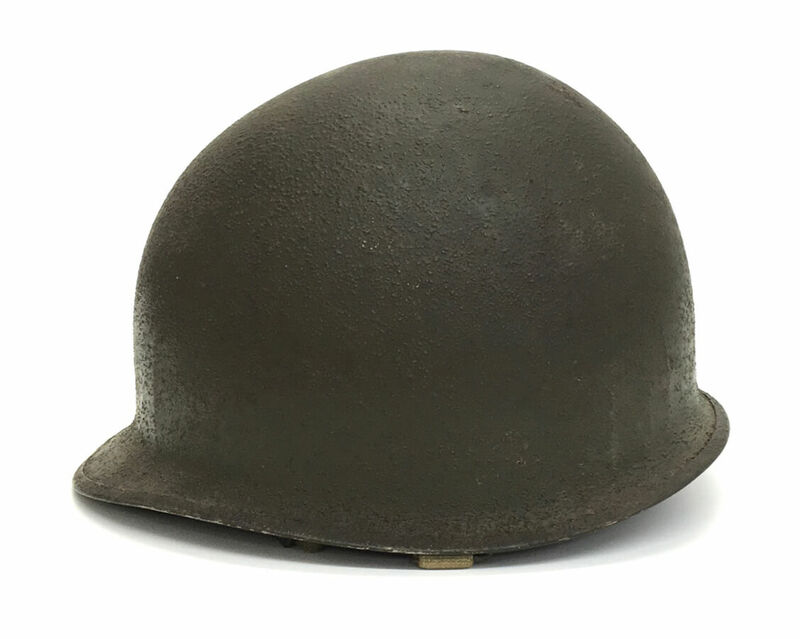 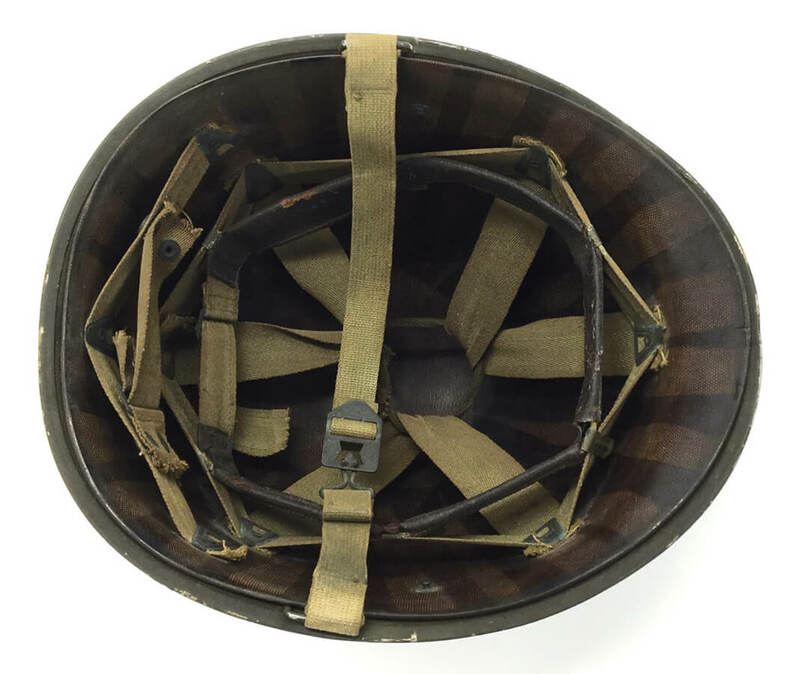 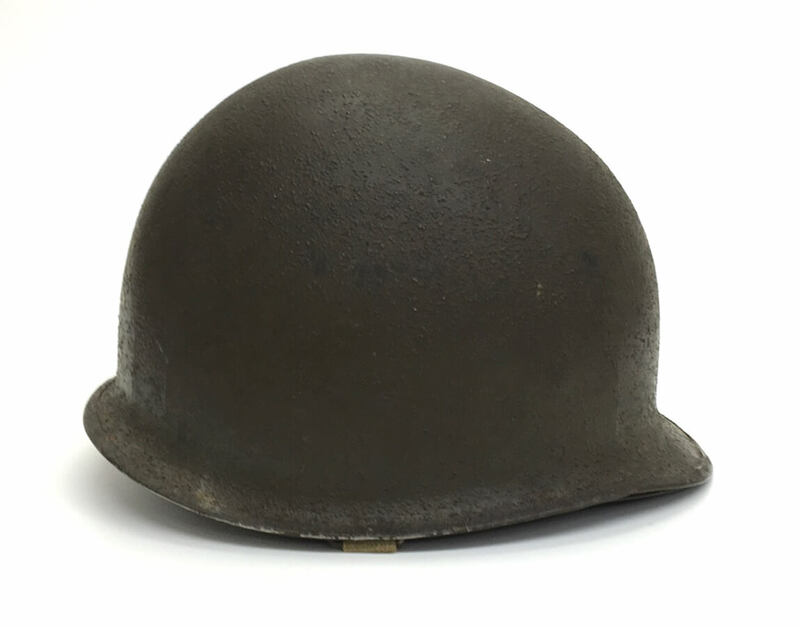 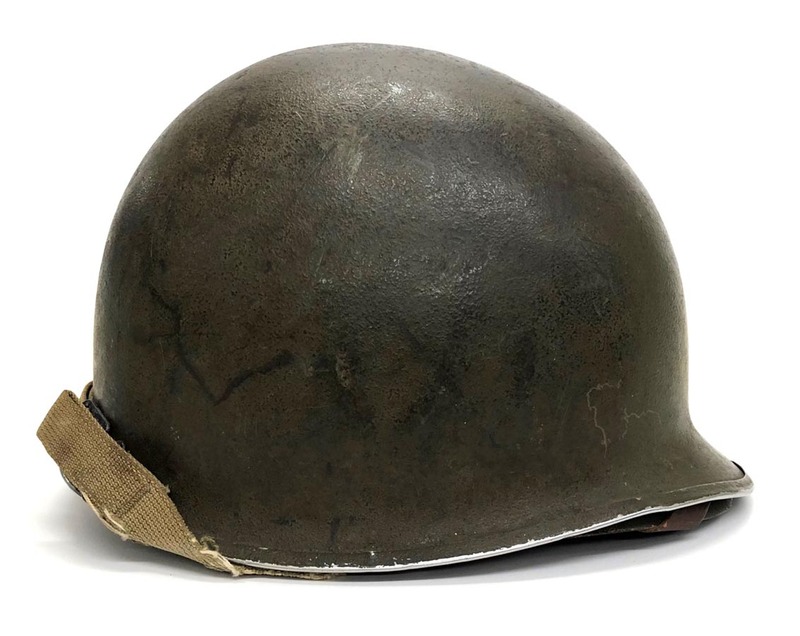 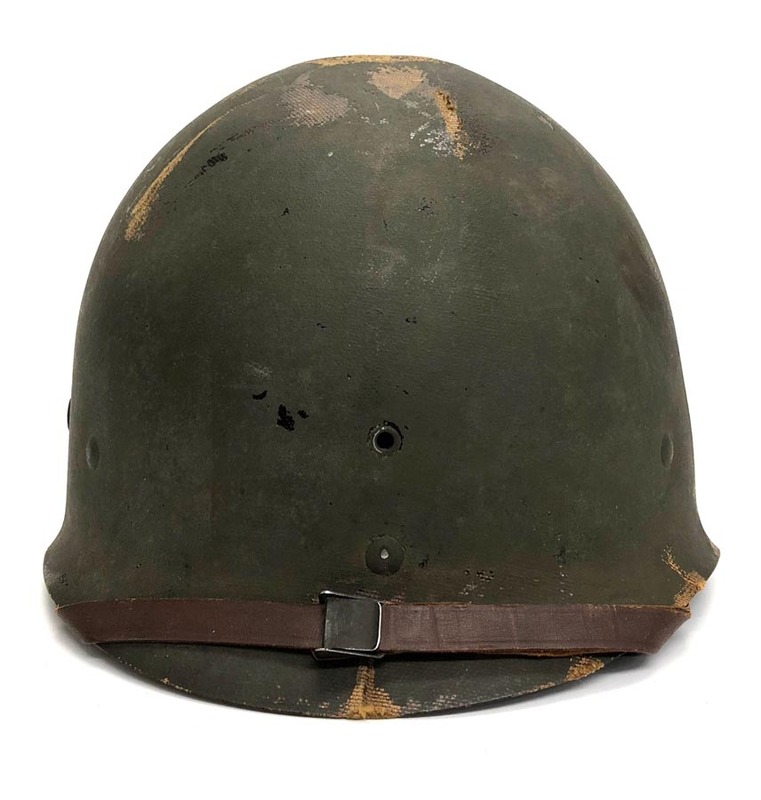 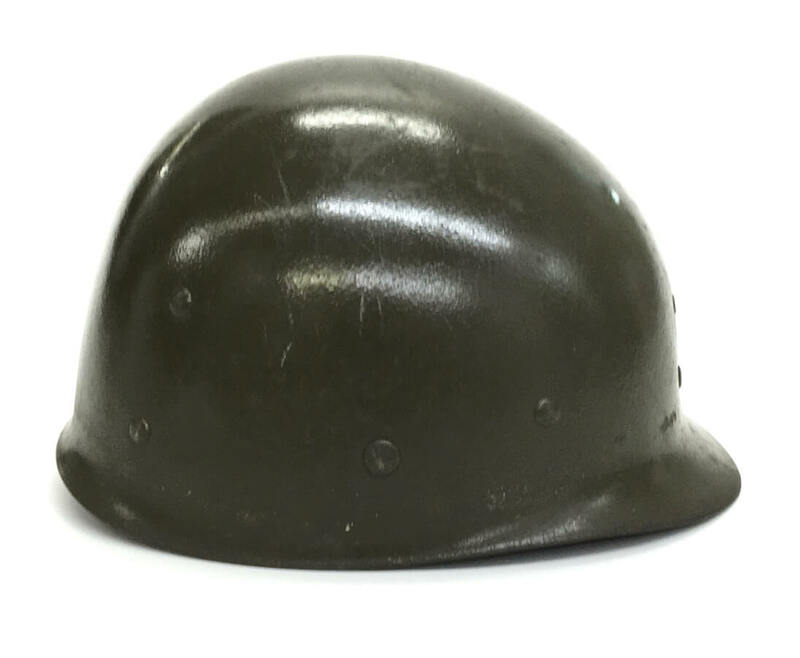 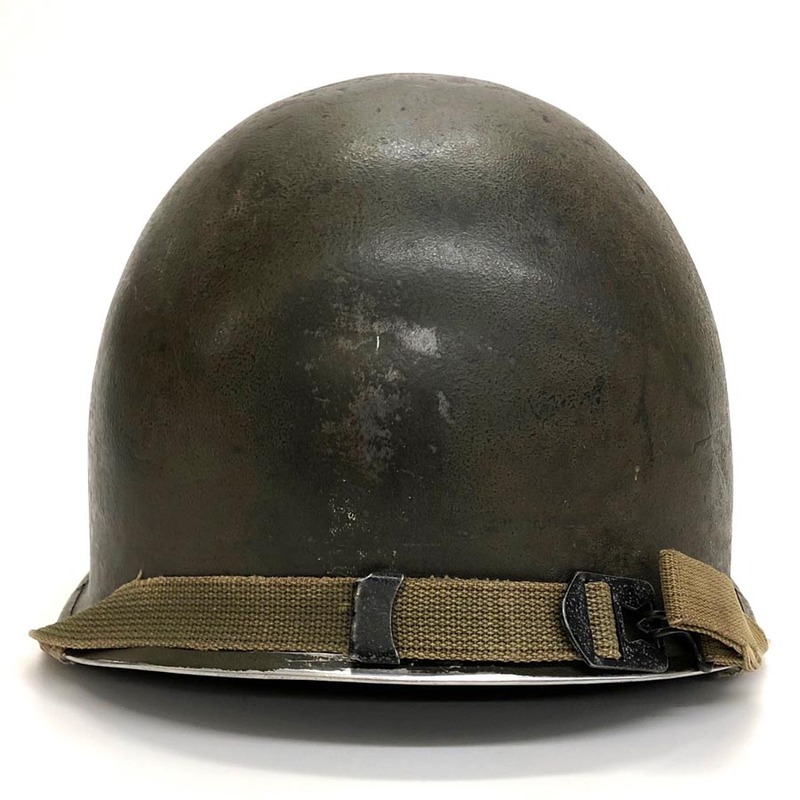 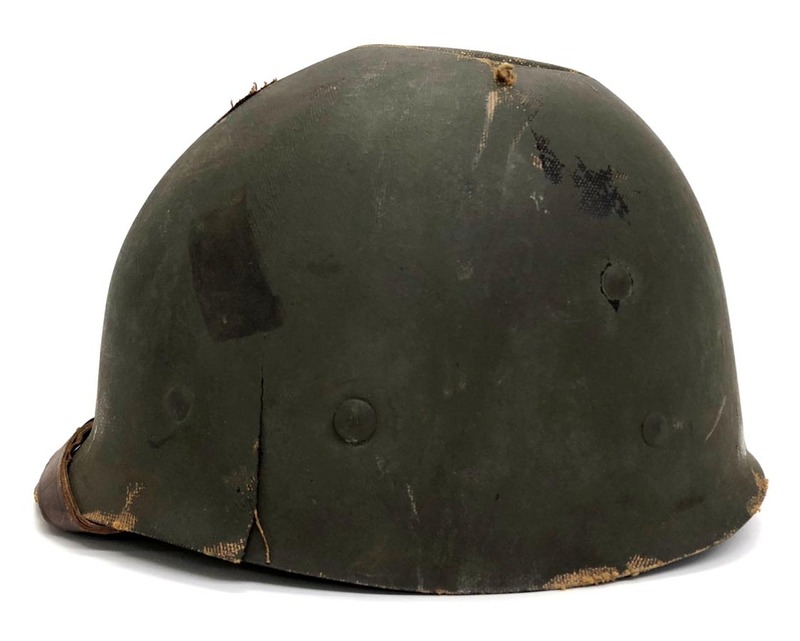 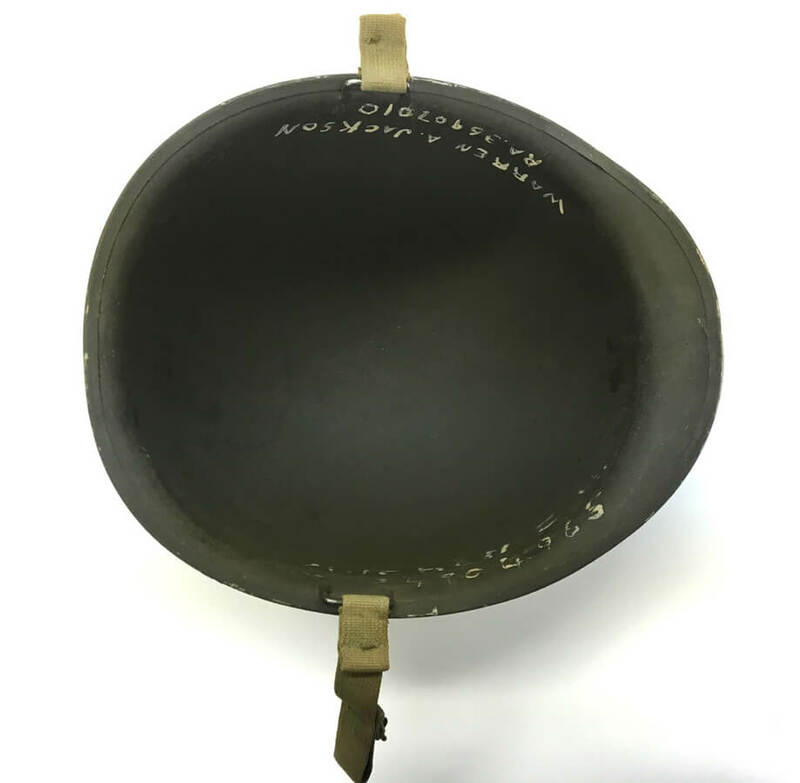 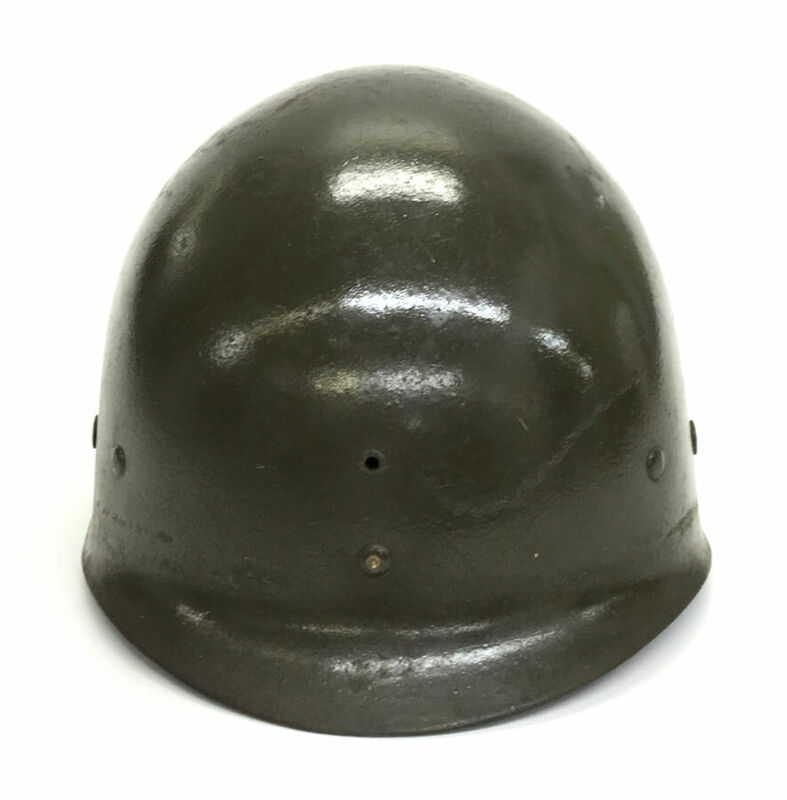 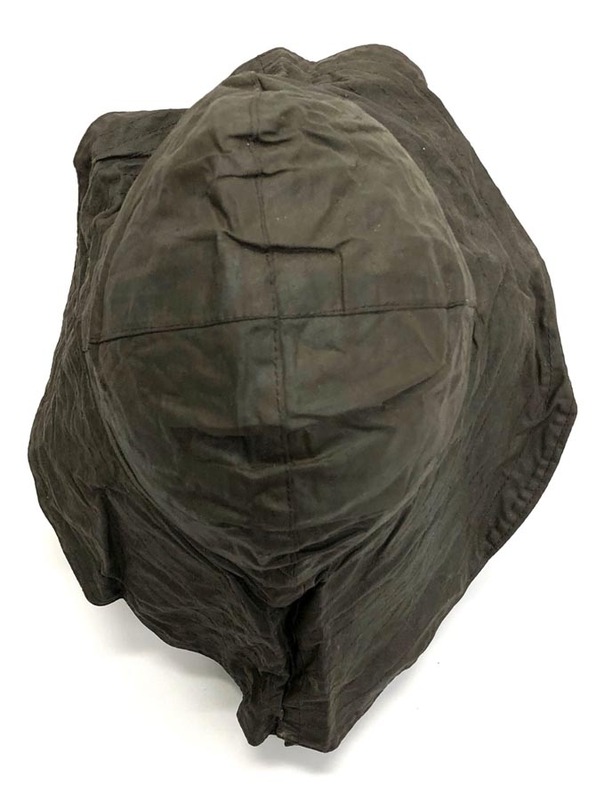 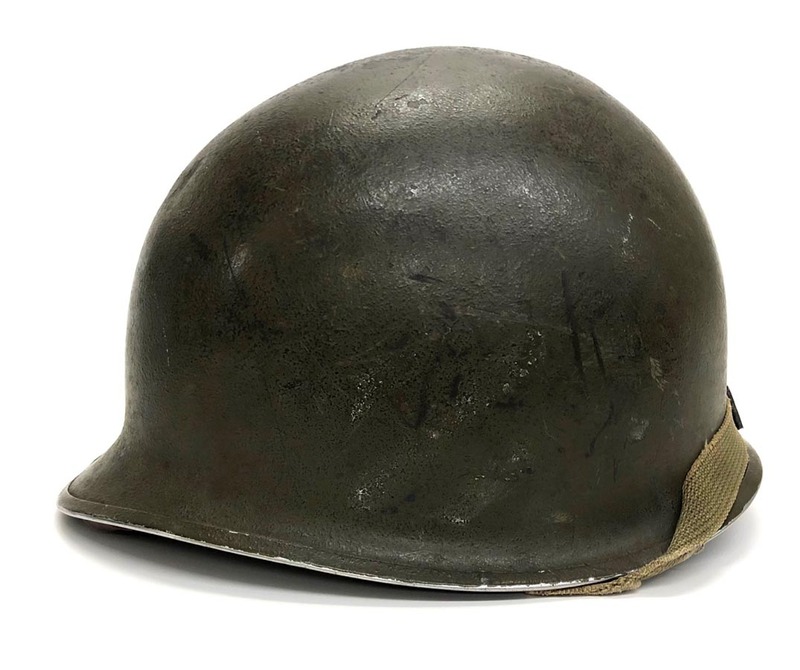 PHYSICAL DESCRIPTION: This WW2 US Fixed Bail Front Seam Helmet is in fair condition showing some age and wear. 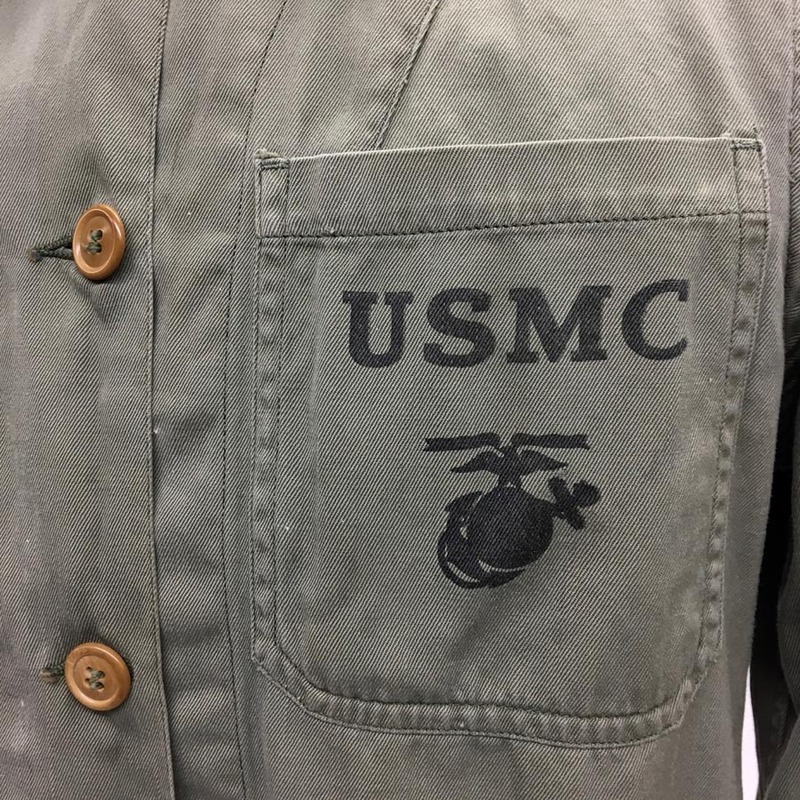 Shell has a few small dings nothing major. 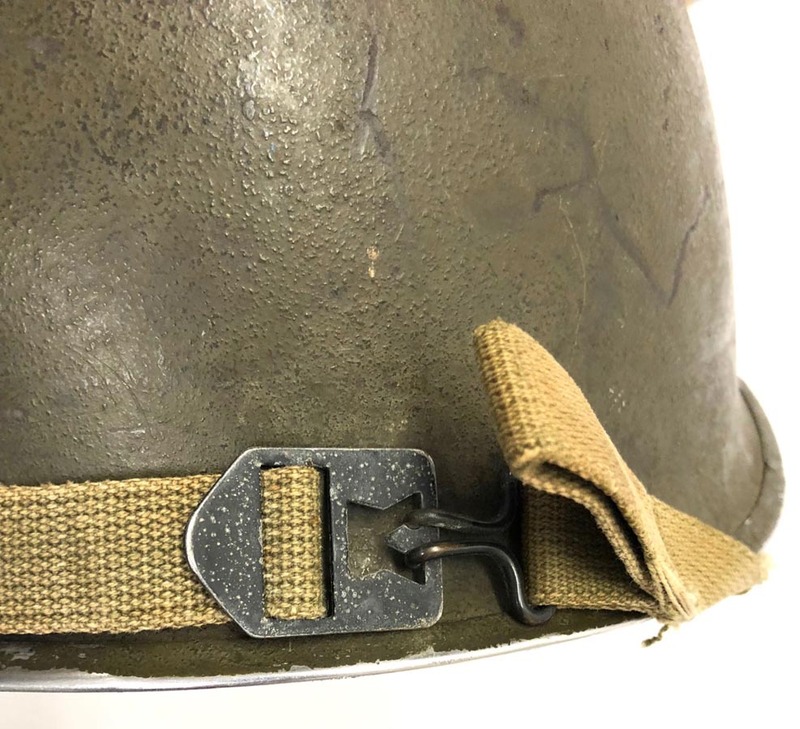 Shell chinstrap shows wear but is solid and still fastens nicely. 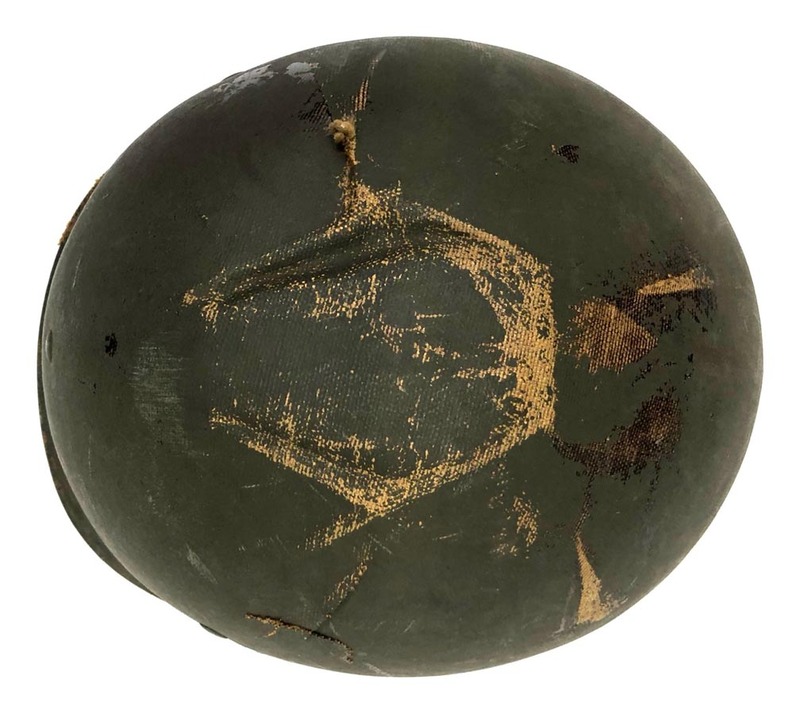 Shell shows evidence of once having something painted to front and rear. 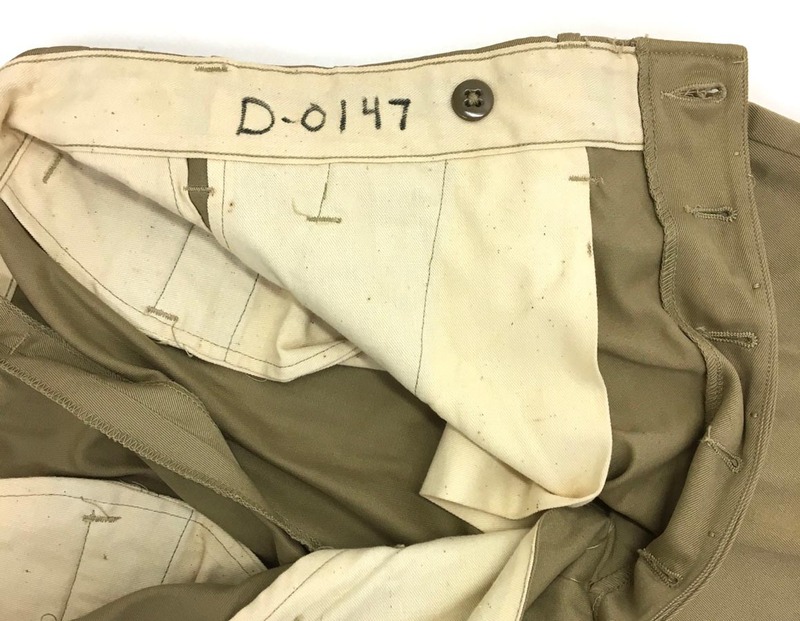 Shell is owner named and numbered to interior. 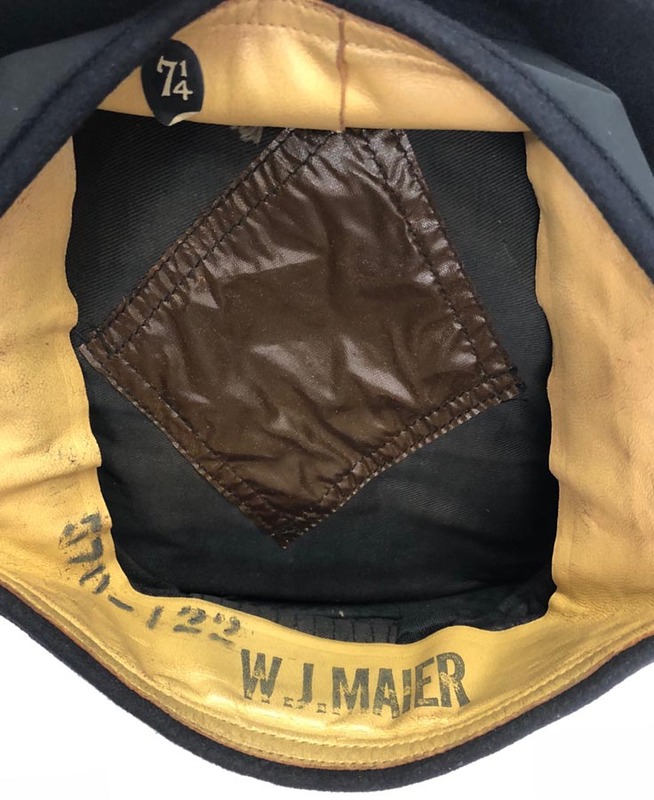 Liner shows much wear and some damage. 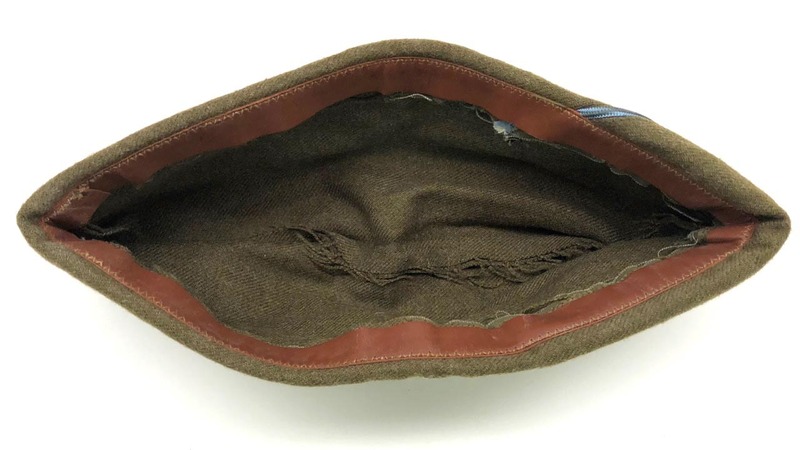 There is a 2 1/2 inch split to one edge. 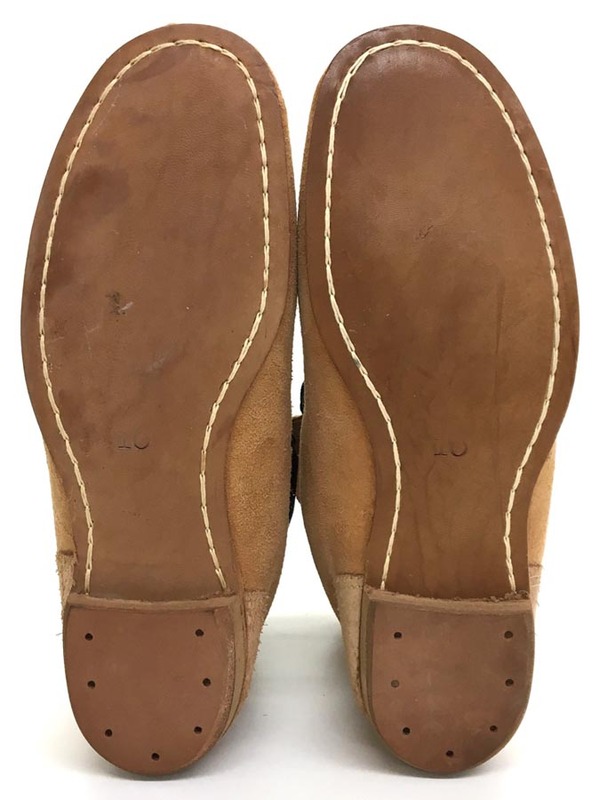 Some denting to top area. 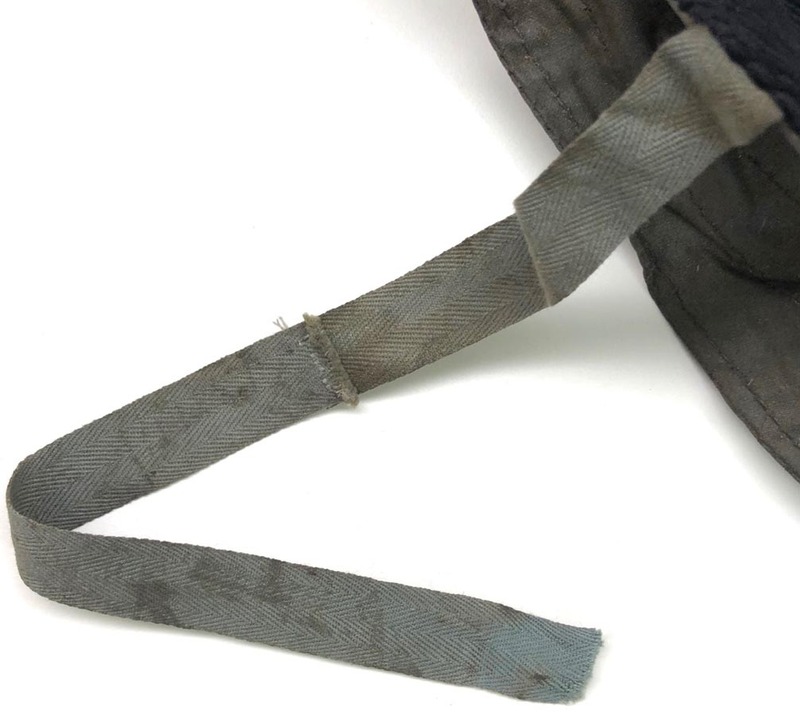 Leather chinstrap is intact. 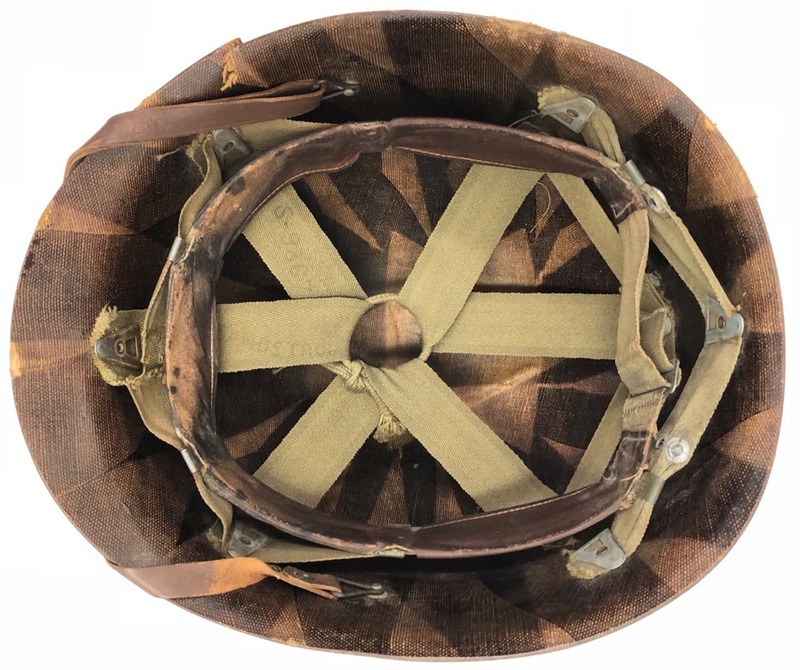 All webbing is present with one tear to front area. 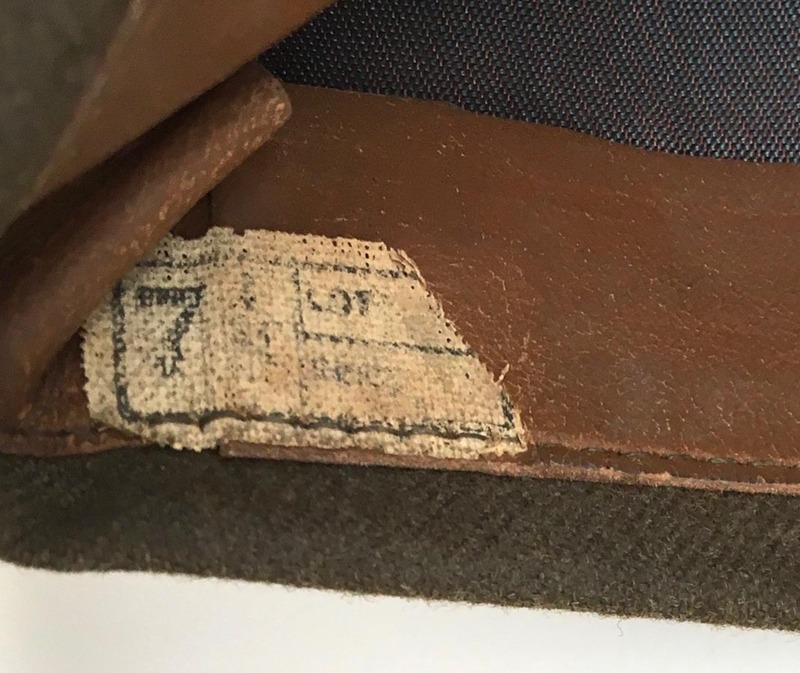 Leather sweatband is nice showing some wear. 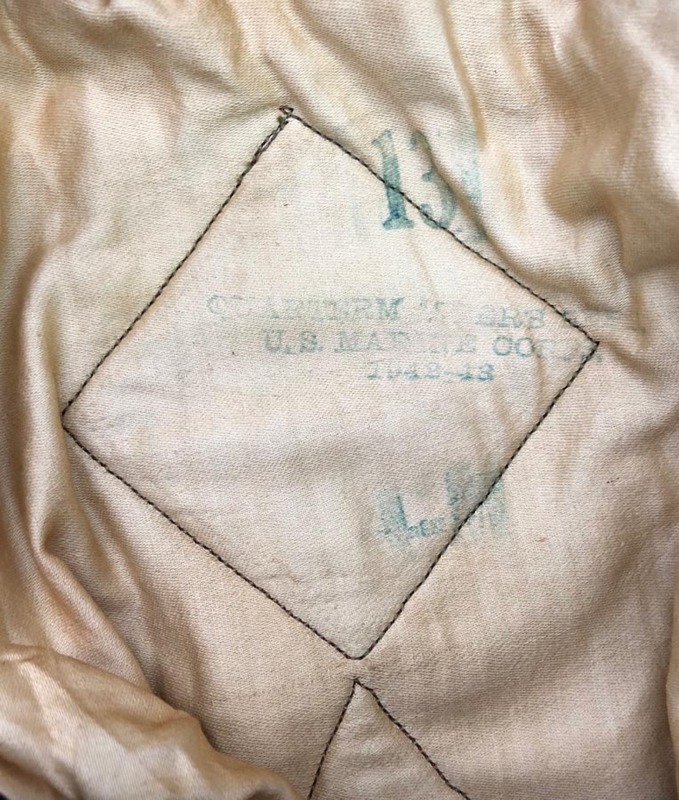 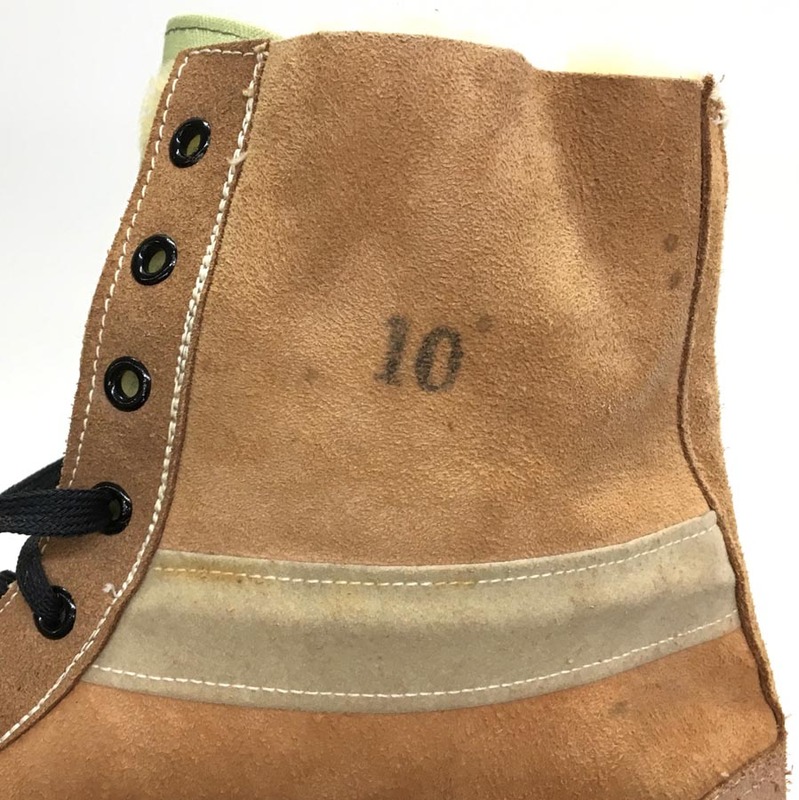 Liner is Capac maker marked. 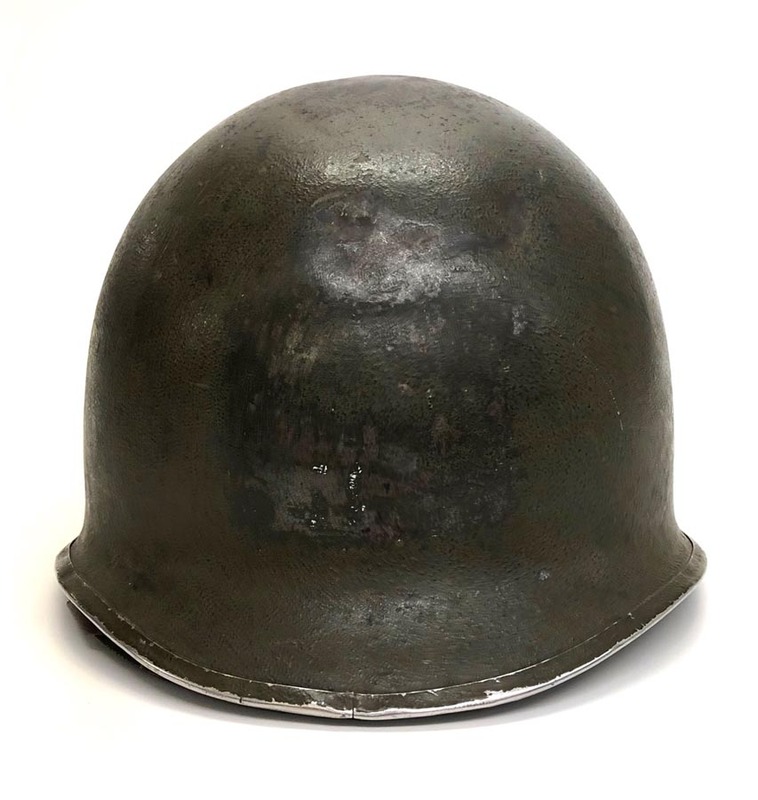 Nice salty combat used helmet. 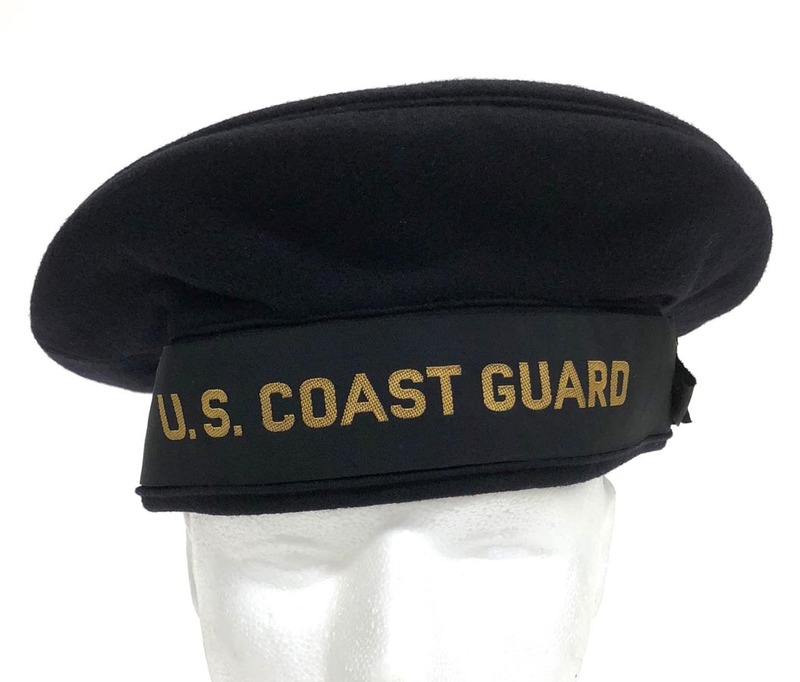 PHYSICAL DESCRIPTION: This WW2 US Coast Guard Donald Duck Style Cap is in great condition with no mothing or damage. 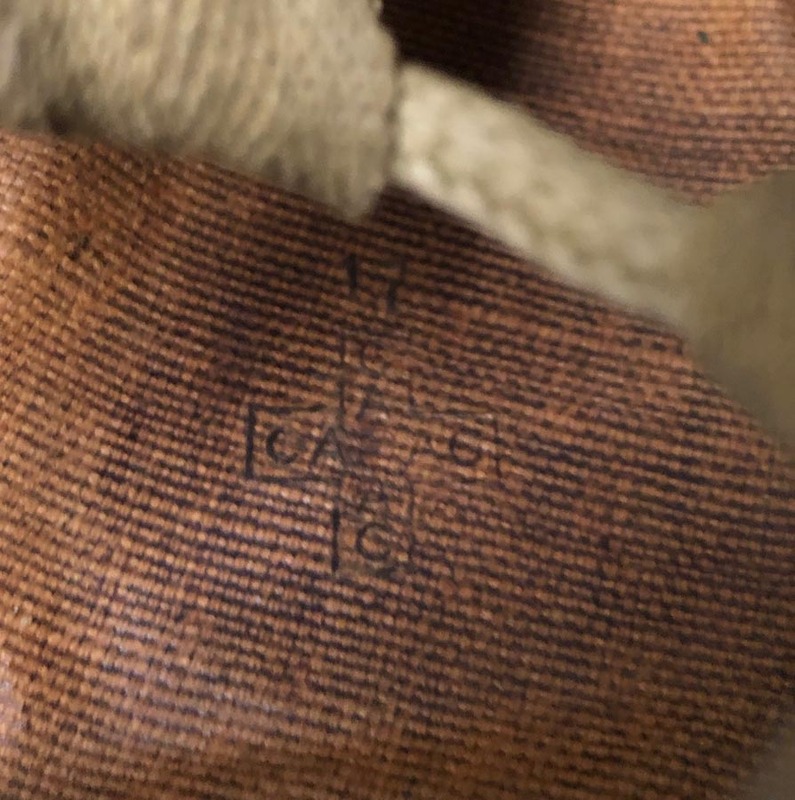 Cap is named and has it's size tag which reads 7 1/4. 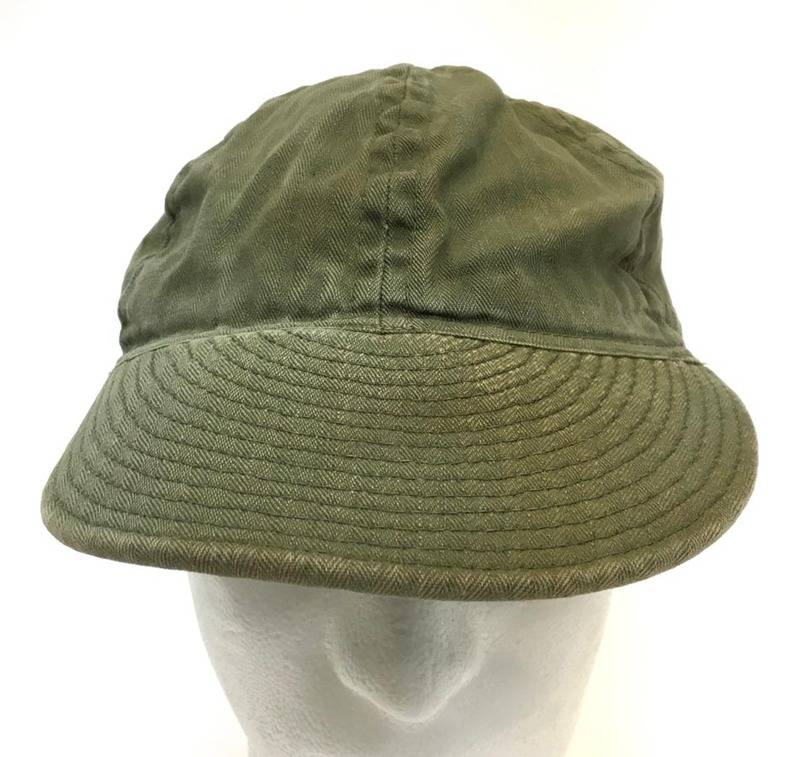 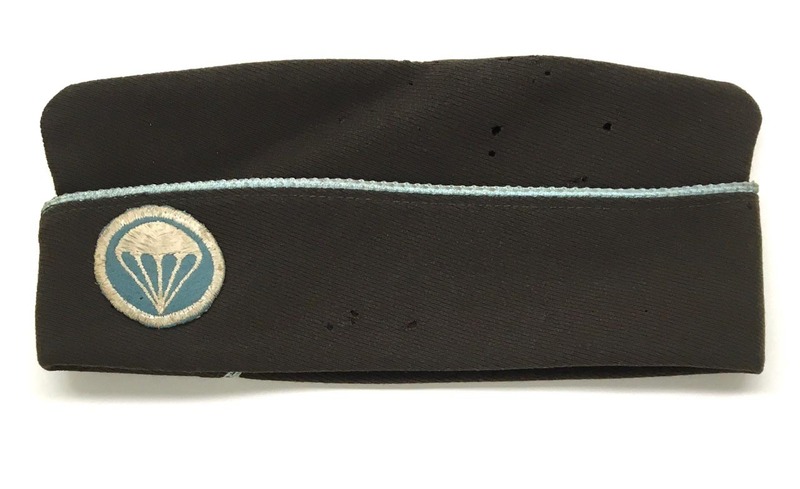 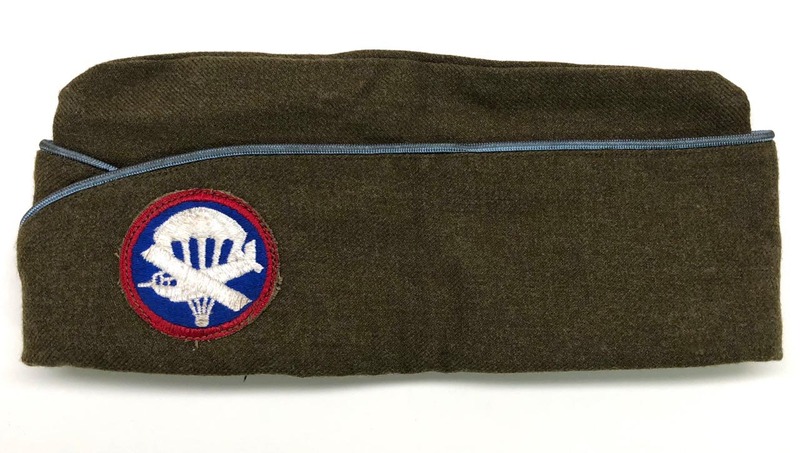 PHYSICAL DESCRIPTION: This WW2 Airborne Glider Infantry Regiment Overseas Cap is in real nice condition with no damage or mothing. 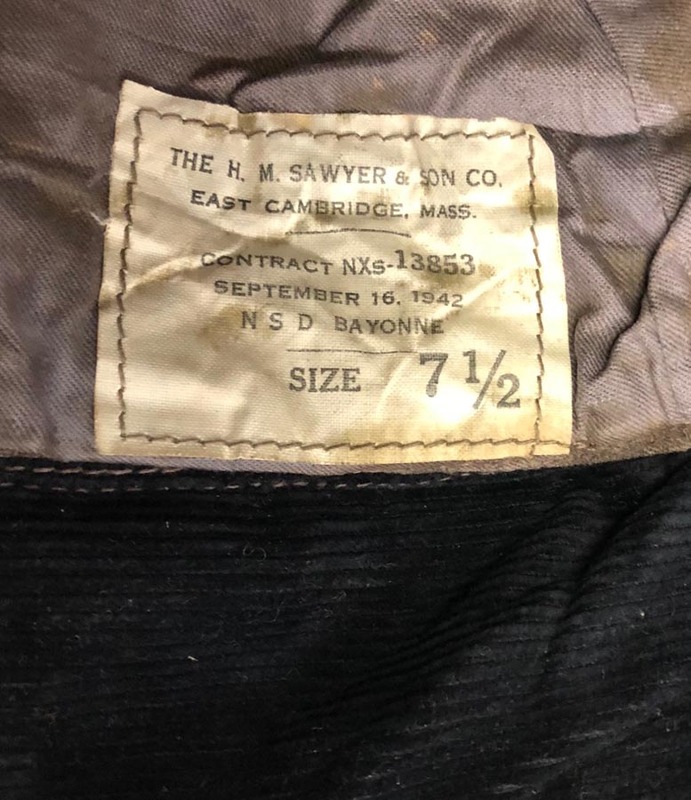 I believe it is a 7 1/8 size. 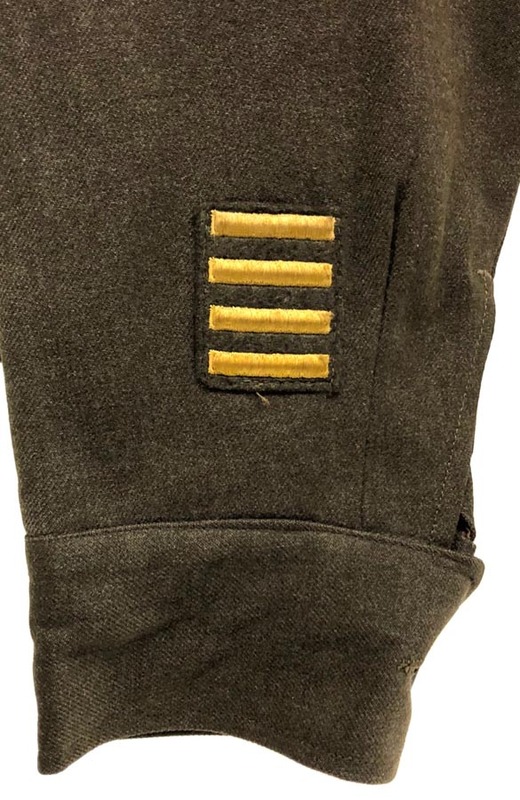 Leather sweatband is nice with no damage. 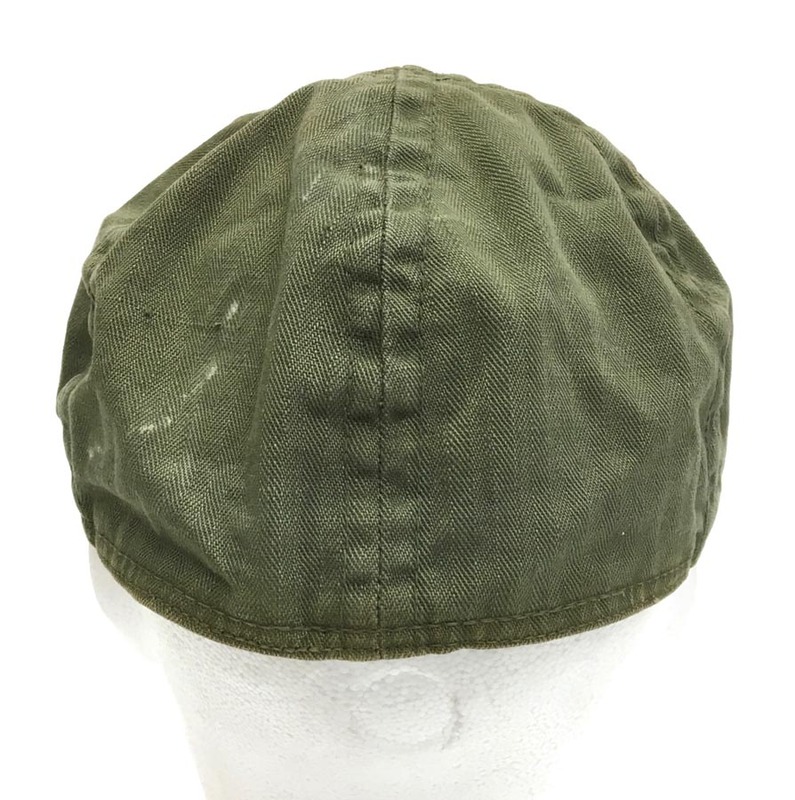 PHYSICAL DESCRIPTION: This WW2 Airborne Glider Infantry Regiment Overseas Cap is in nice condition showing some age,soiling and mothing. 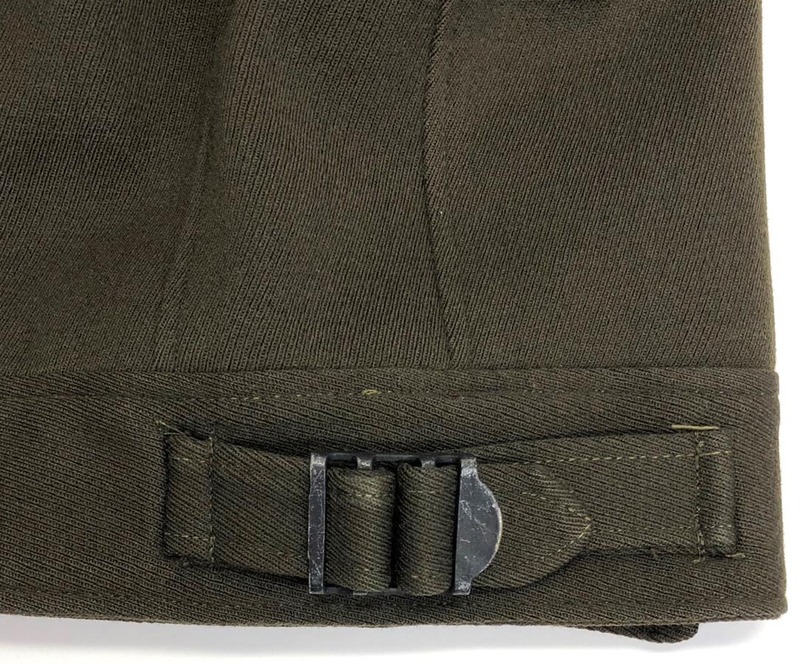 Cap has a scarce theater made GIR patch. 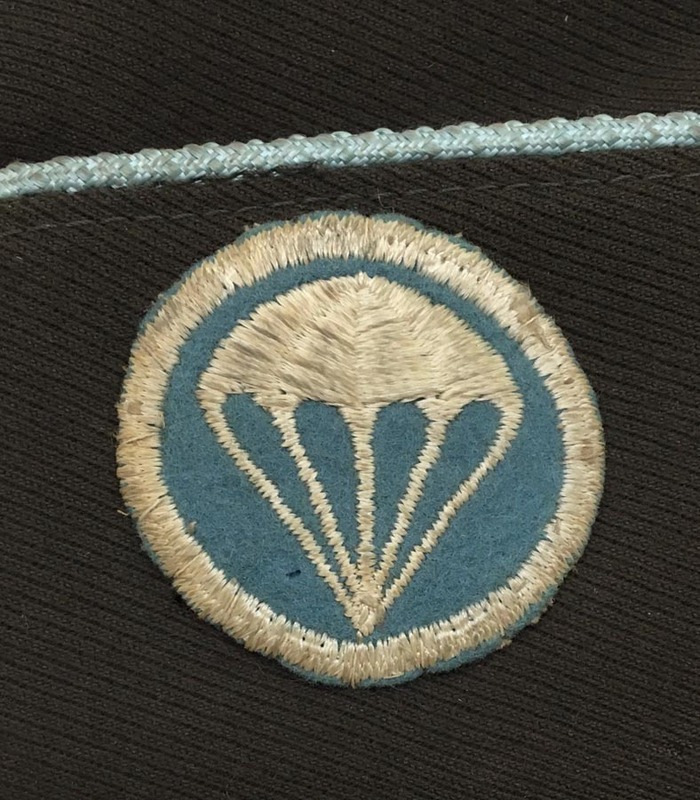 Mothing can be seen right above the patch. 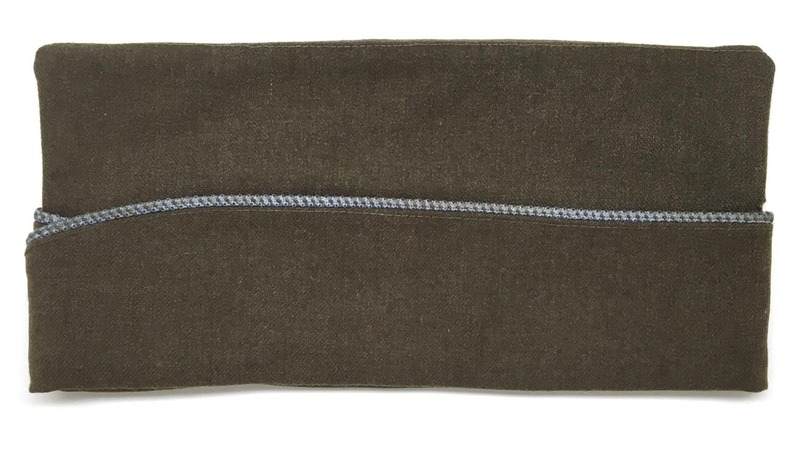 Leather sweatband is nice with no damage. 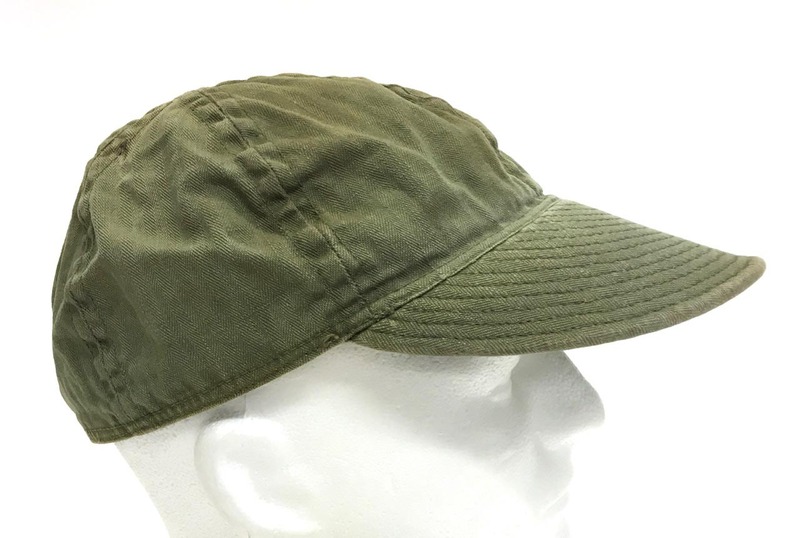 I believe this cap is a size 7 1/8. 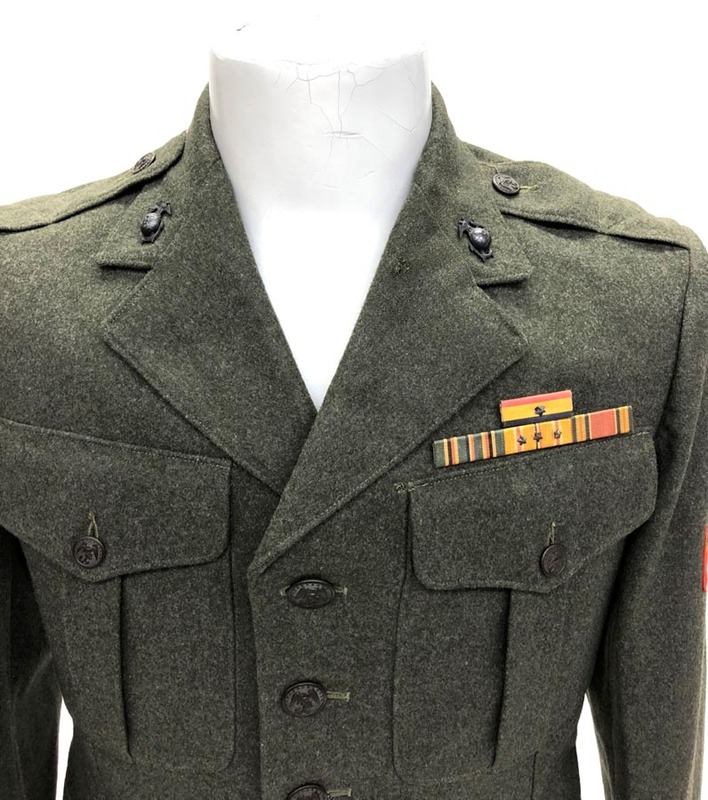 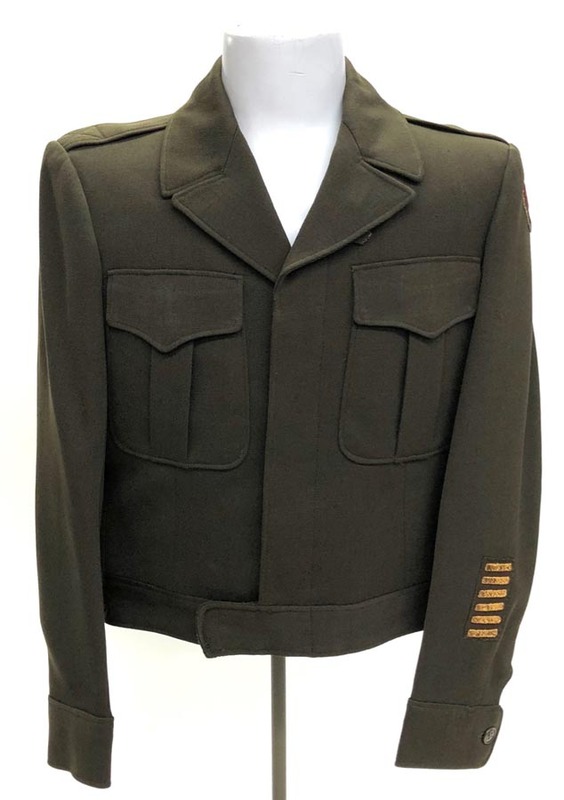 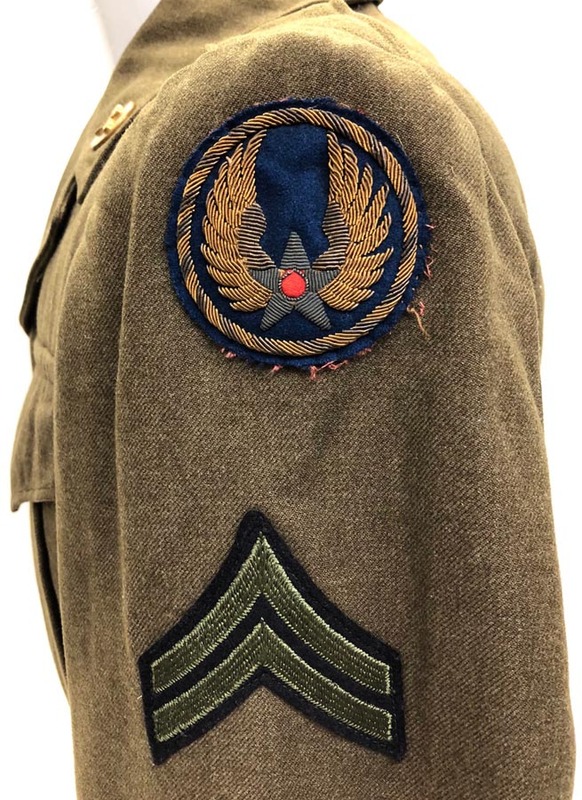 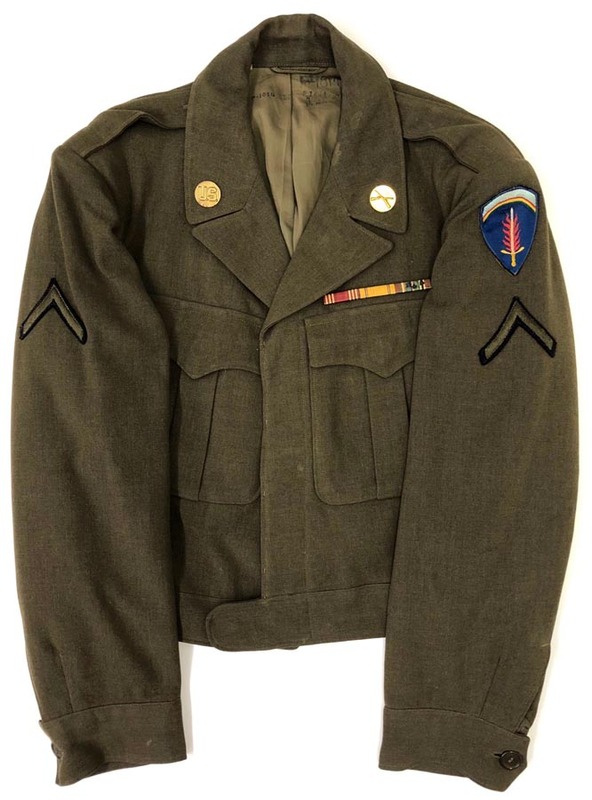 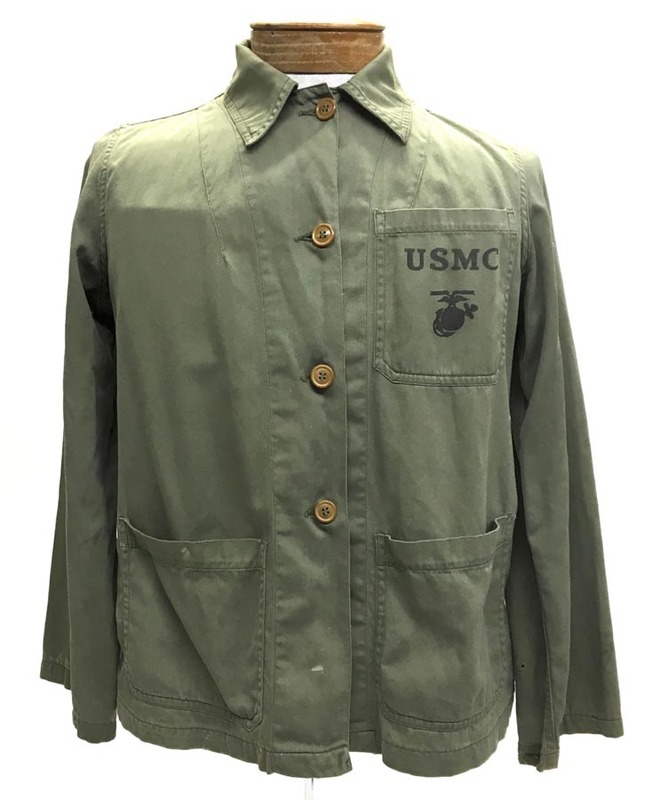 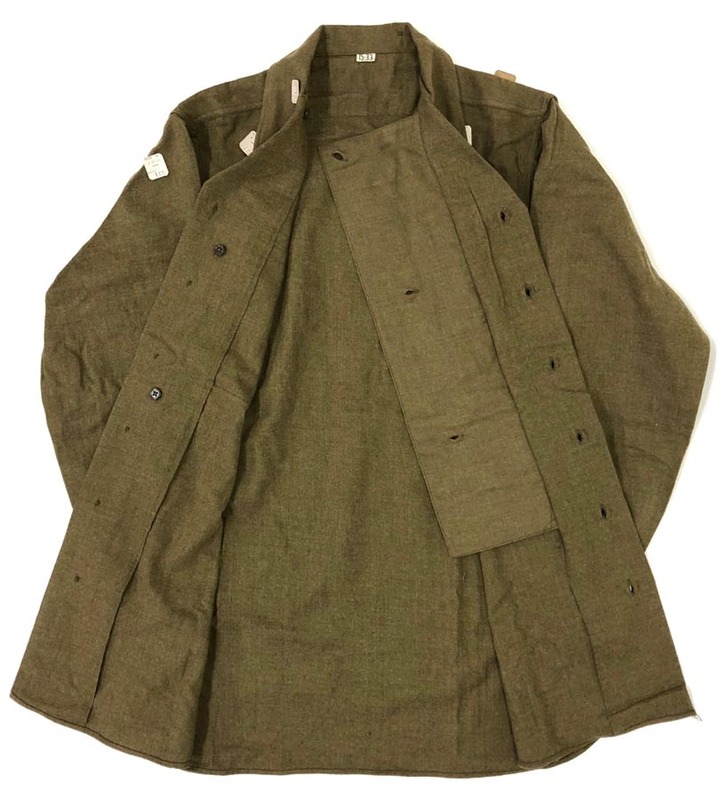 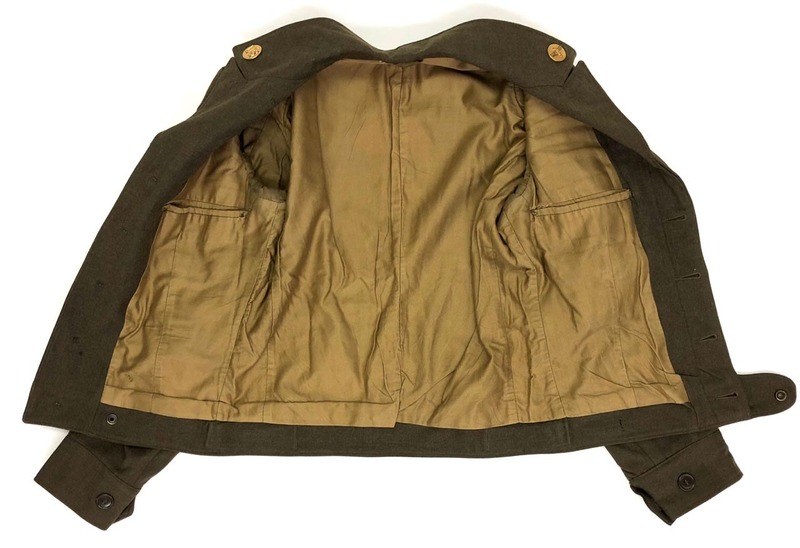 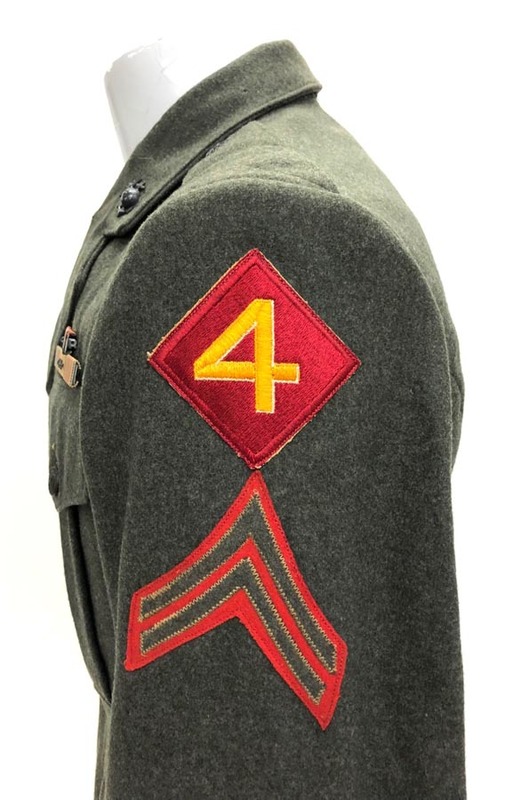 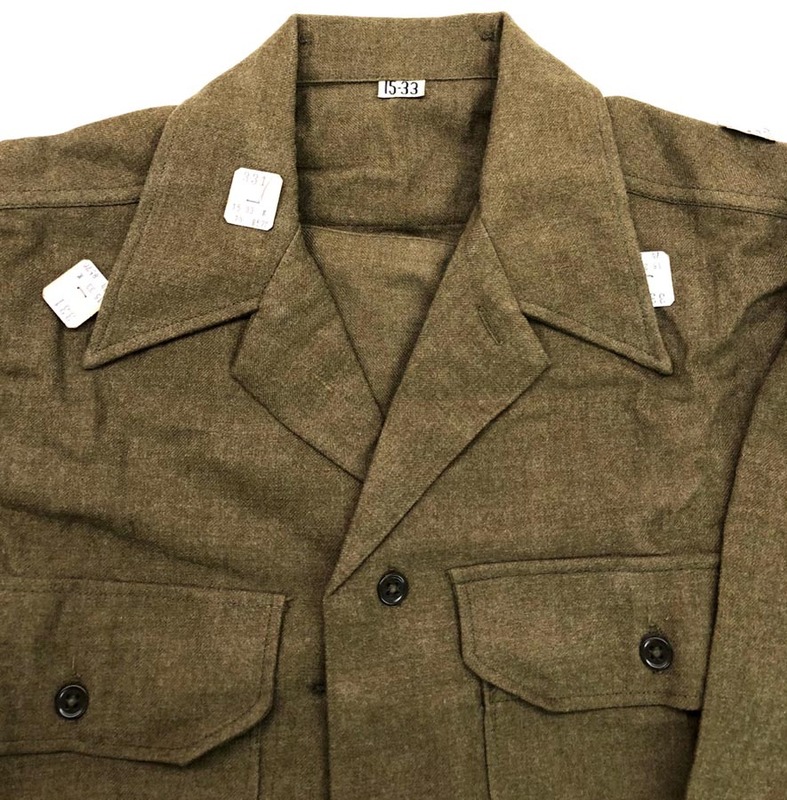 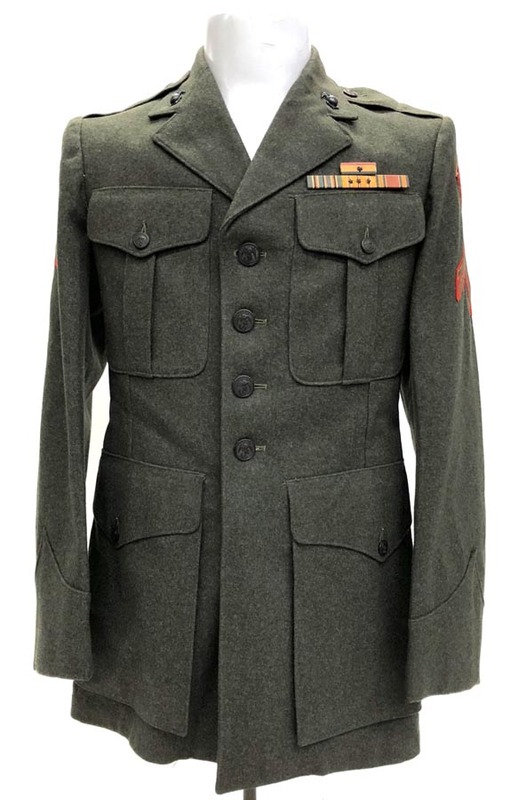 PHYSICAL DESCRIPTION: This WW2 Marine 4th Division Uniform Jacket is in nice condition. 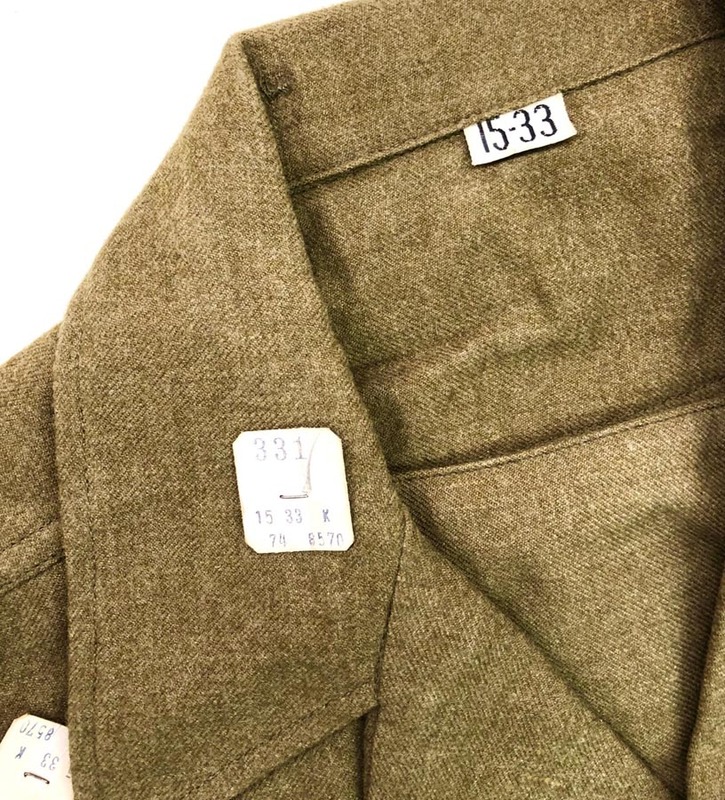 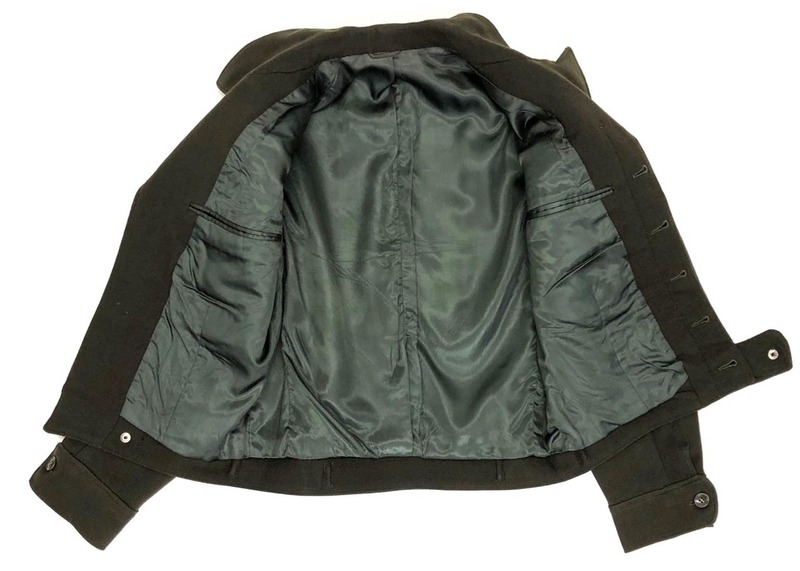 Jacket has two small moth holes, one at collar lapel area and one at back bottom. 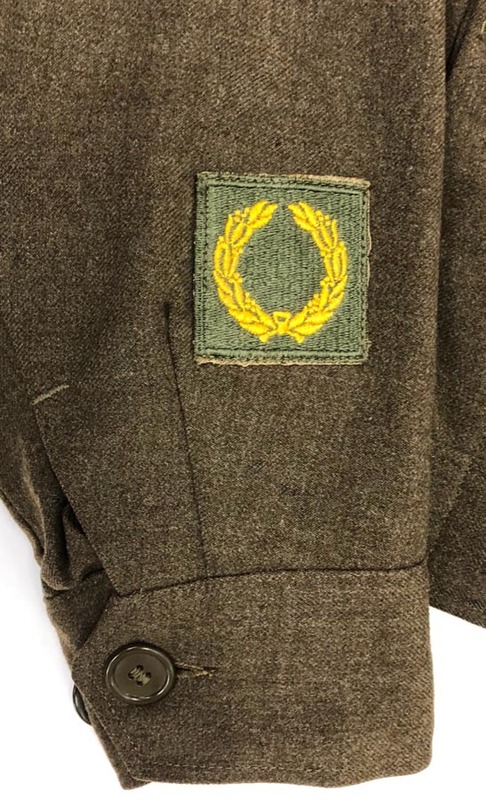 Jacket is dated 1942-43 and is not named. 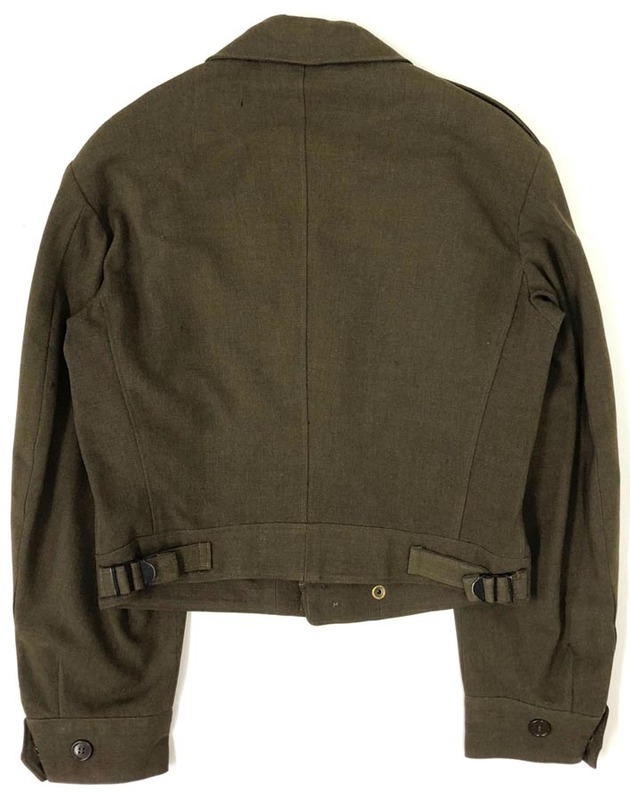 Jacket has collar eg&a's and ribbon bars. 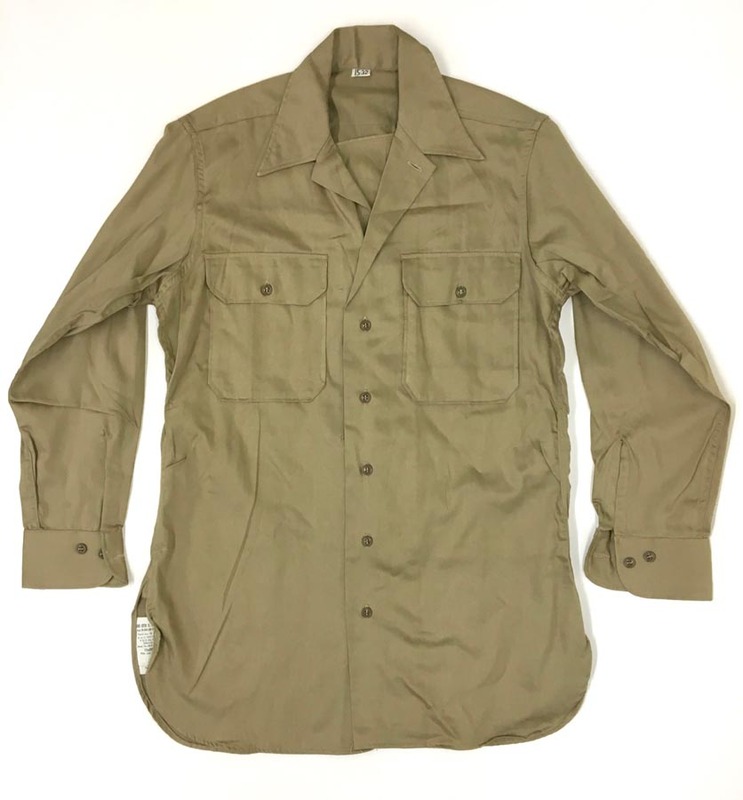 PHYSICAL DESCRIPTION: This WW2 US Army Unissued Shirt is in excellent condition with no mothing or damage whatsoever. 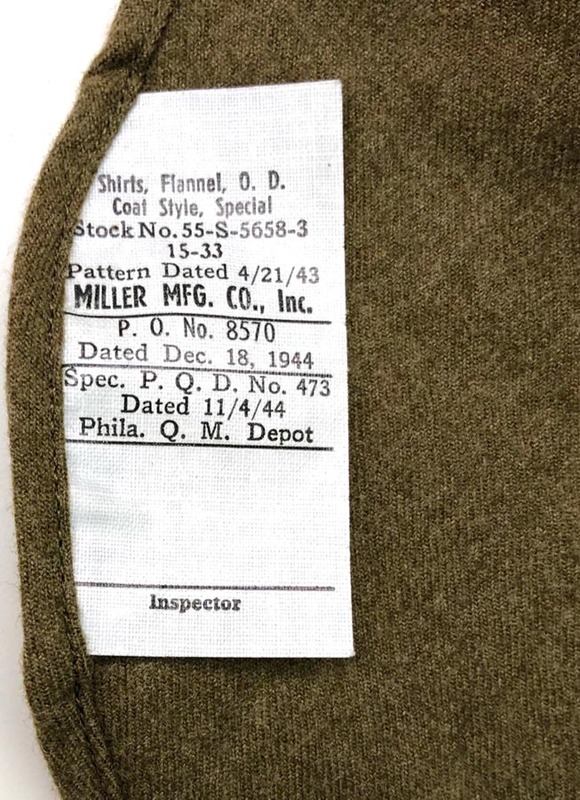 Shirt has 11 cutter tags. 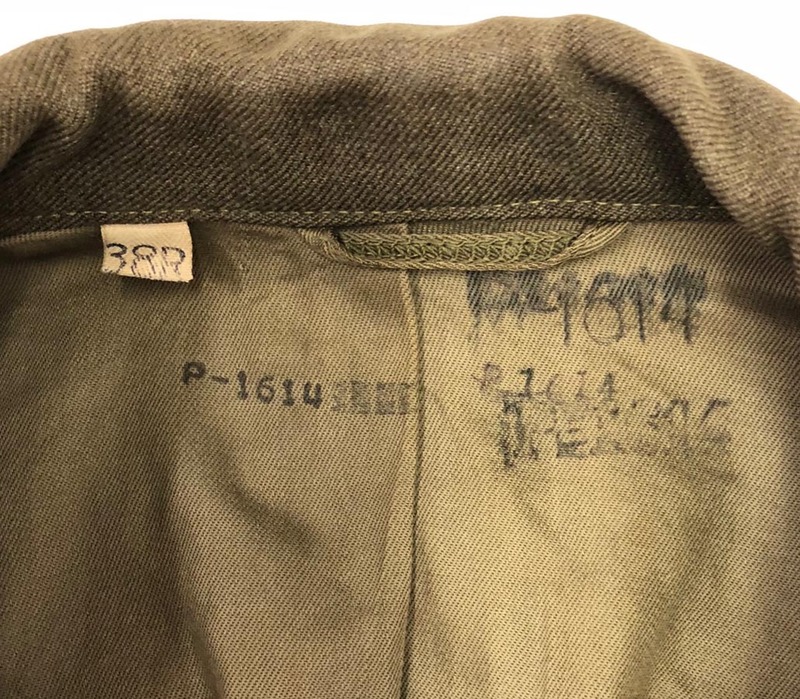 All tags show this shirt as a size 15" neck and a 33" chest. 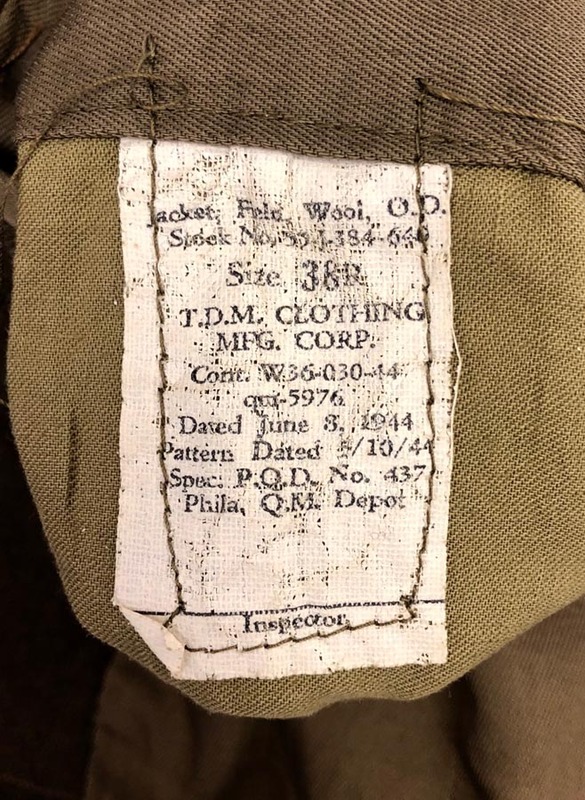 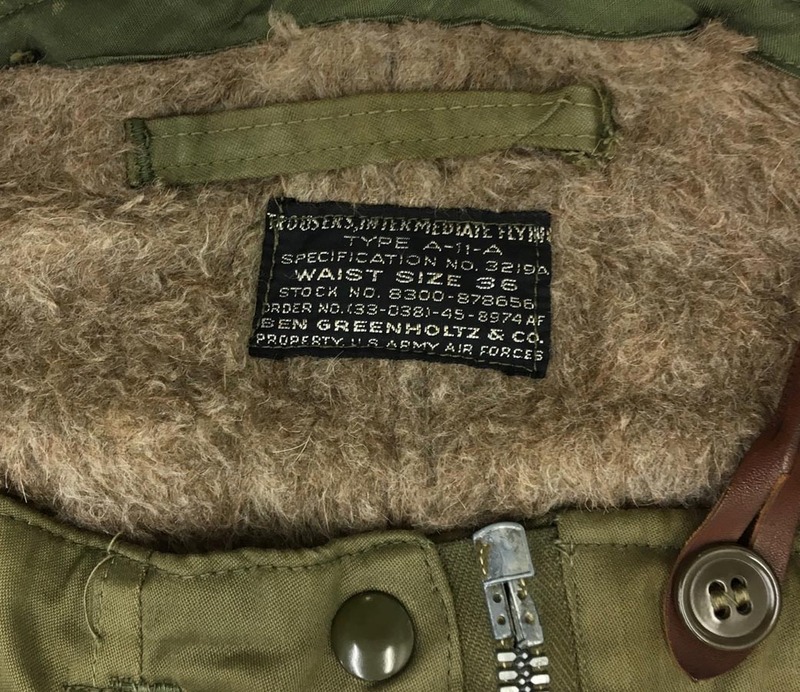 PHYSICAL DESCRIPTION: This WW2 US Army Officer's 27th Division Ike Jacket is in real nice condition with no mothing or damage. 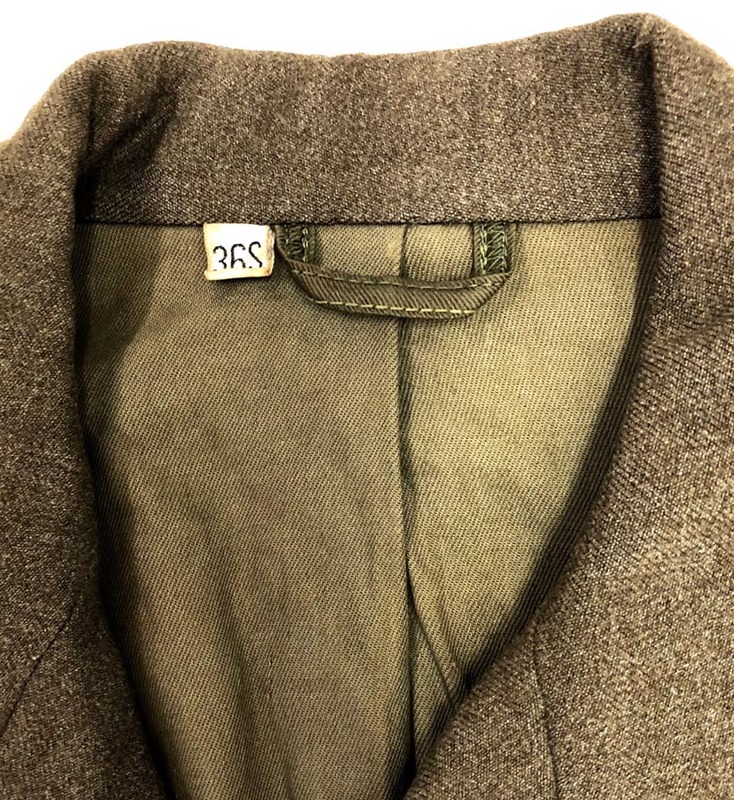 Jacket measures : chest 36", sleeve length 23" and length is 22 1/2". 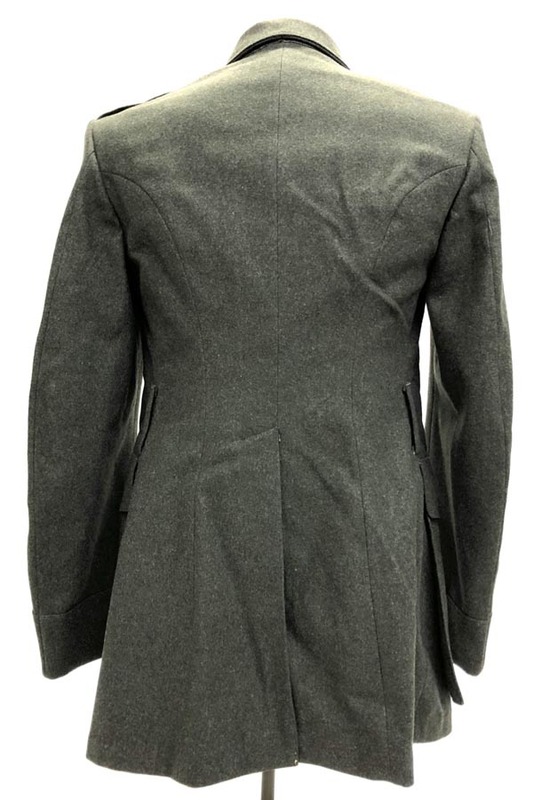 All buttons are present and snap function great. 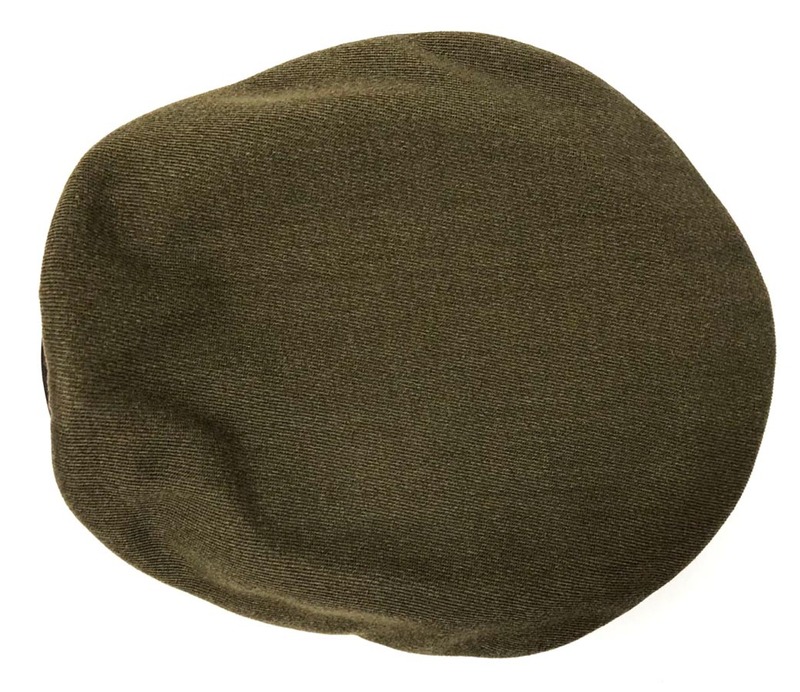 Nice dark chocolate brown color. 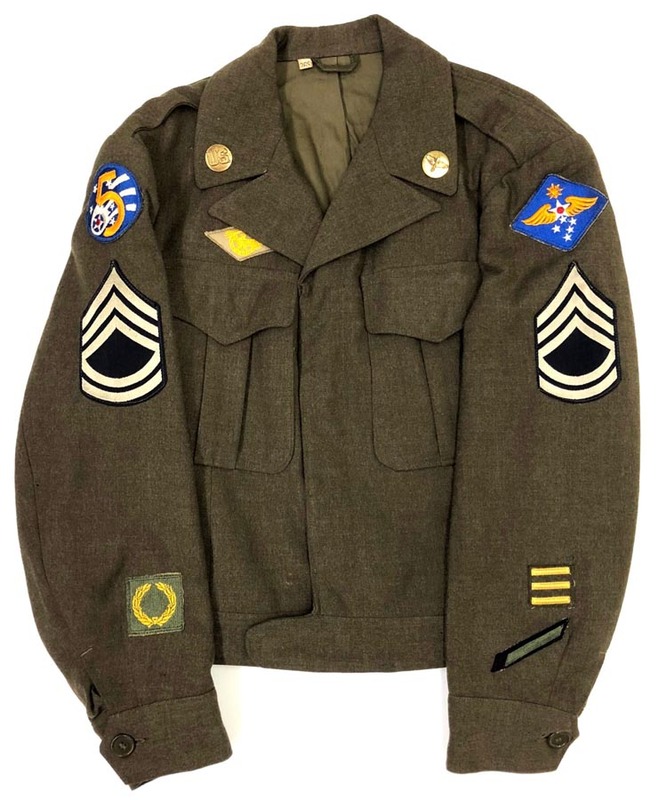 PHYSICAL DESCRIPTION: This WW2 US Army Air Force Ike Jacket with bullion patch is in nice condition. 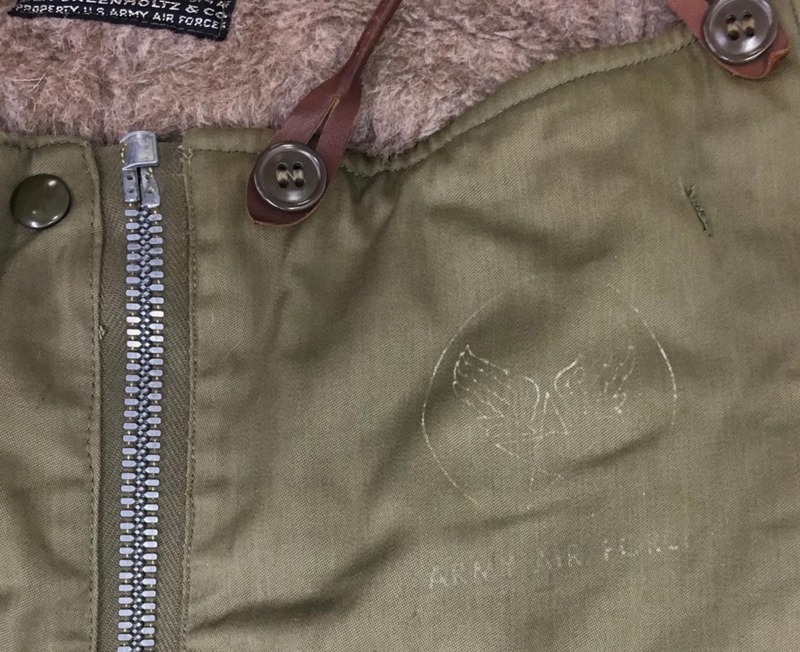 Jacket has a couple of pinhead size moth holes and one small repair about 3/8 of an inch across at back of neck, hardly noticeable at all. 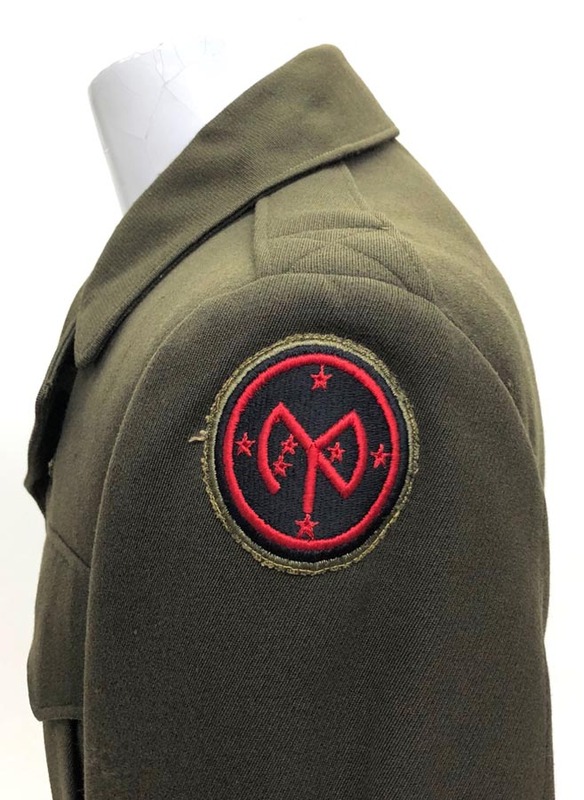 All insignia is period sewn to jacket. 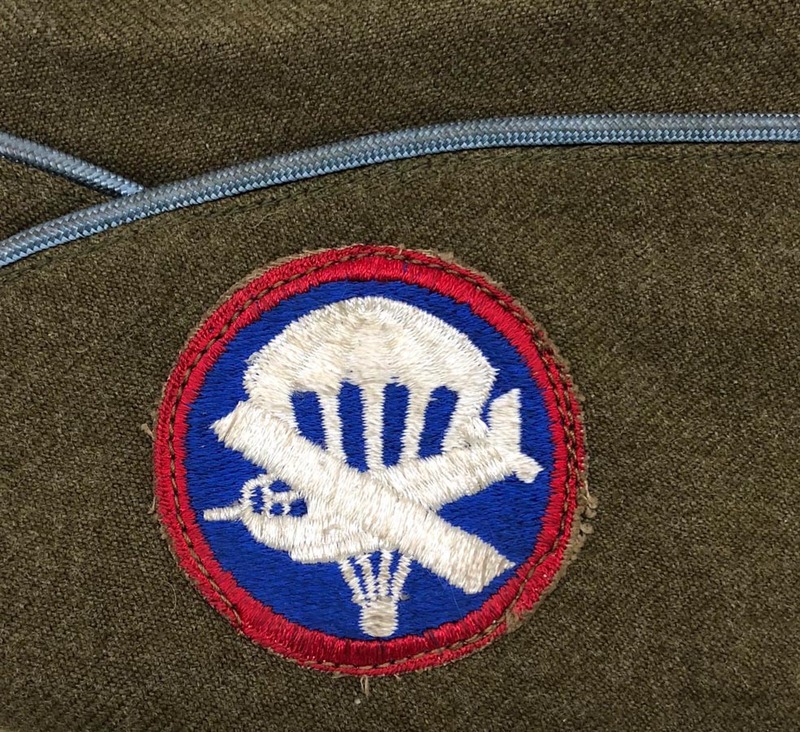 Bullion AAF patch is real nice. 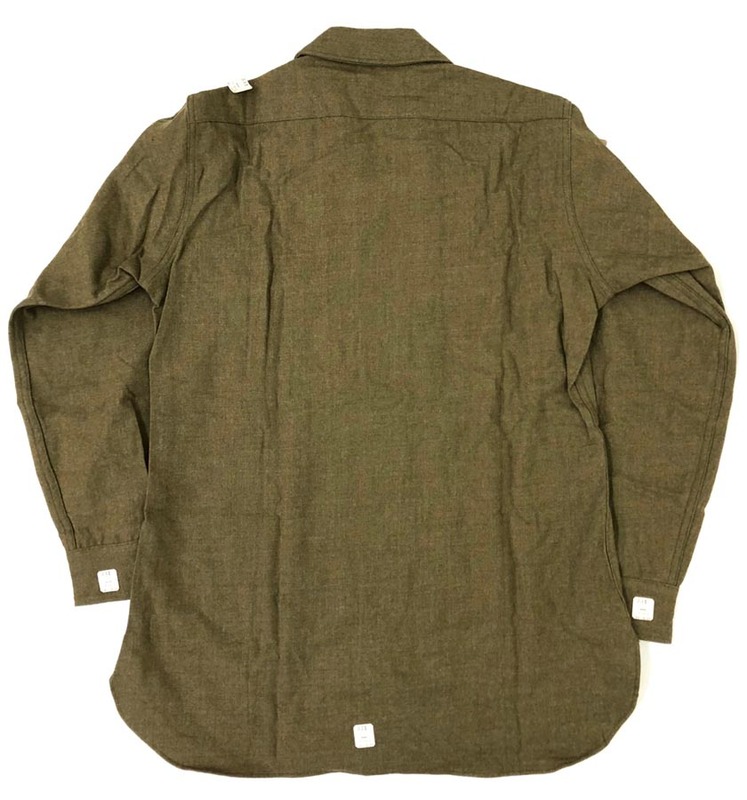 Jacket measures: chest 34", sleeve length 24" and length is 22 1/2". 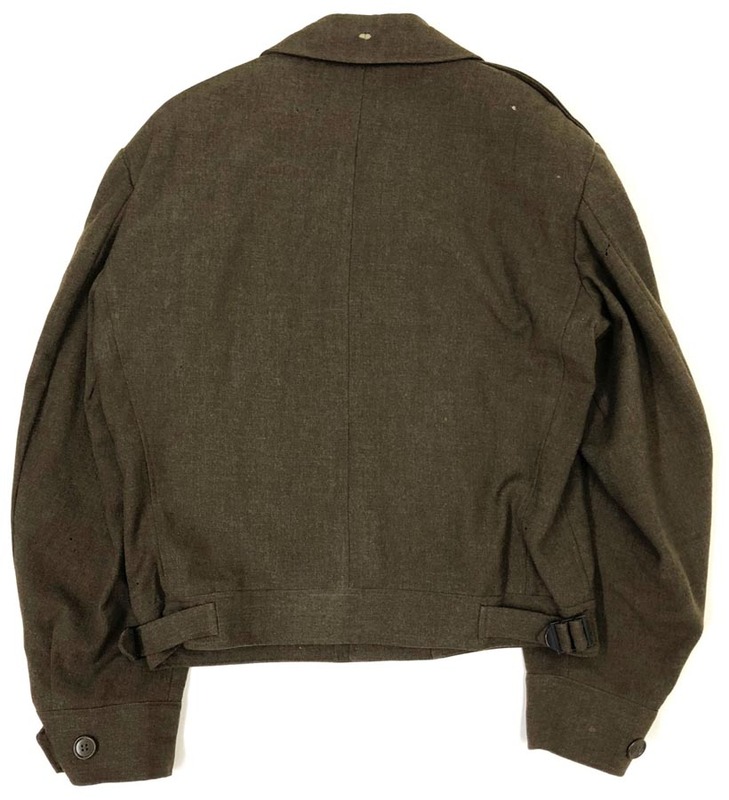 PHYSICAL DESCRIPTION: This WW2 US Army Air Force Ike Jacket is in fair condition showing some mothing. 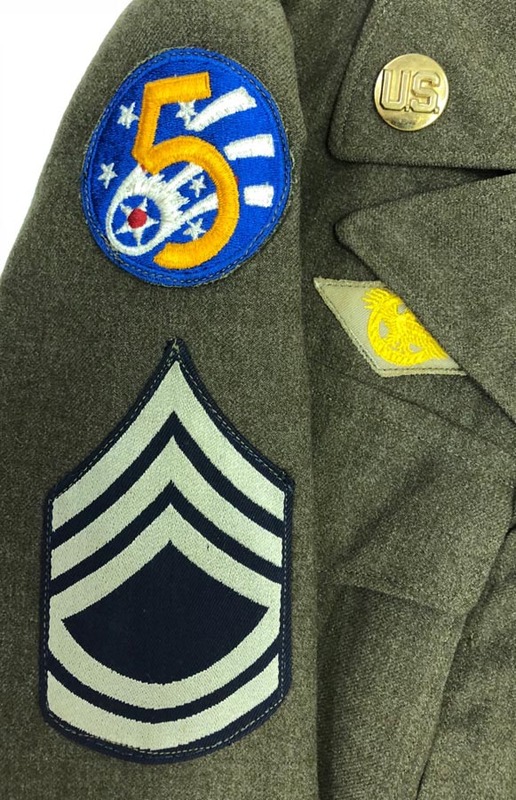 All insignia is period sewn on. 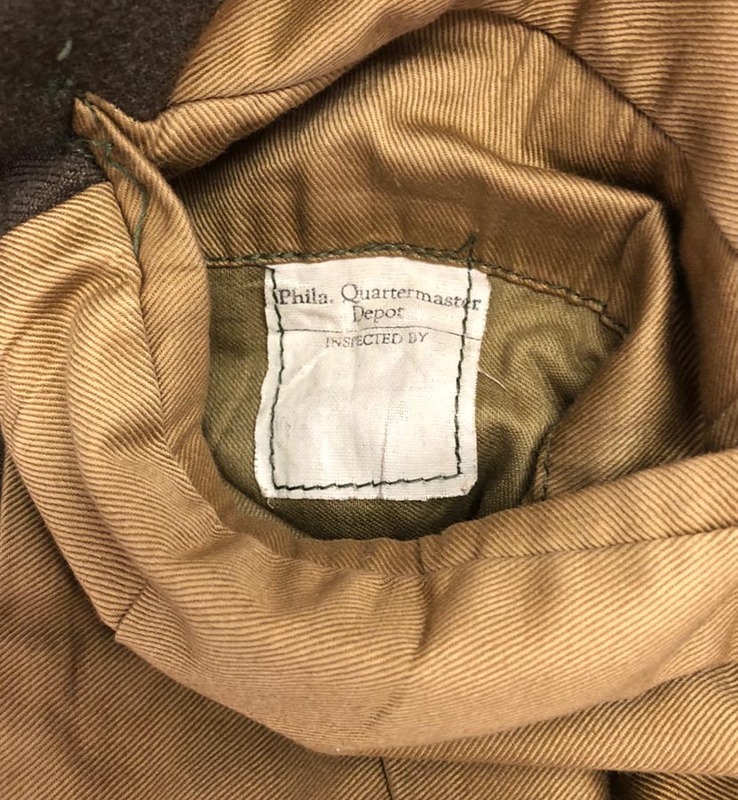 Jacket also comes with four ribbon bars that were found in the pocket. 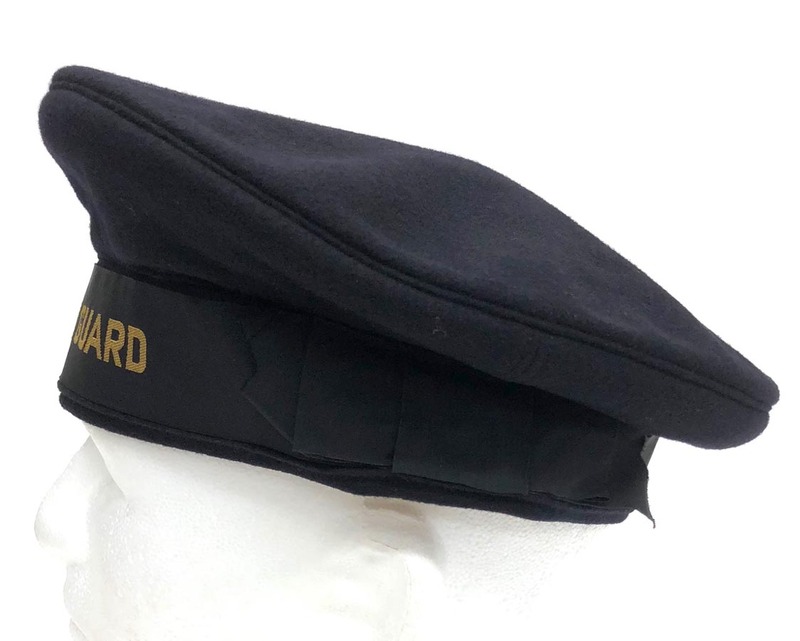 All buttons are presented and lower snap functions great. 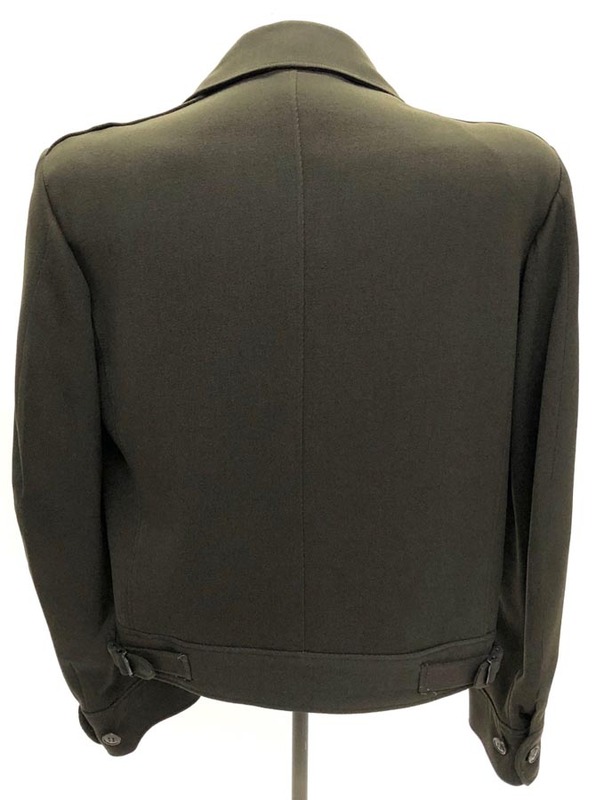 Jacket measures: chest 36", sleeve length 23" and length is 22". 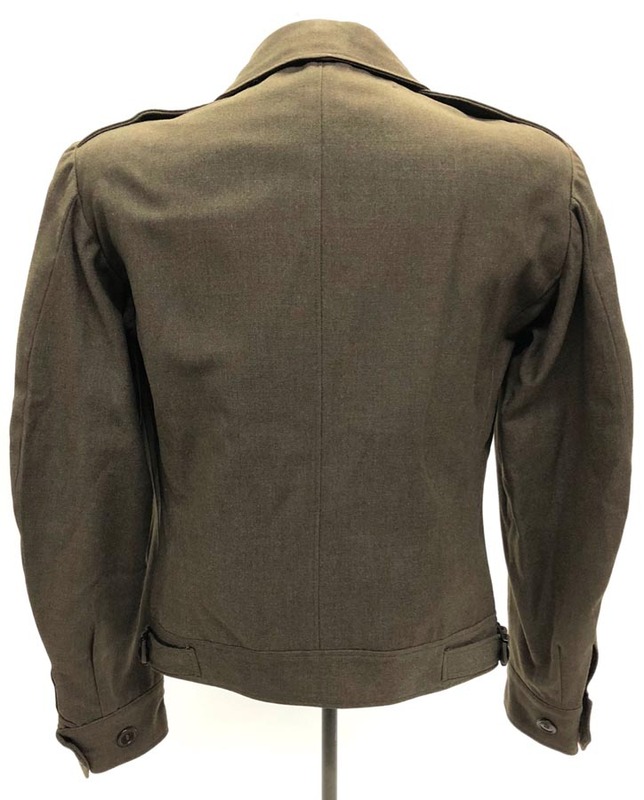 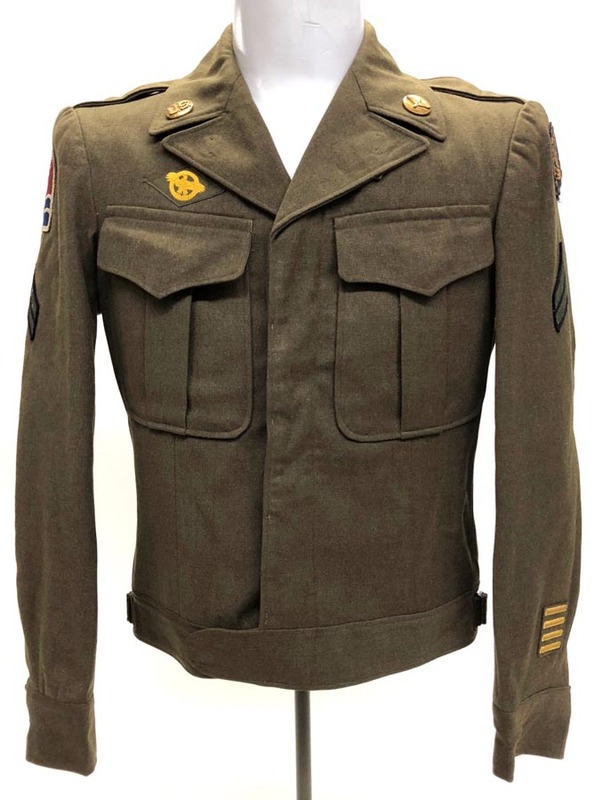 PHYSICAL DESCRIPTION: This WW2 US Army Europe Ike Jacket is in nice condition showing some light age. 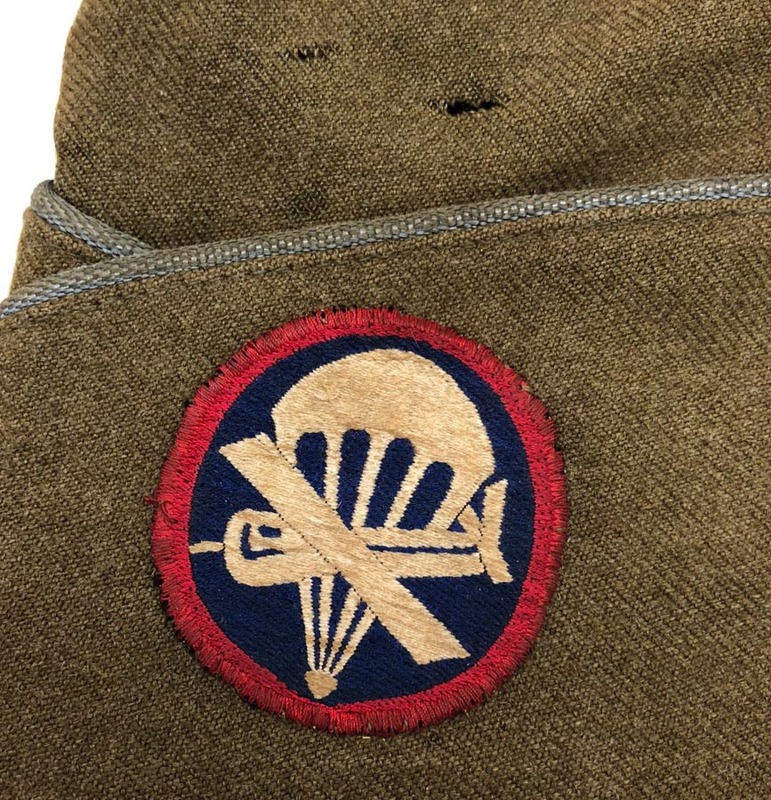 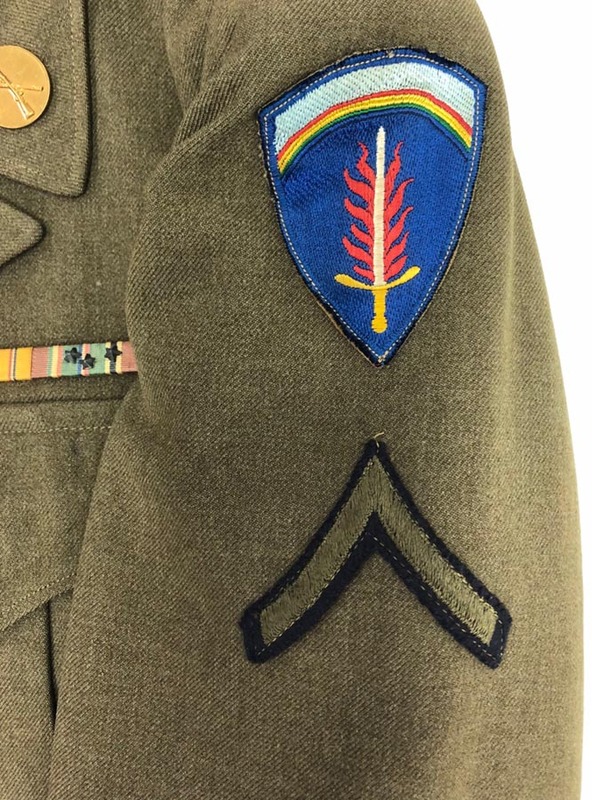 The U.S. Army Europe patch is theater made. 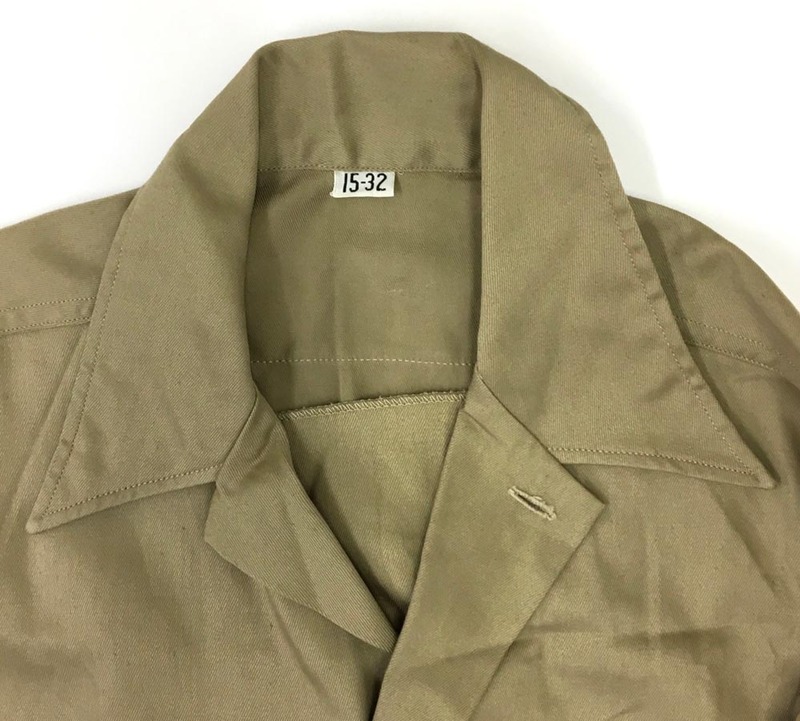 Jacket measures: chest 38", sleeve length is 23 1/2" and length is 21". 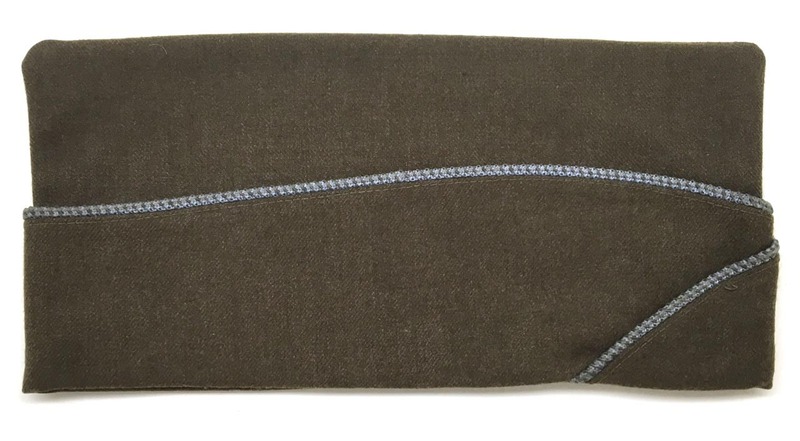 All buttons are present and lower snap functions great. 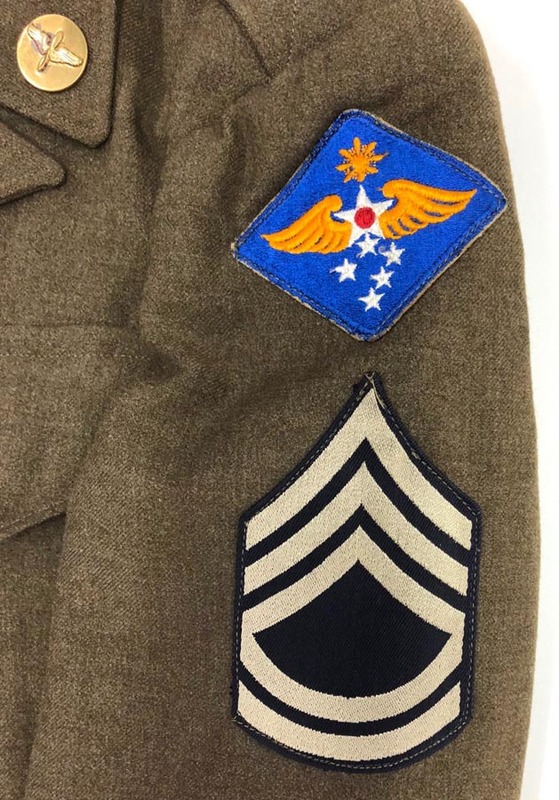 All insignia is period sewn on.